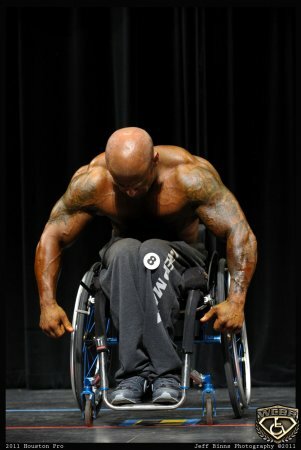 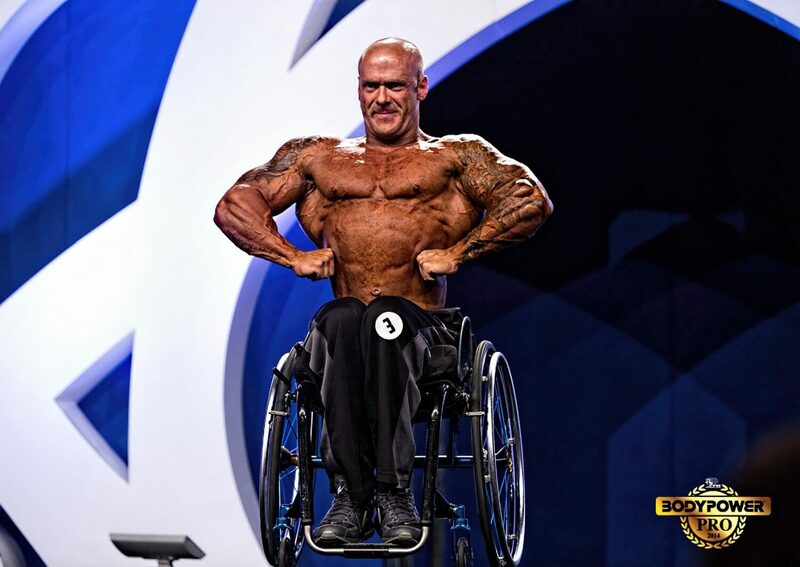 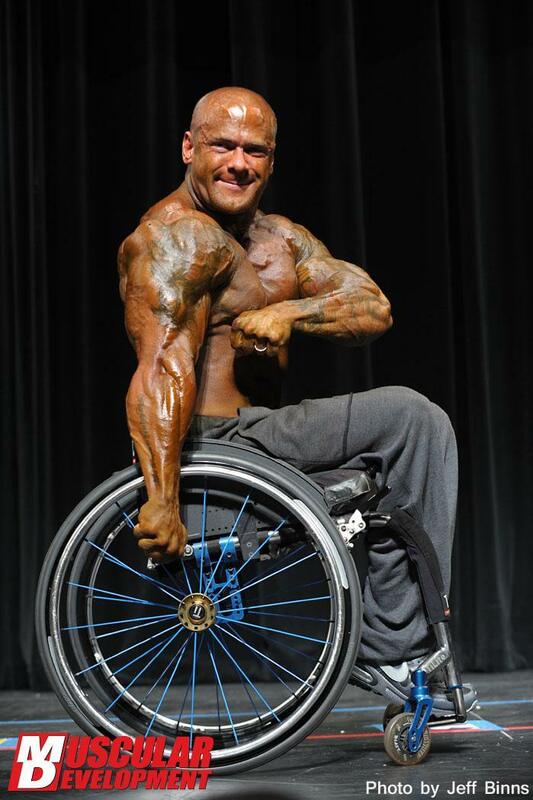 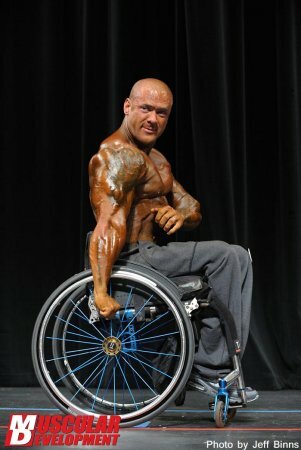 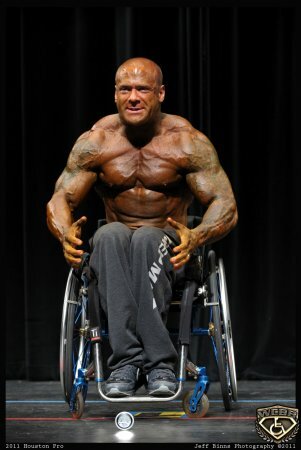 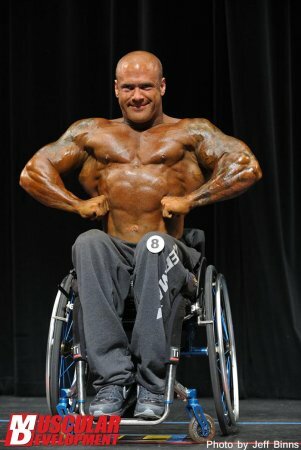 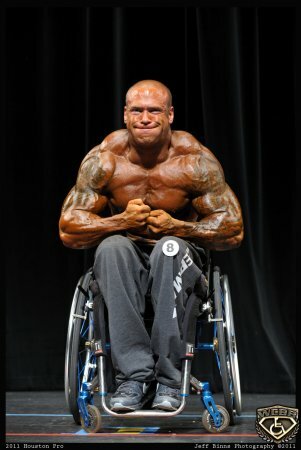 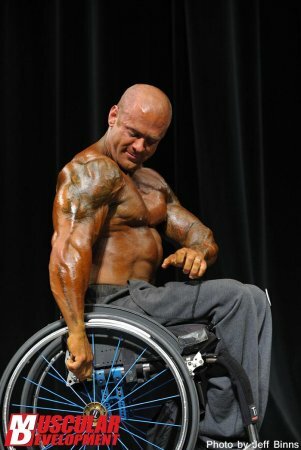 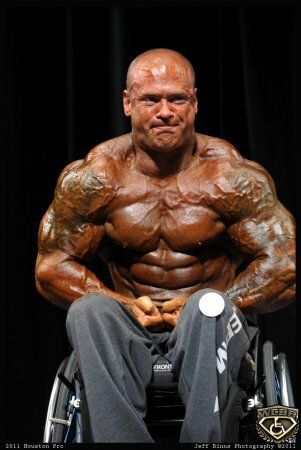 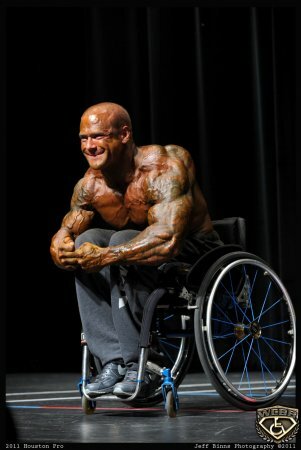 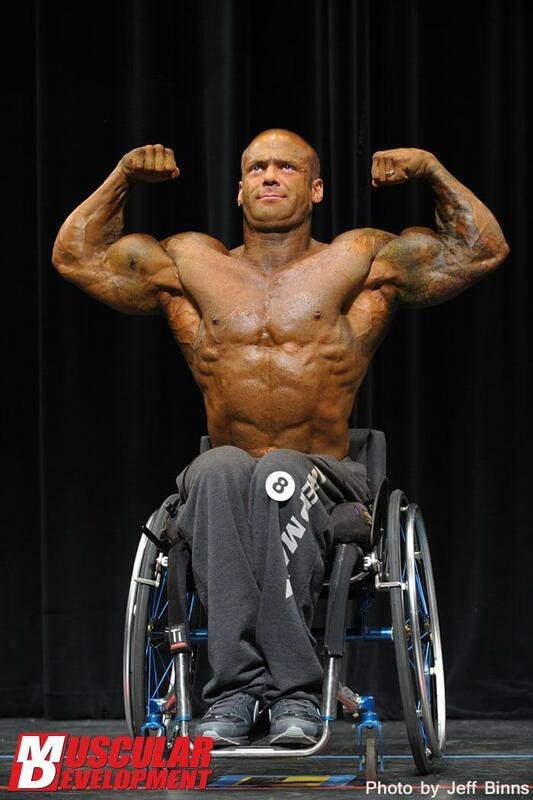 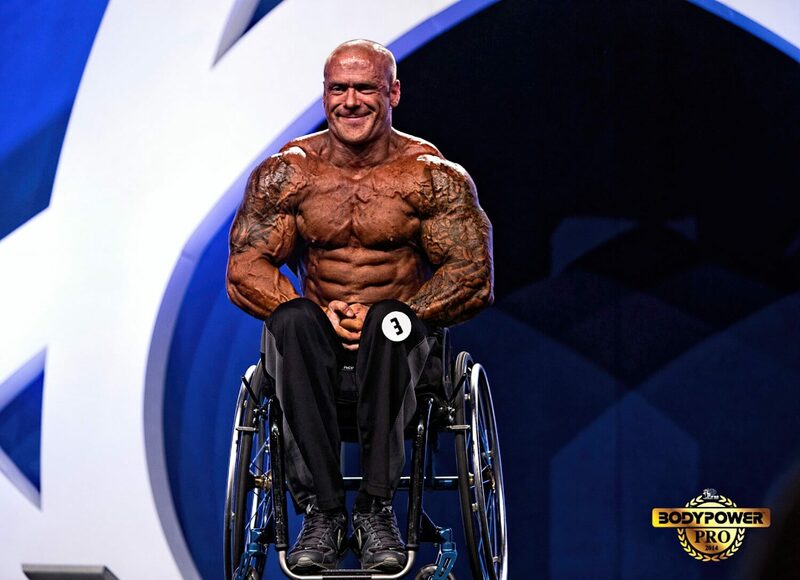 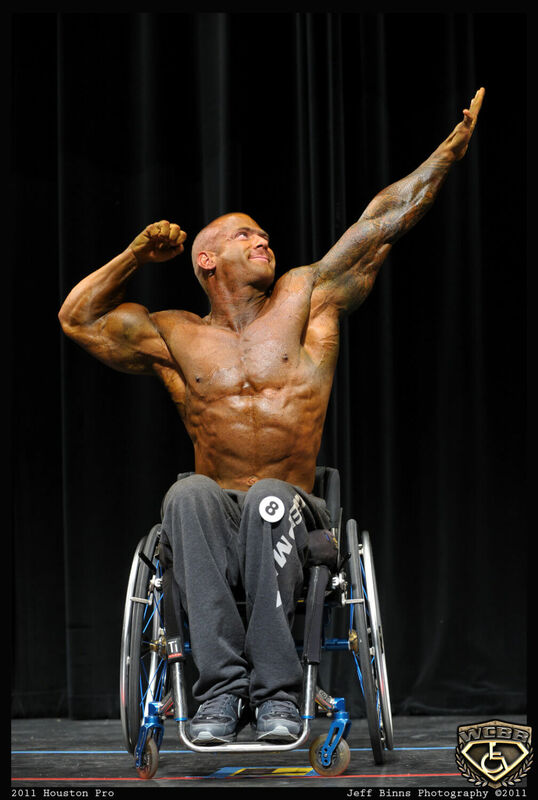 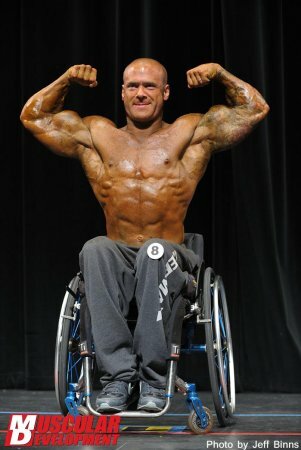 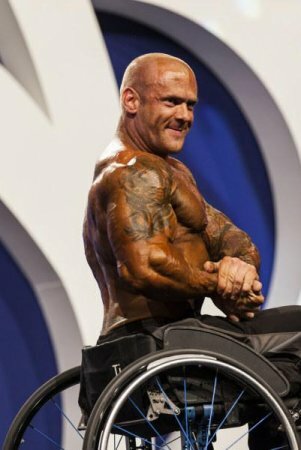 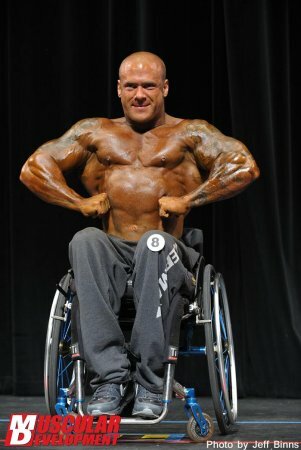 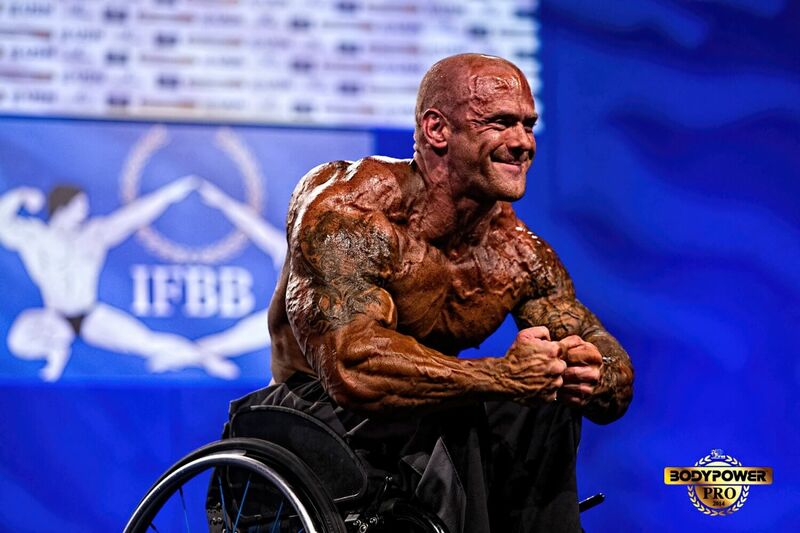 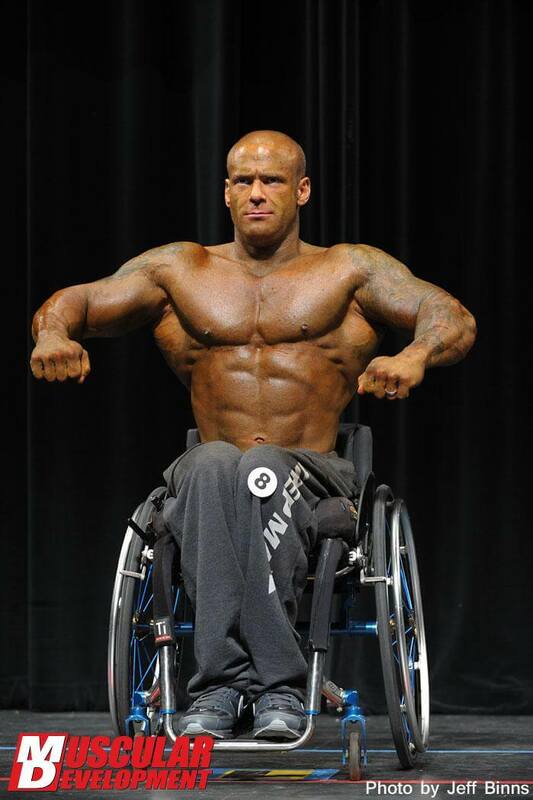 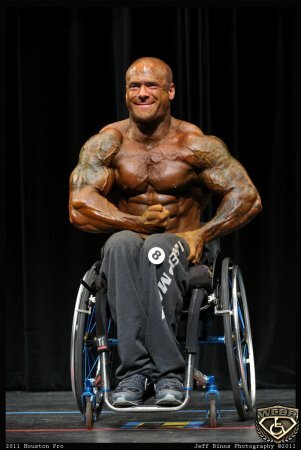 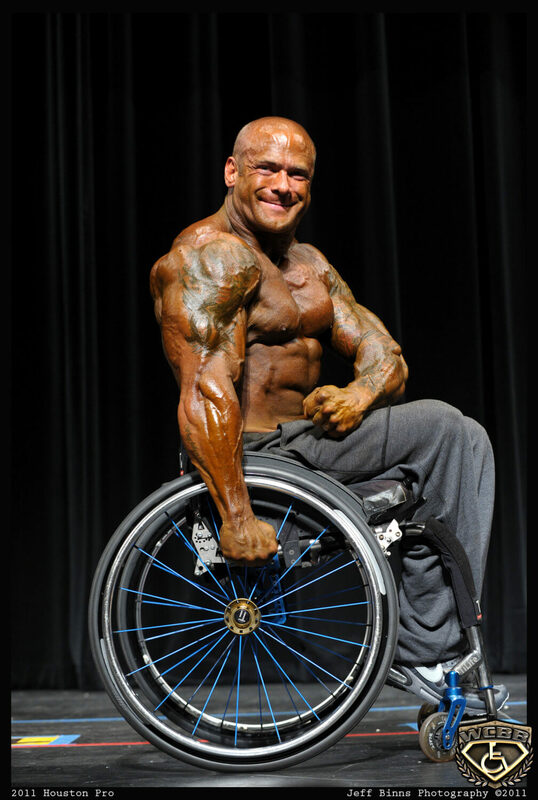 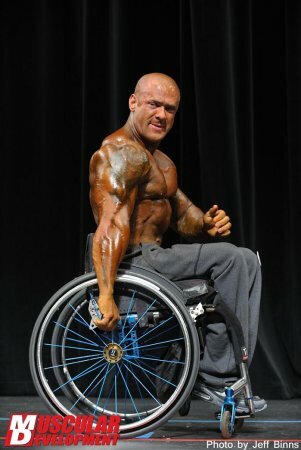 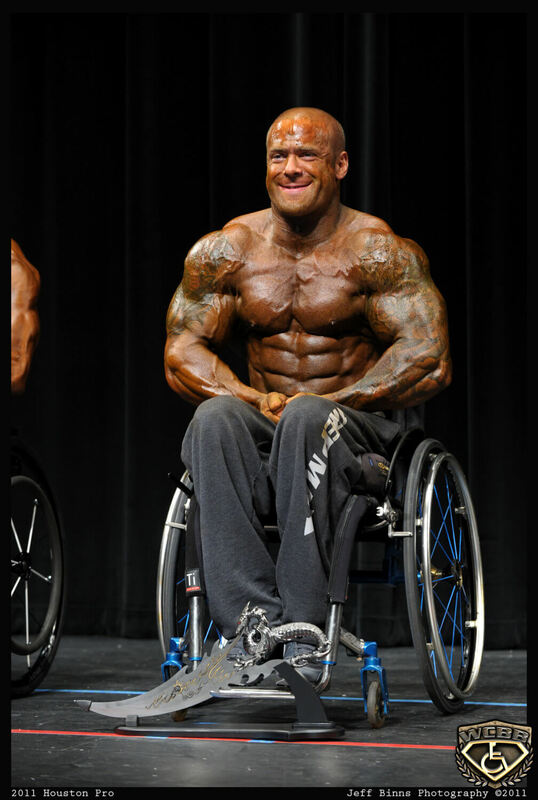 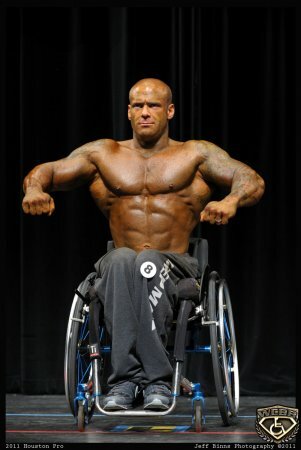 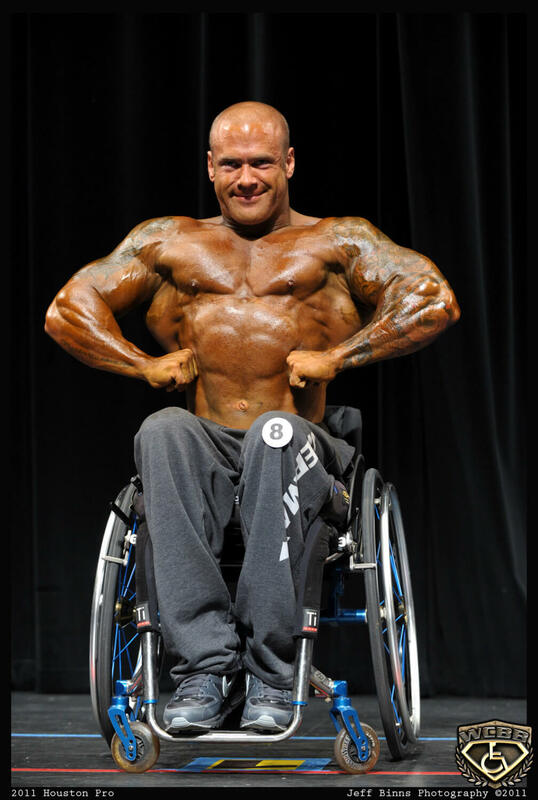 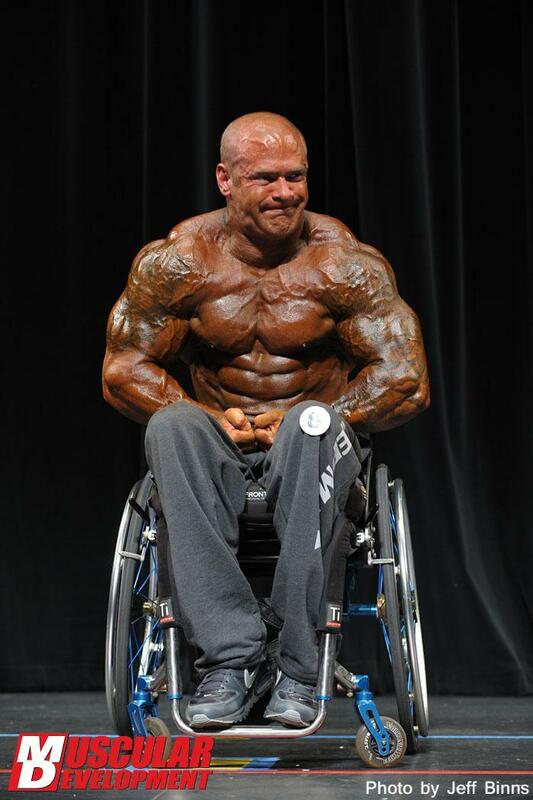 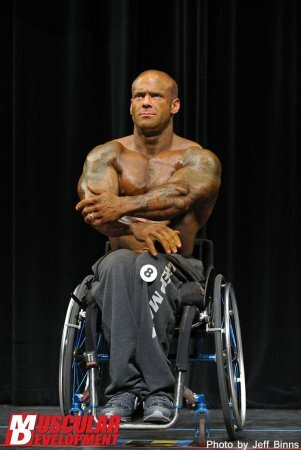 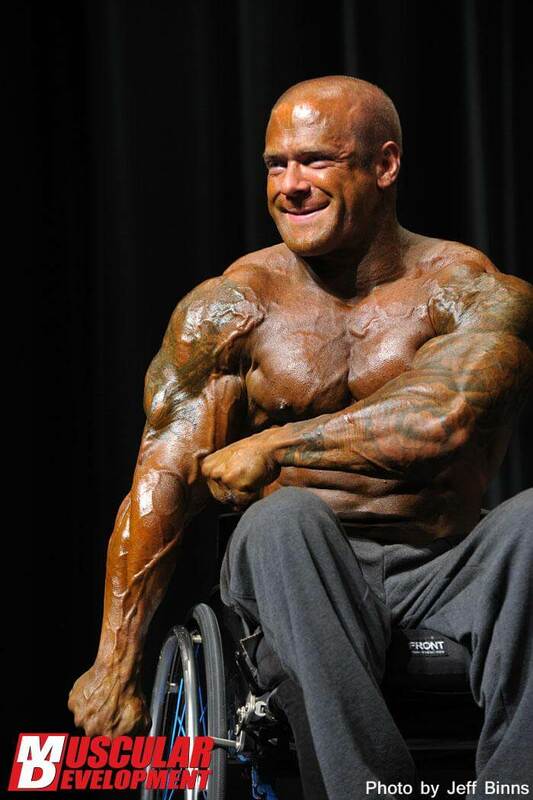 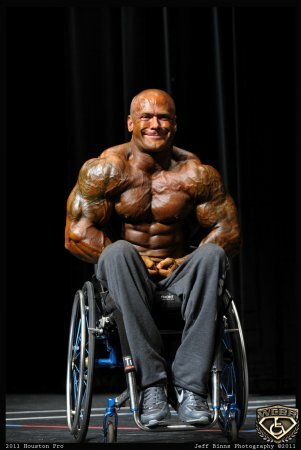 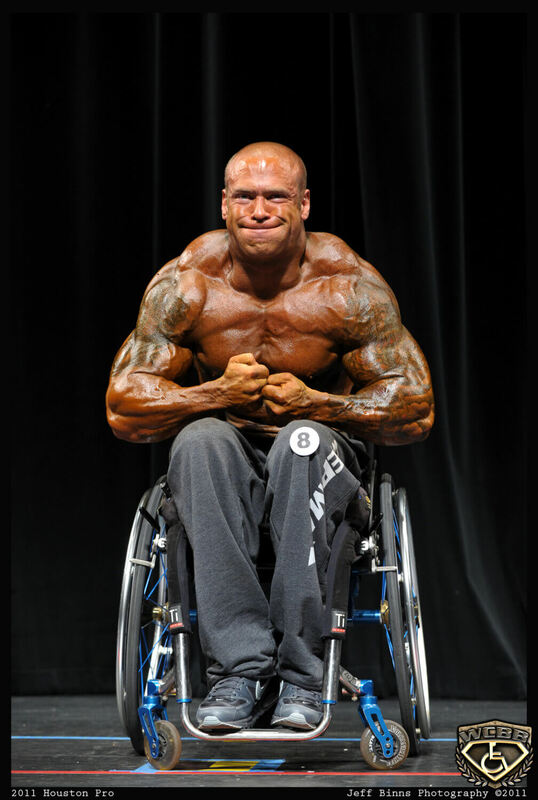 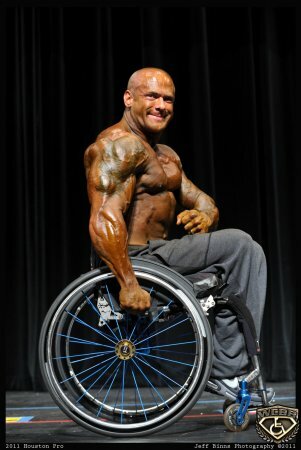 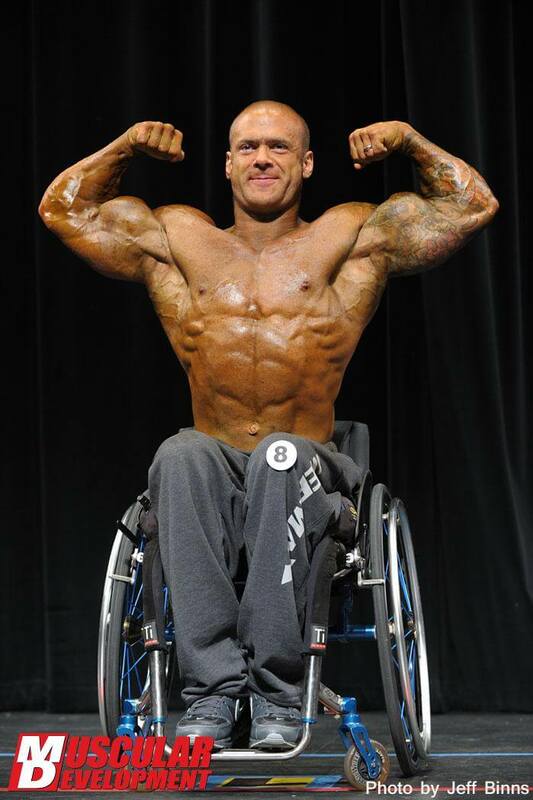 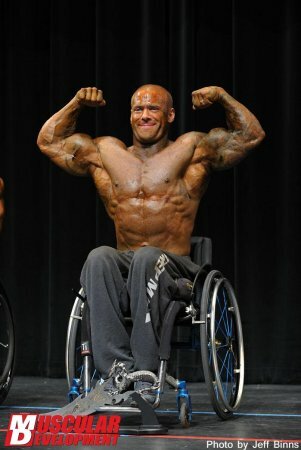 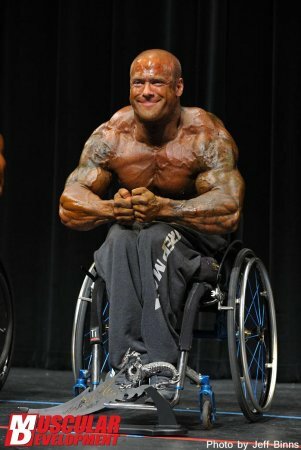 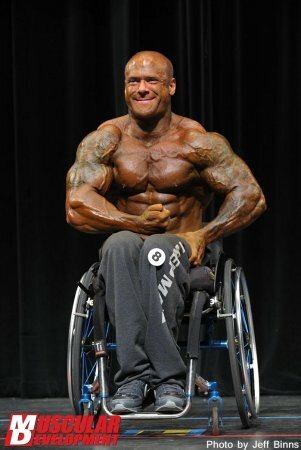 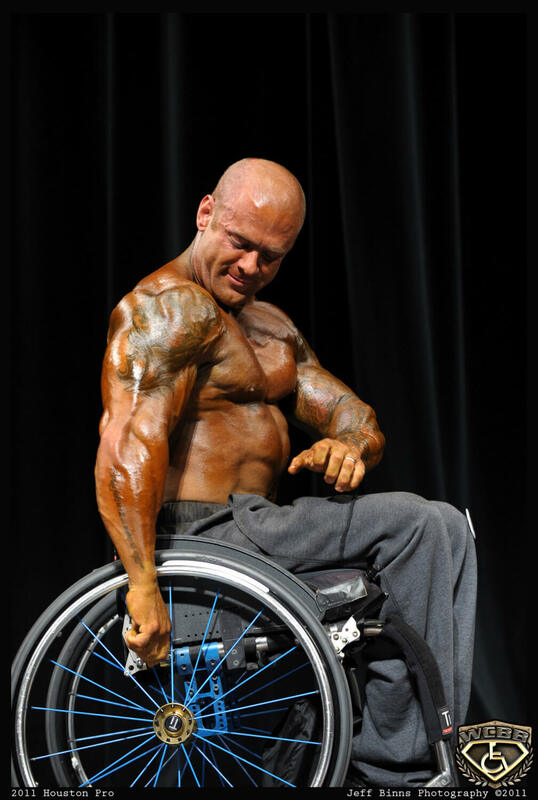 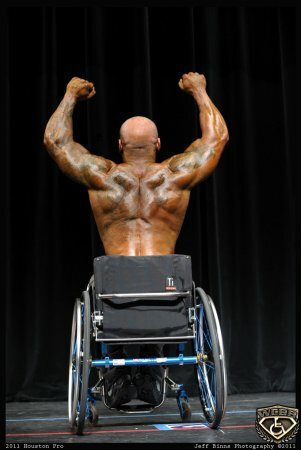 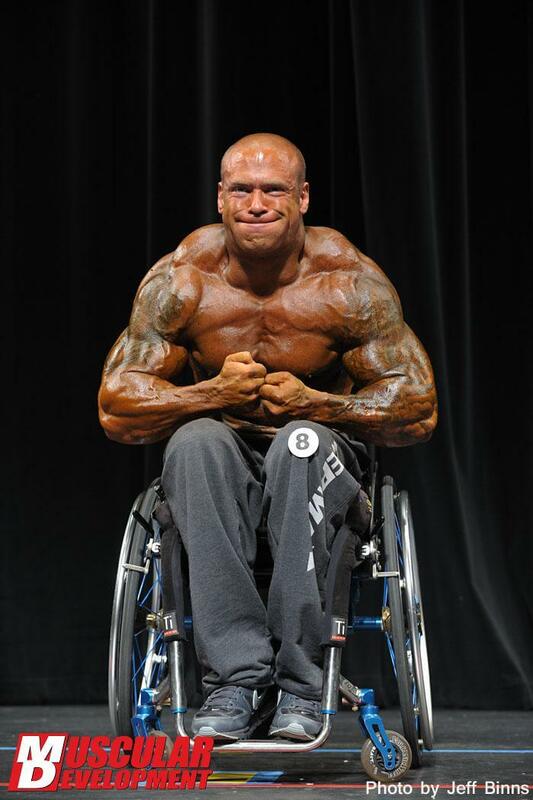 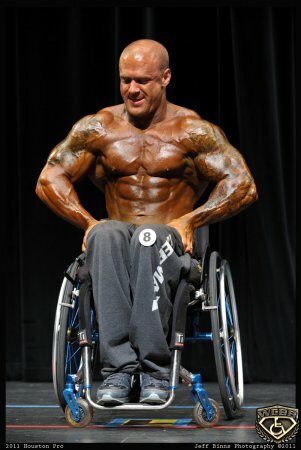 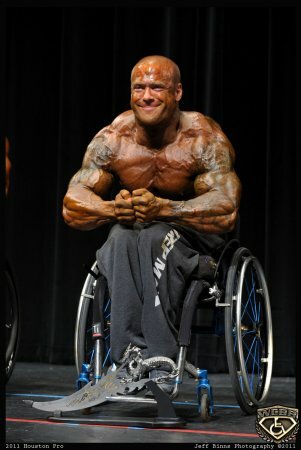 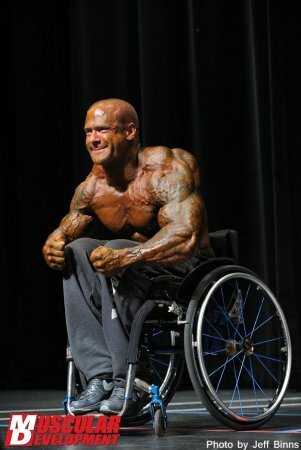 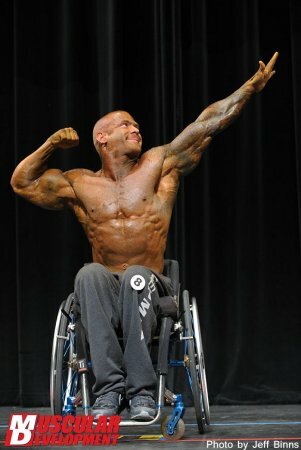 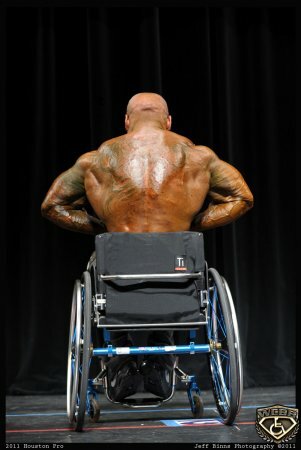 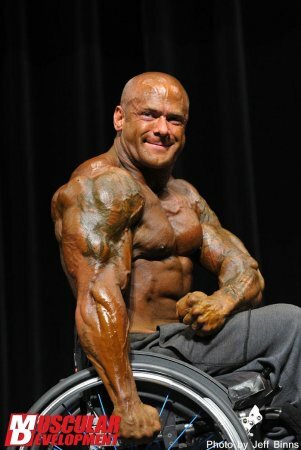 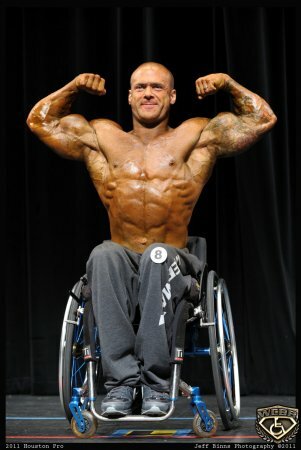 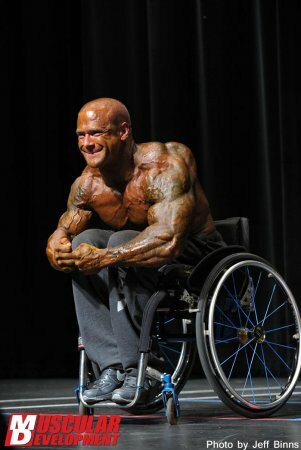 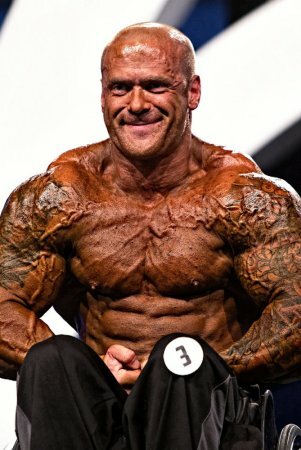 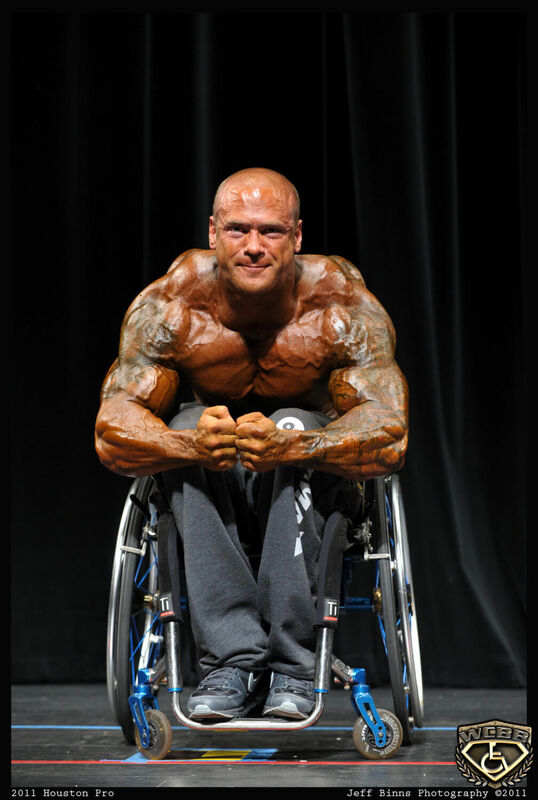 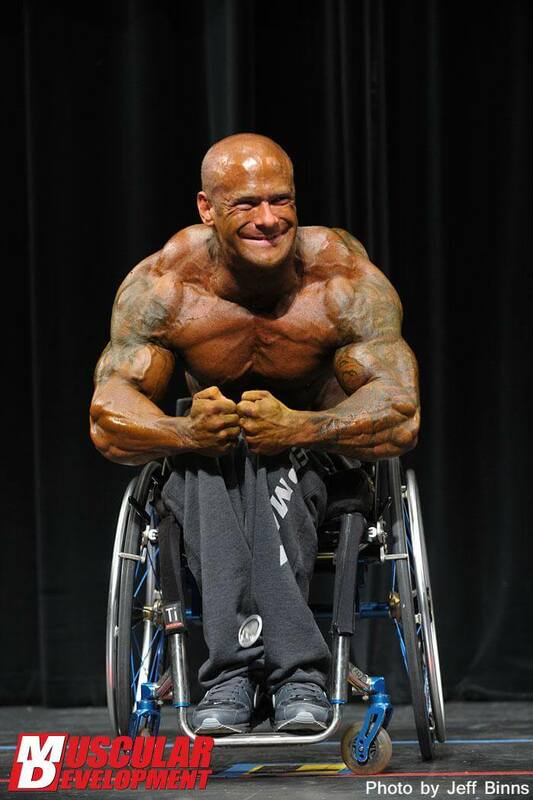 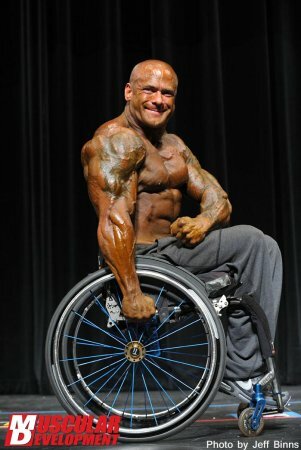 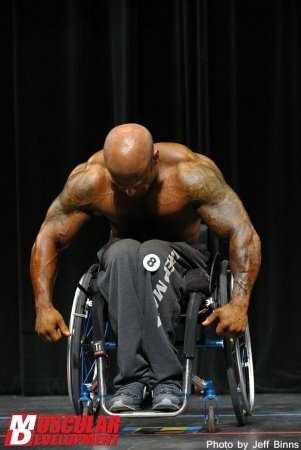 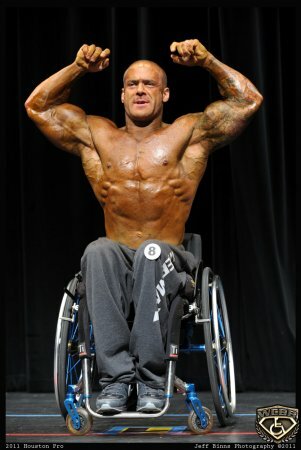 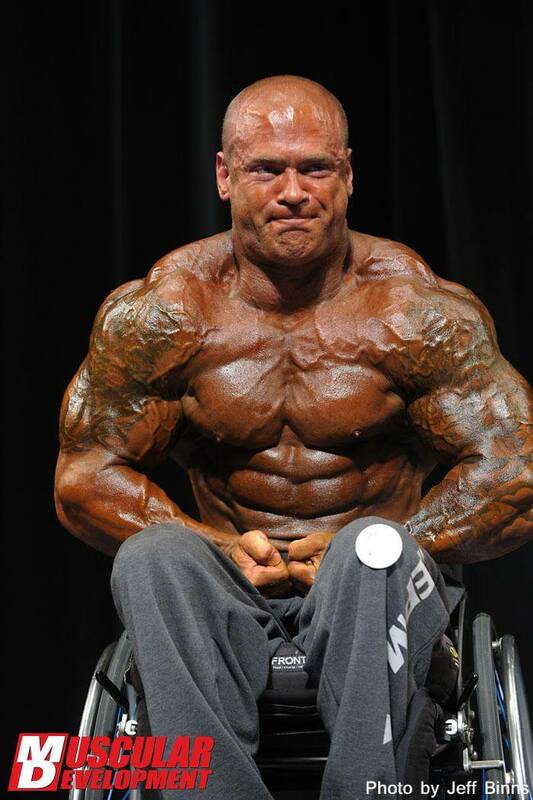 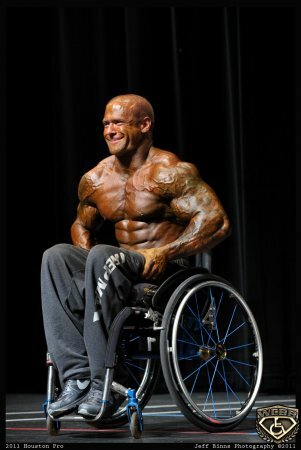 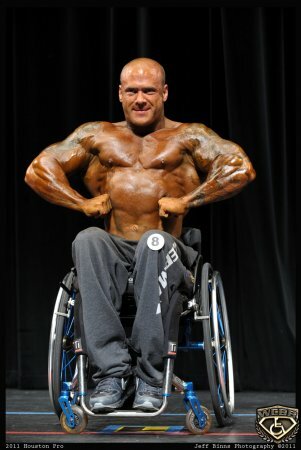 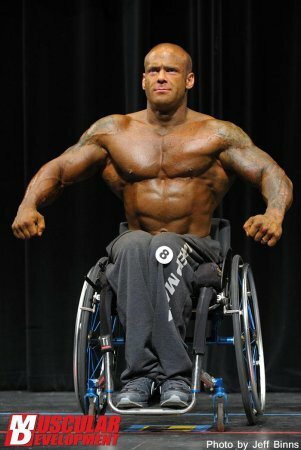 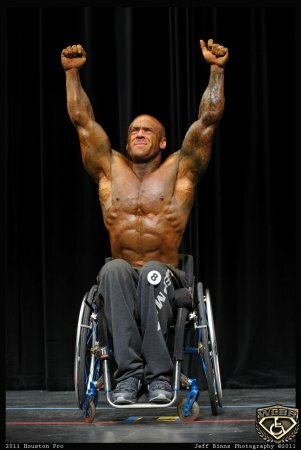 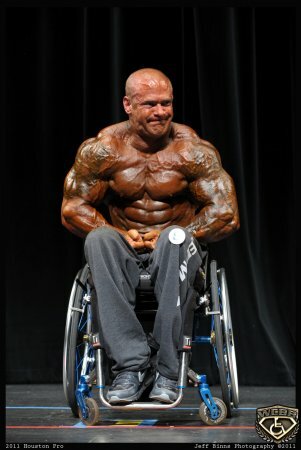 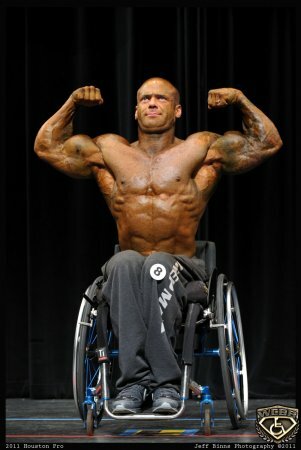 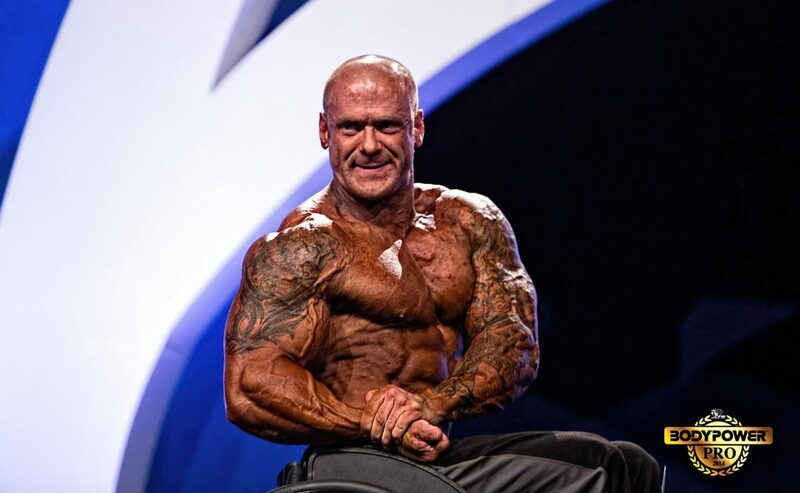 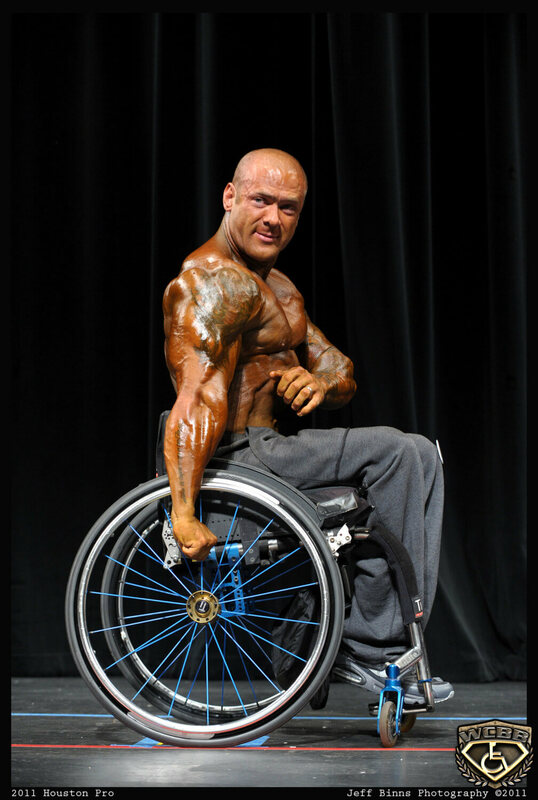 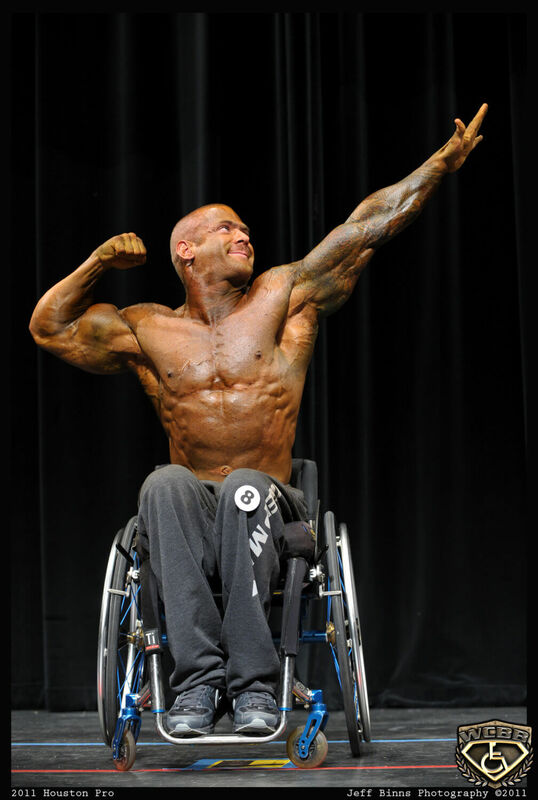 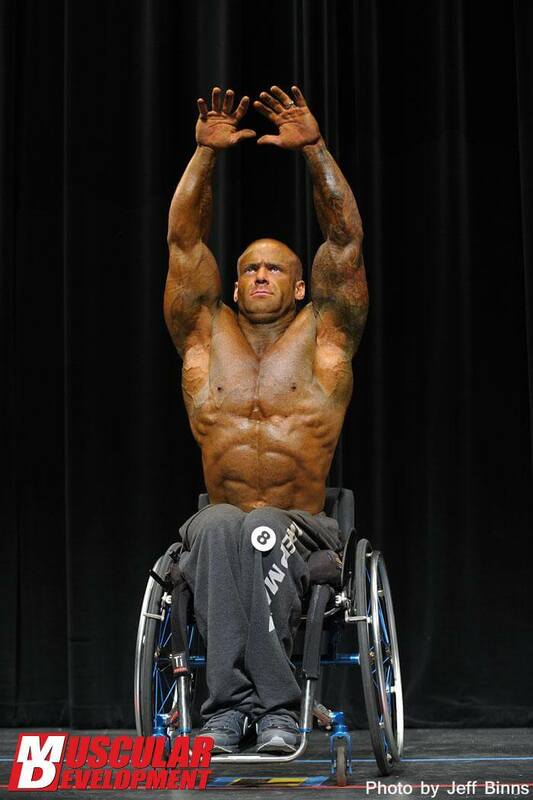 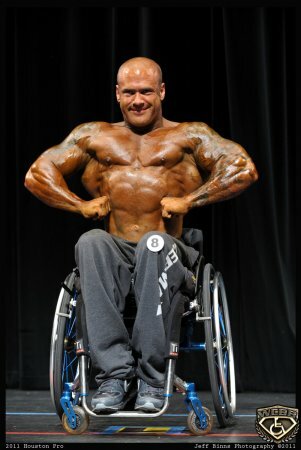 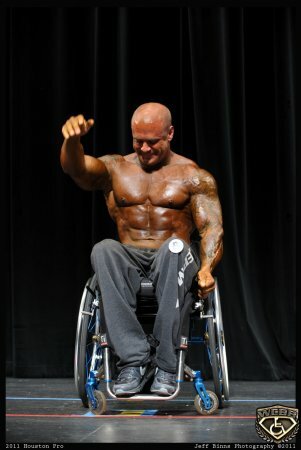 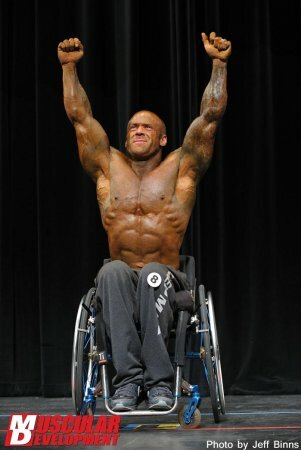 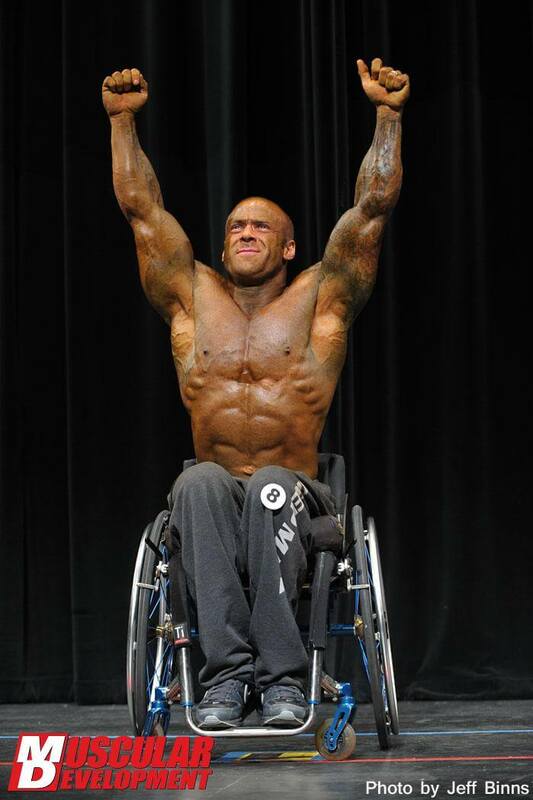 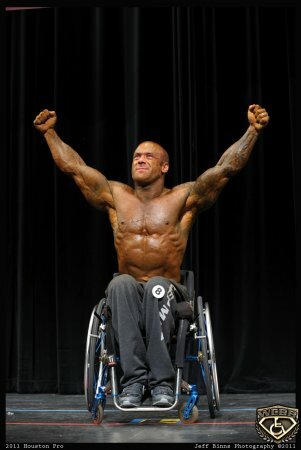 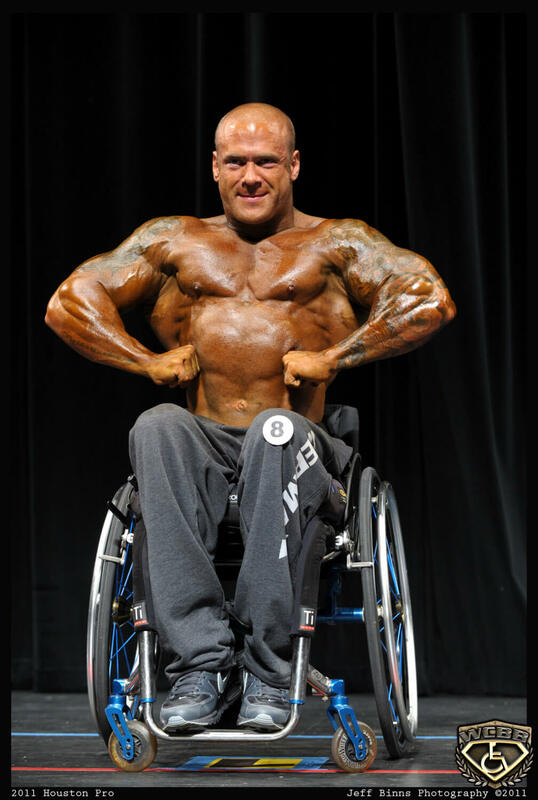 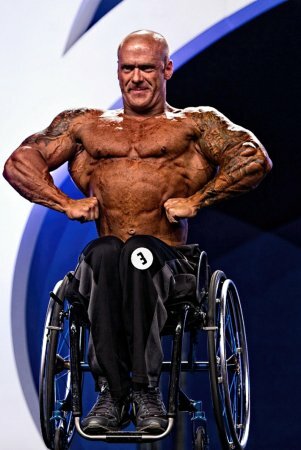 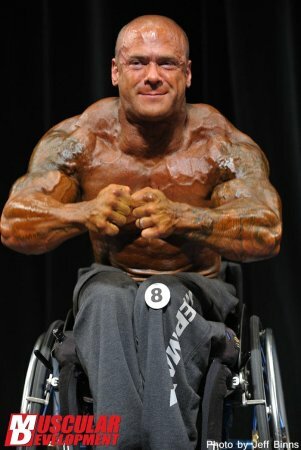 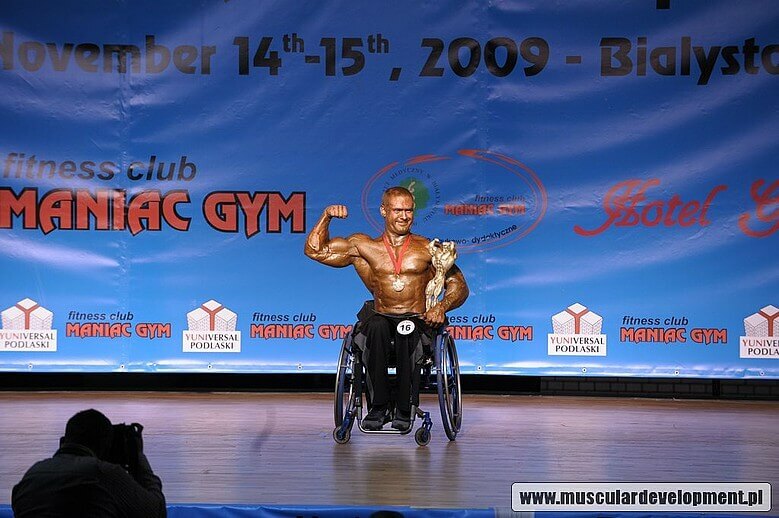 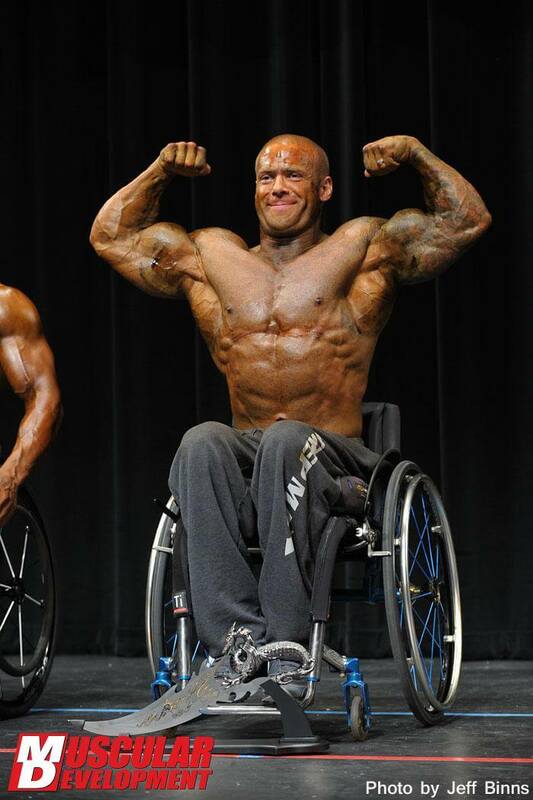 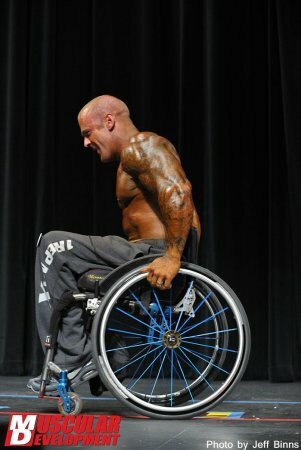 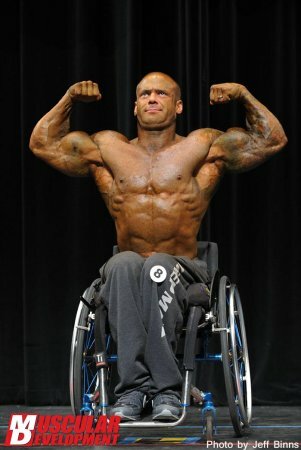 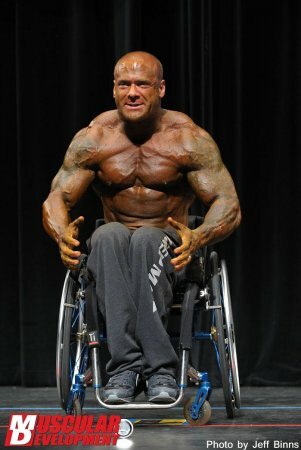 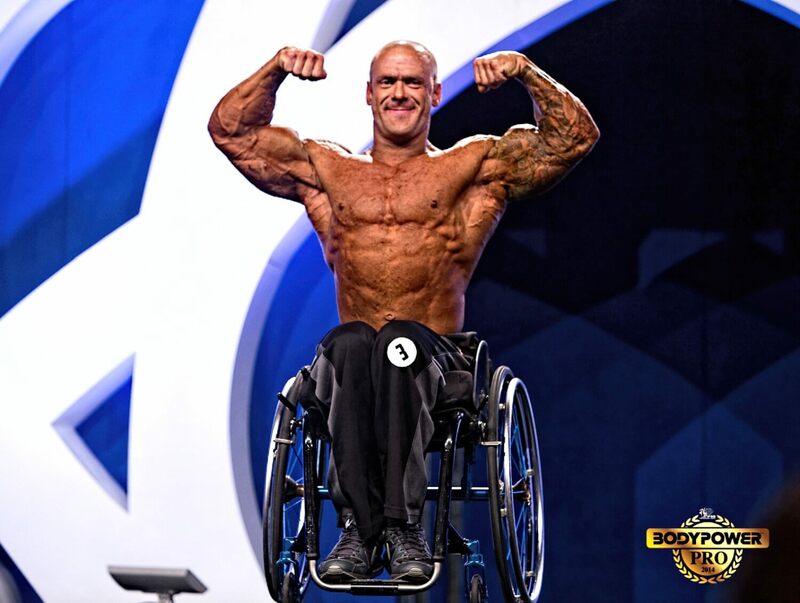 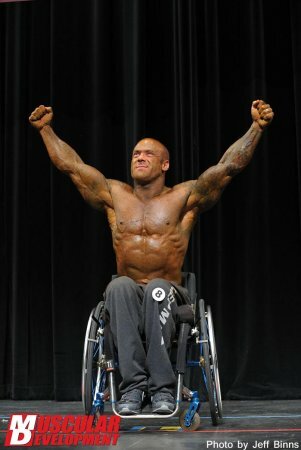 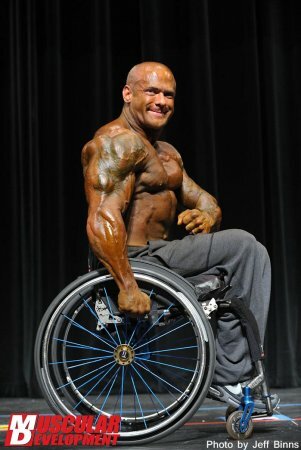 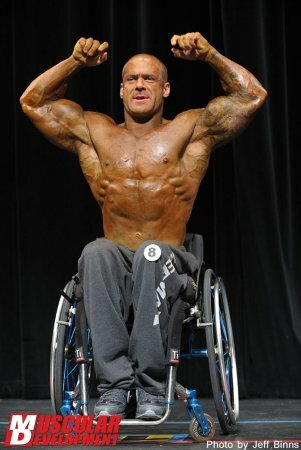 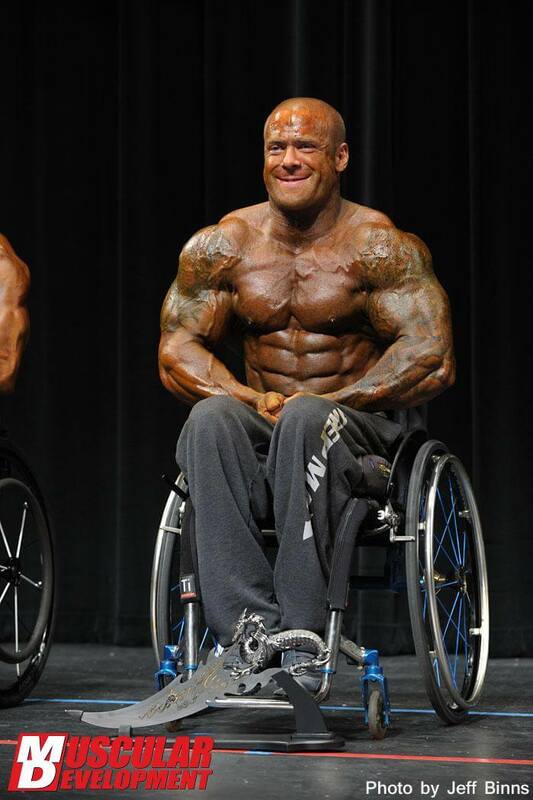 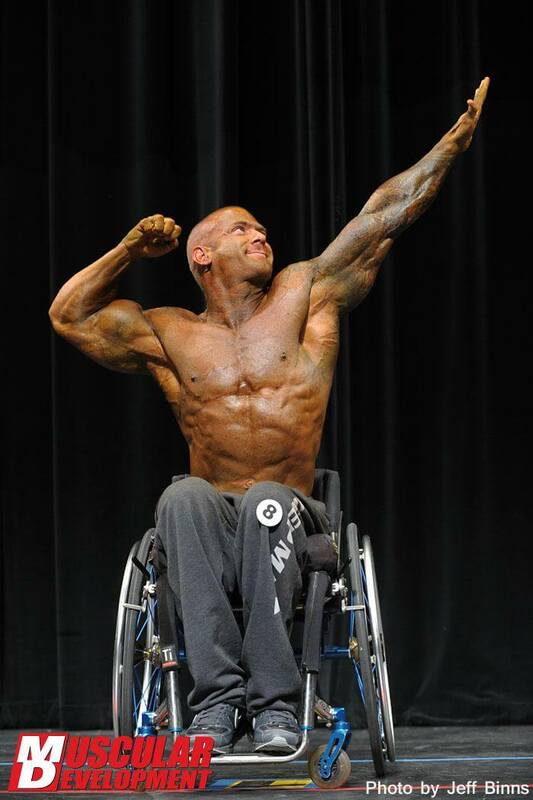 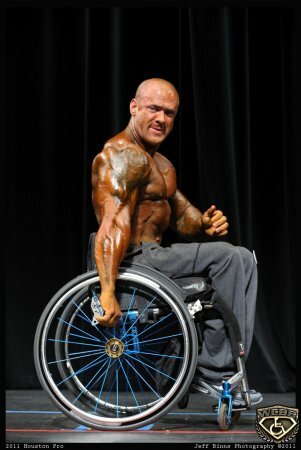 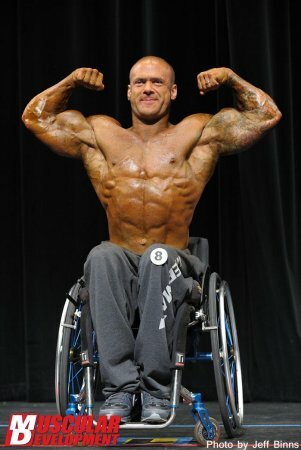 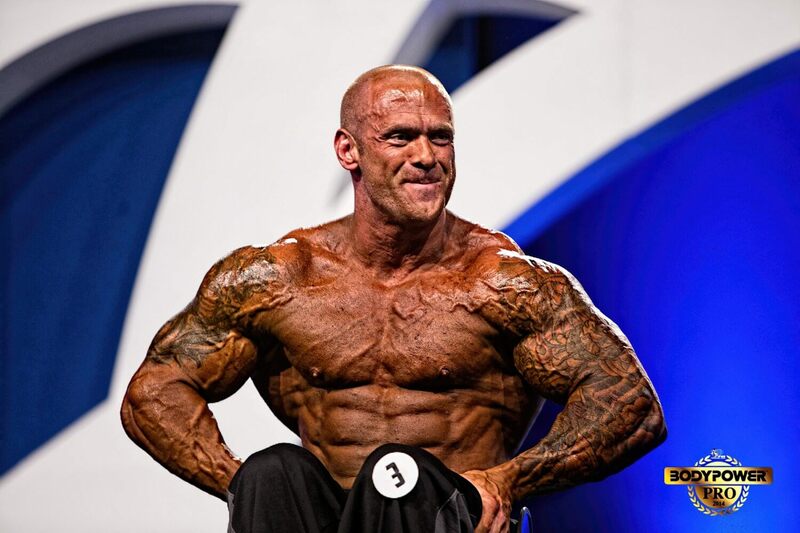 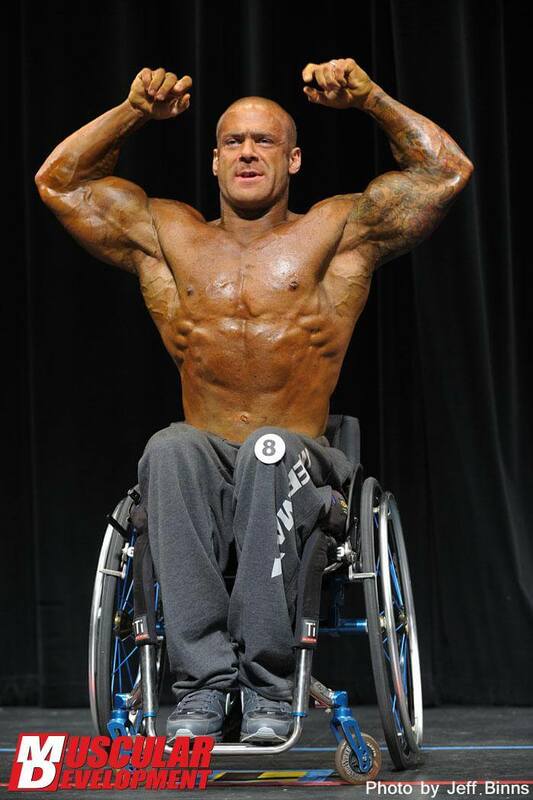 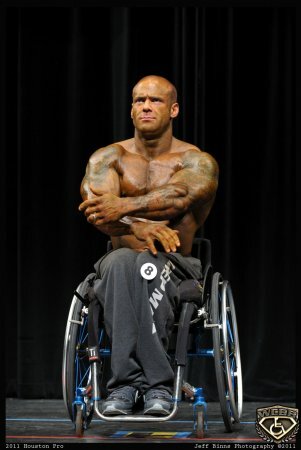 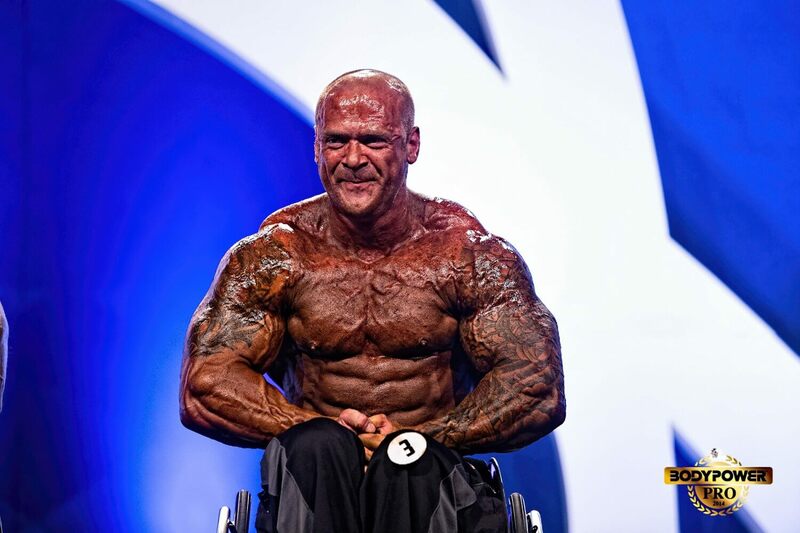 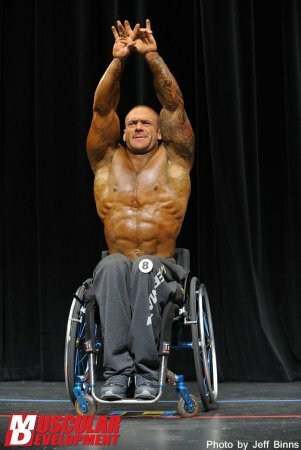 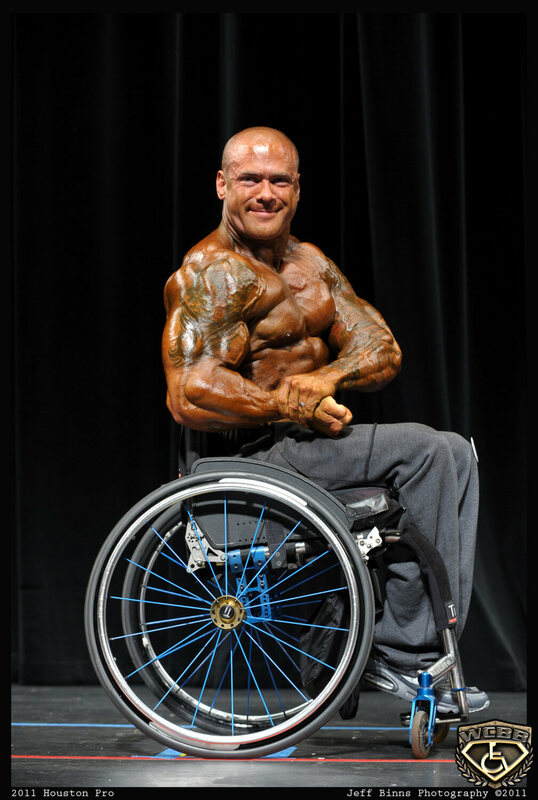 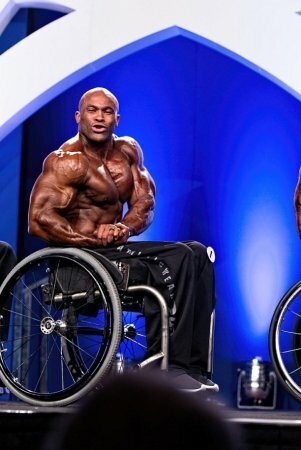 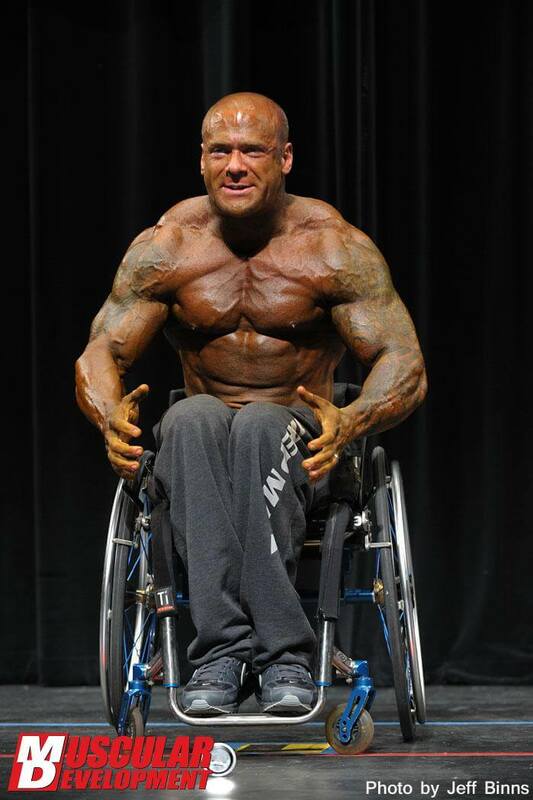 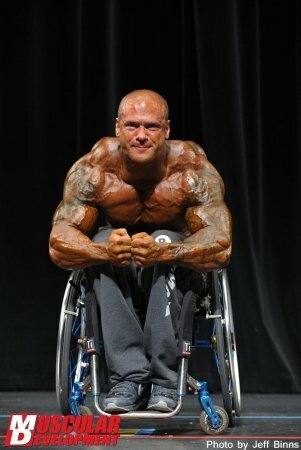 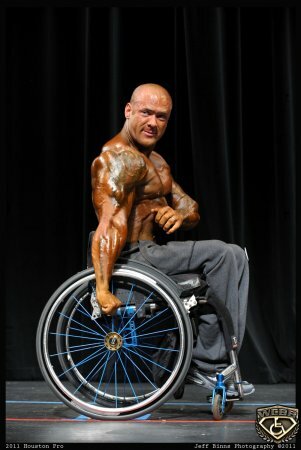 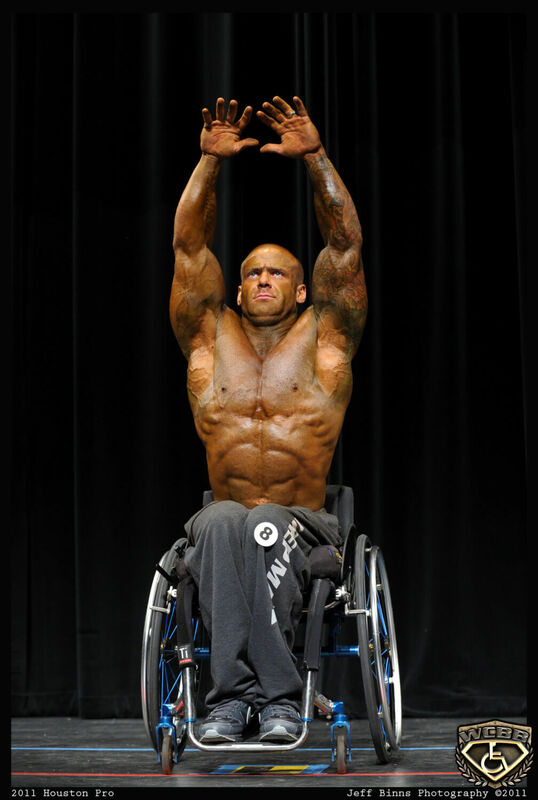 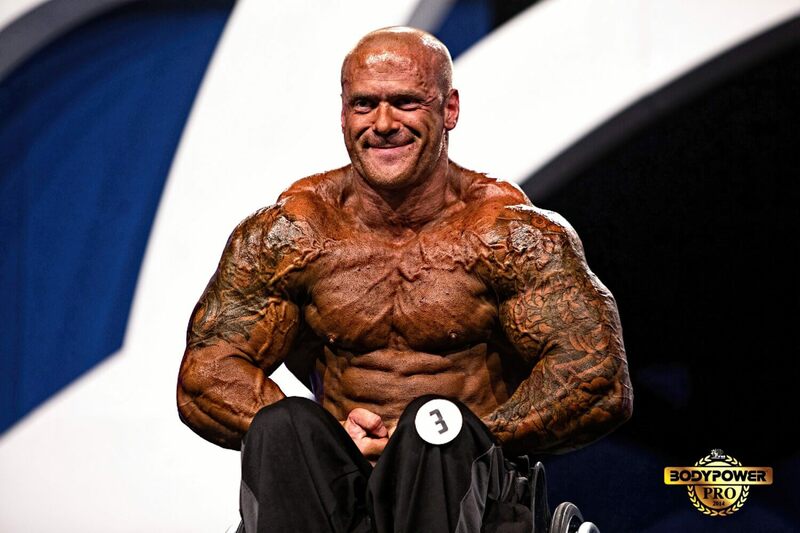 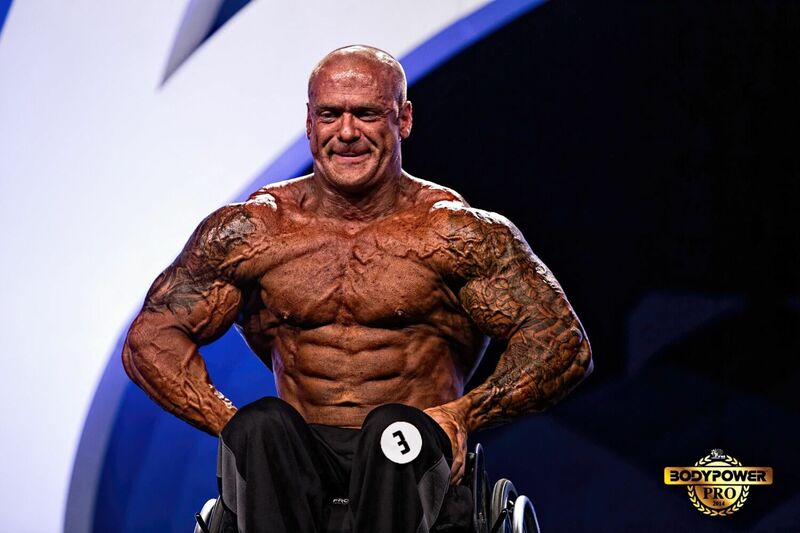 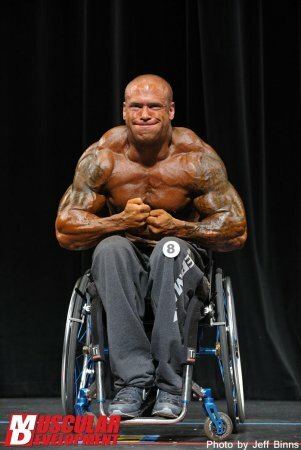 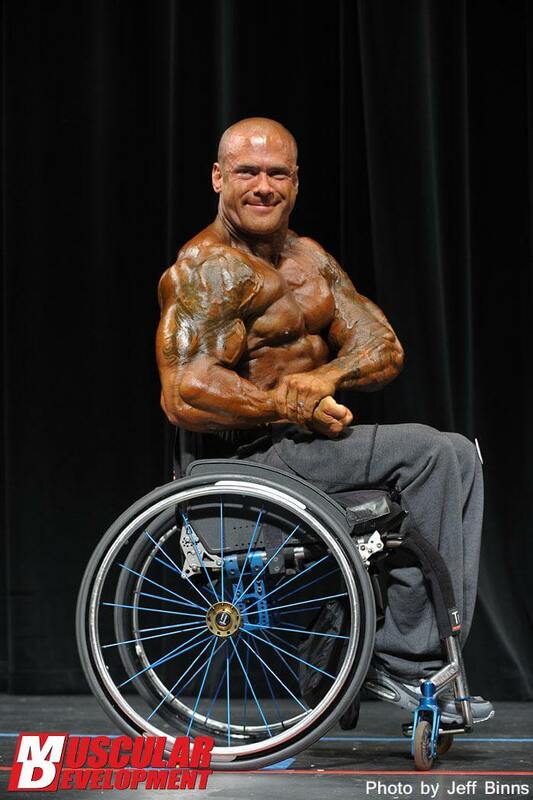 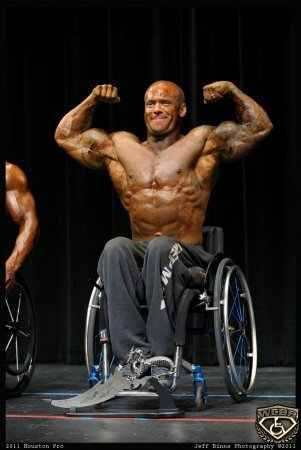 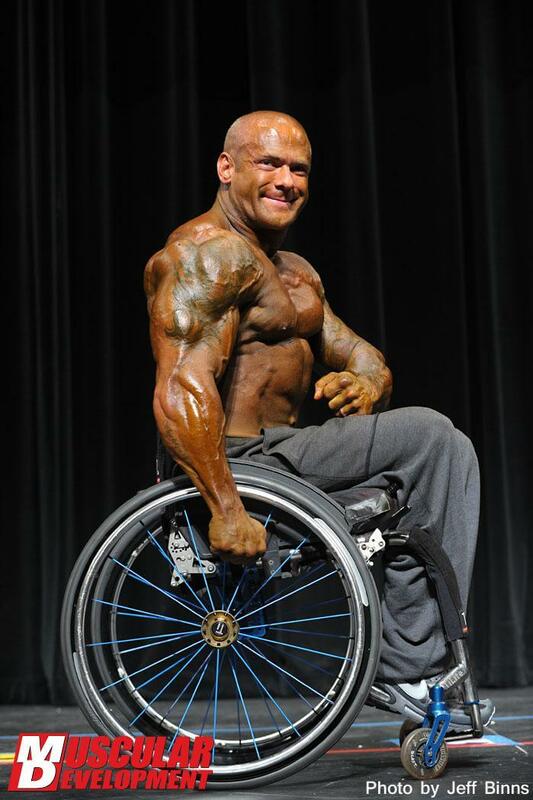 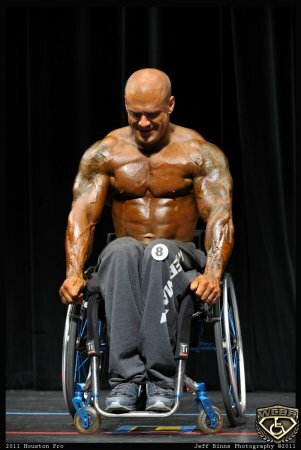 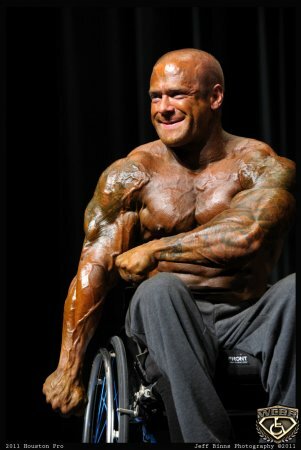 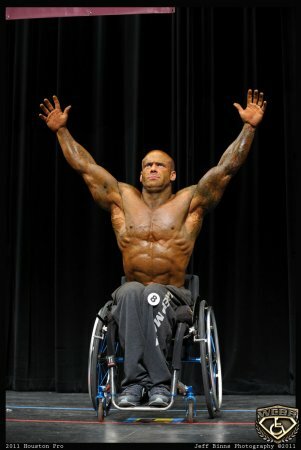 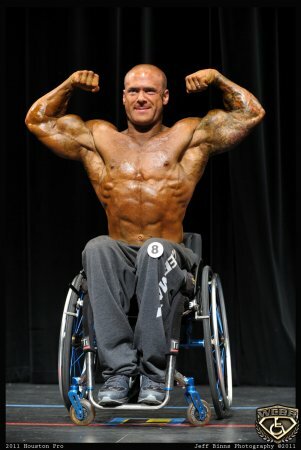 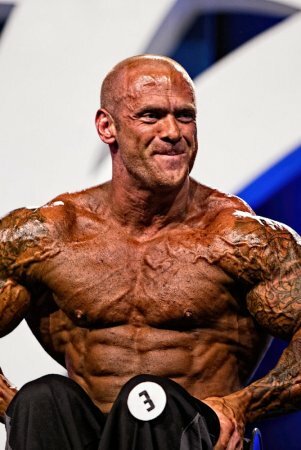 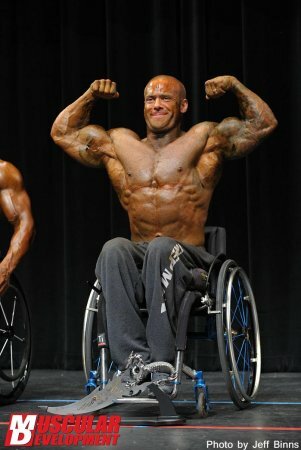 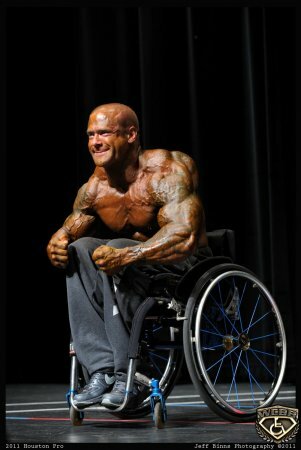 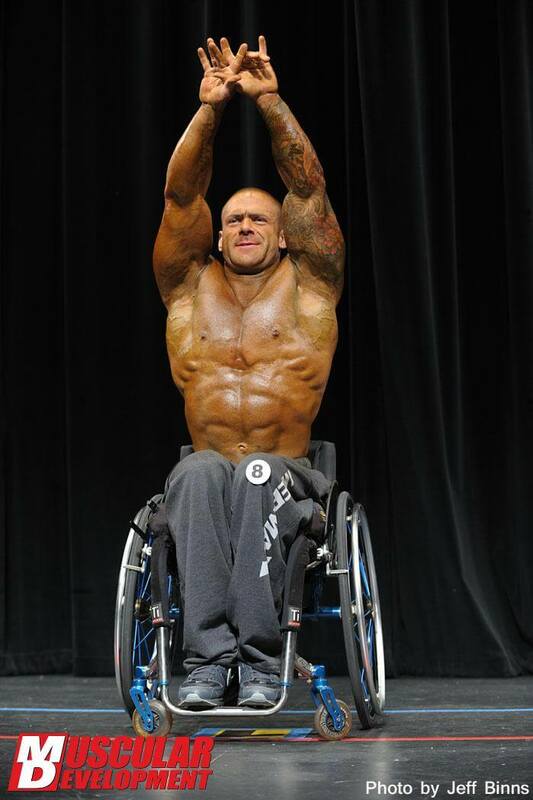 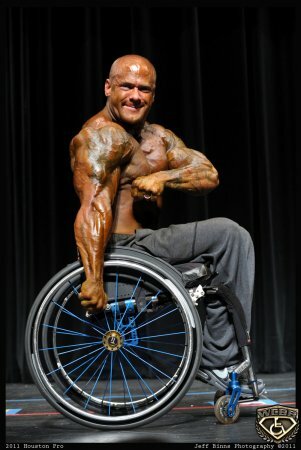 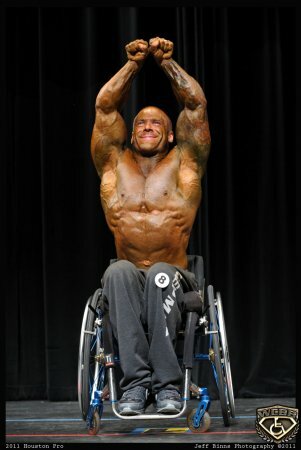 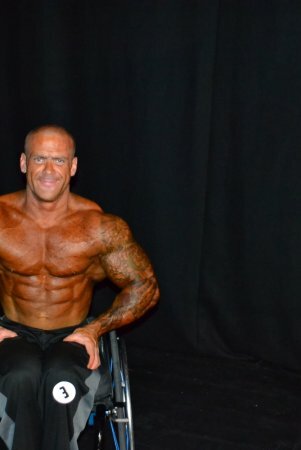 Dan Smith, 36, from Hampshire, moved closer to his goal of becoming a Pro Body Builder when he became the first ever IFBB (International Federation of Body Building and Fitness) wheelchair body building champion at The Juniors and Masters World Amateur Body Building Championships at Bailystok, Poland, 13-16 November, 2009. 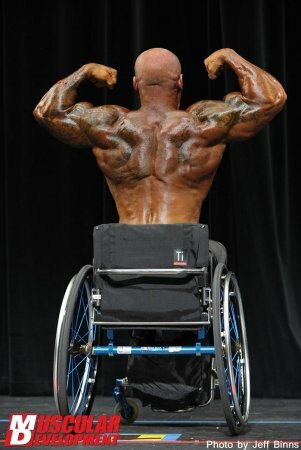 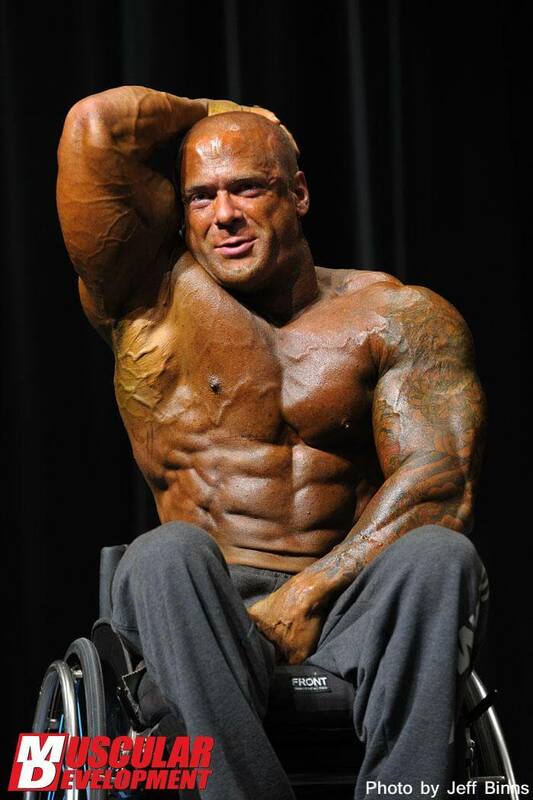 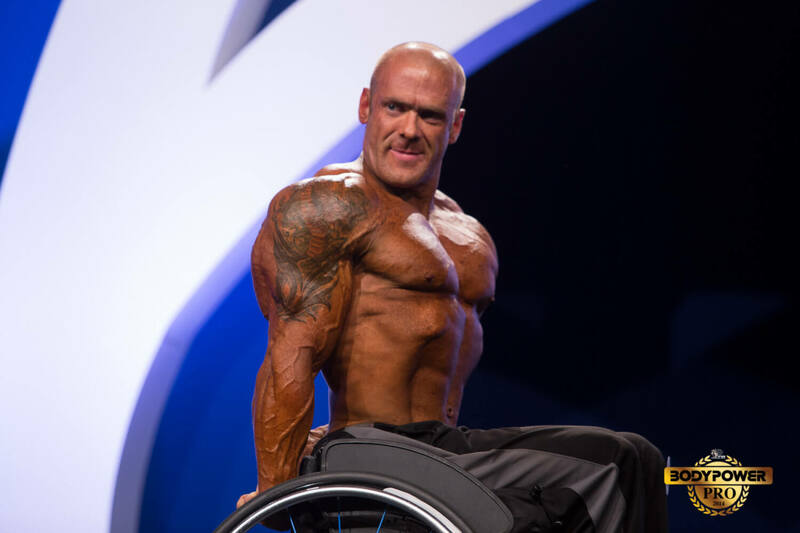 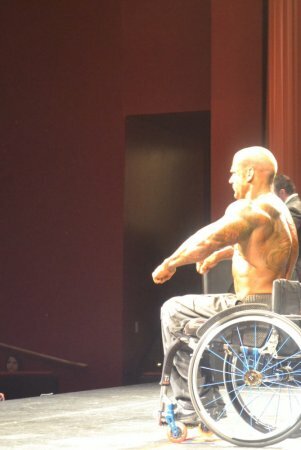 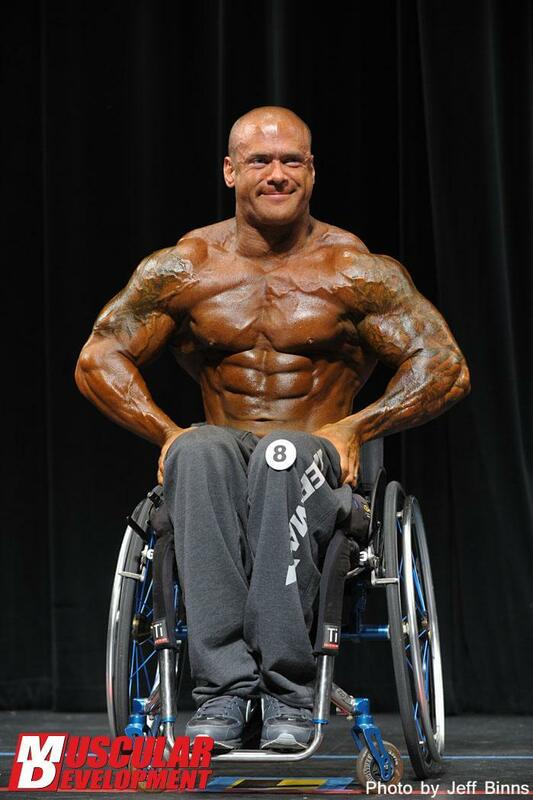 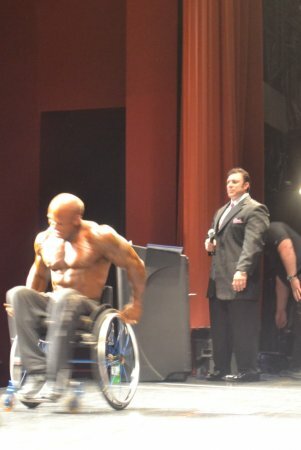 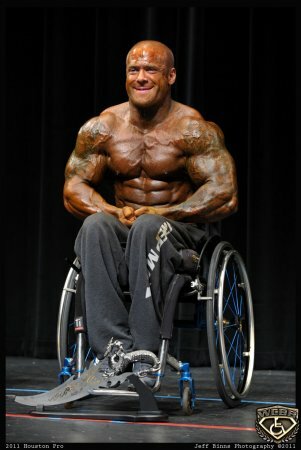 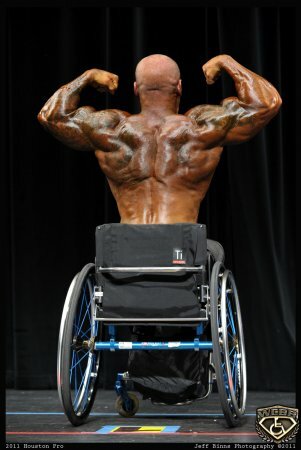 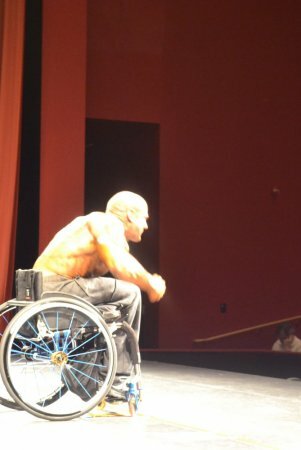 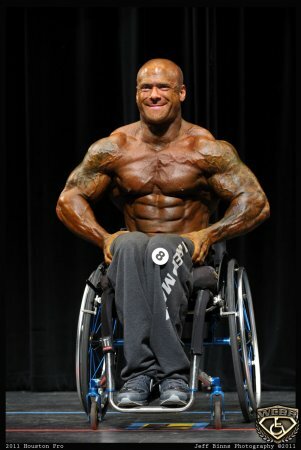 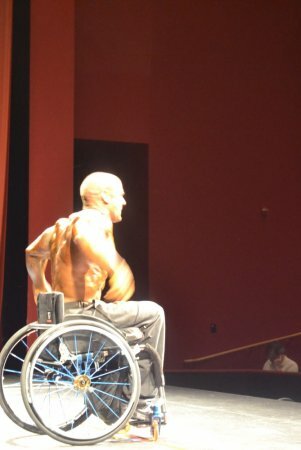 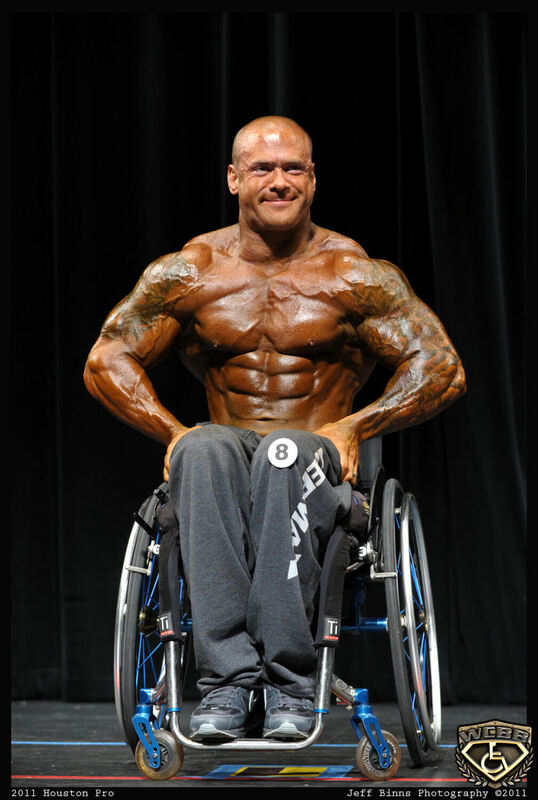 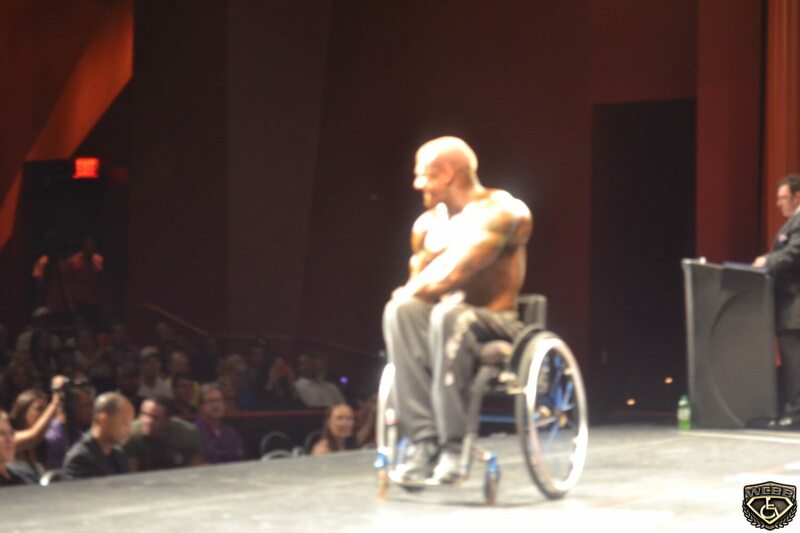 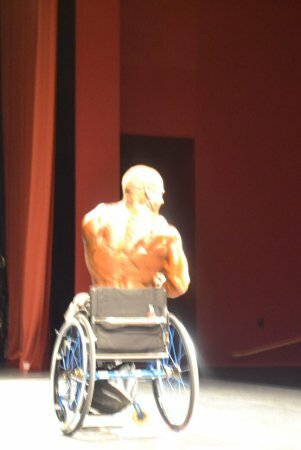 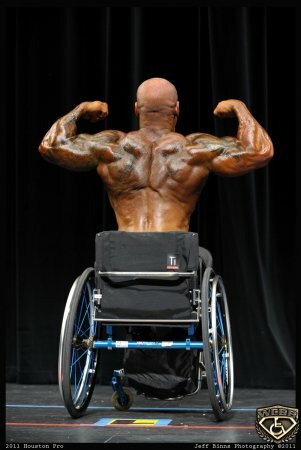 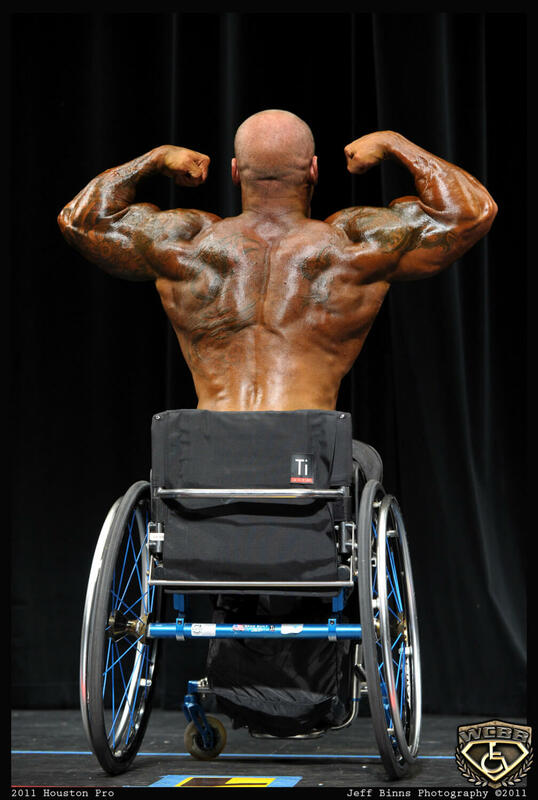 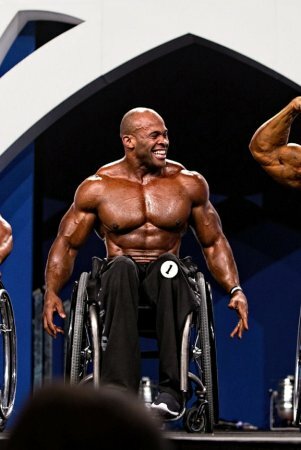 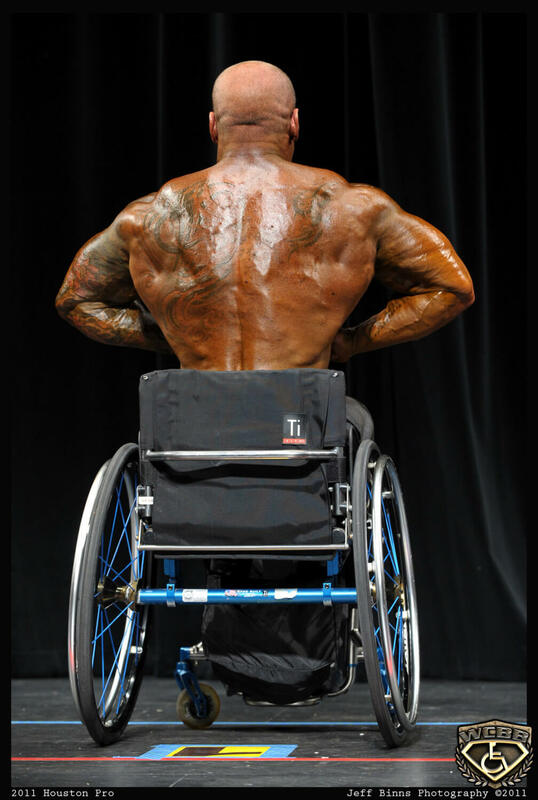 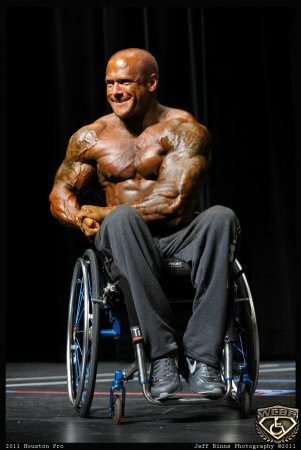 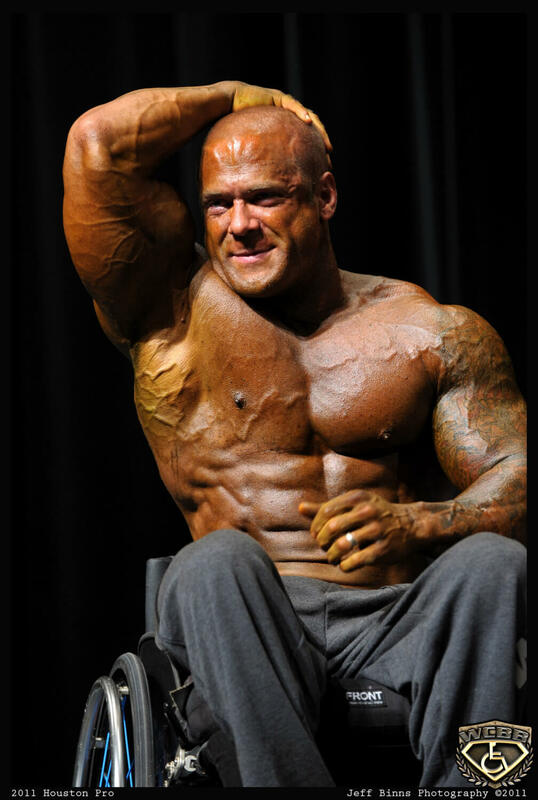 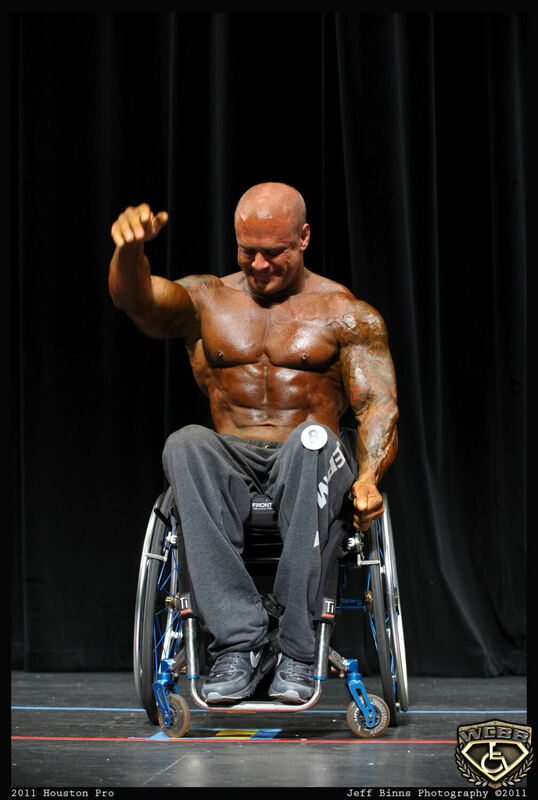 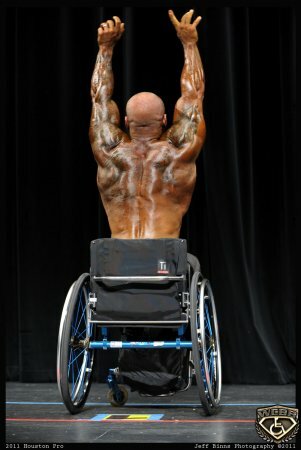 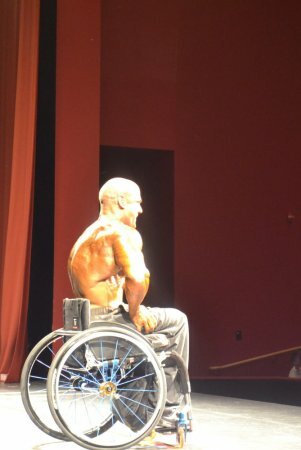 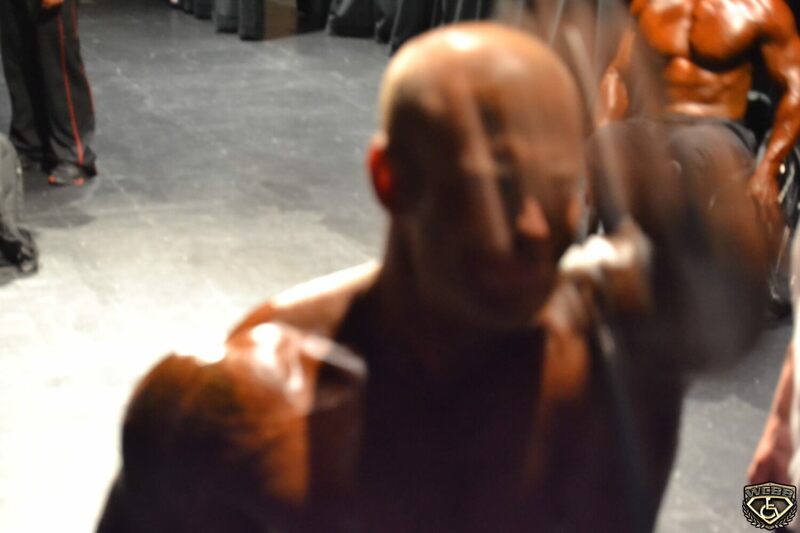 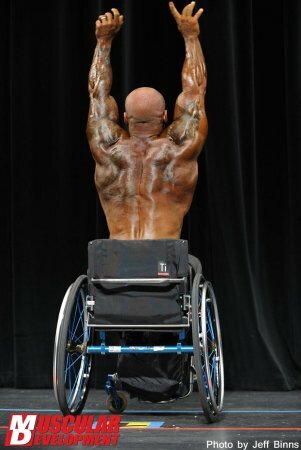 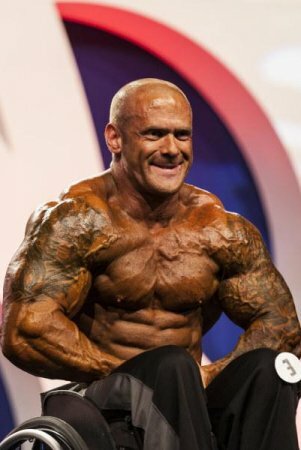 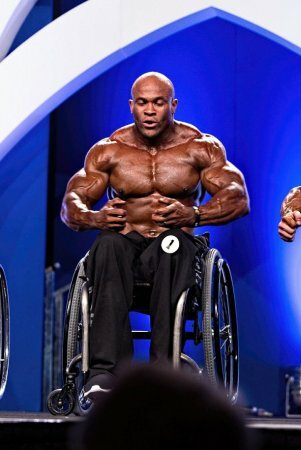 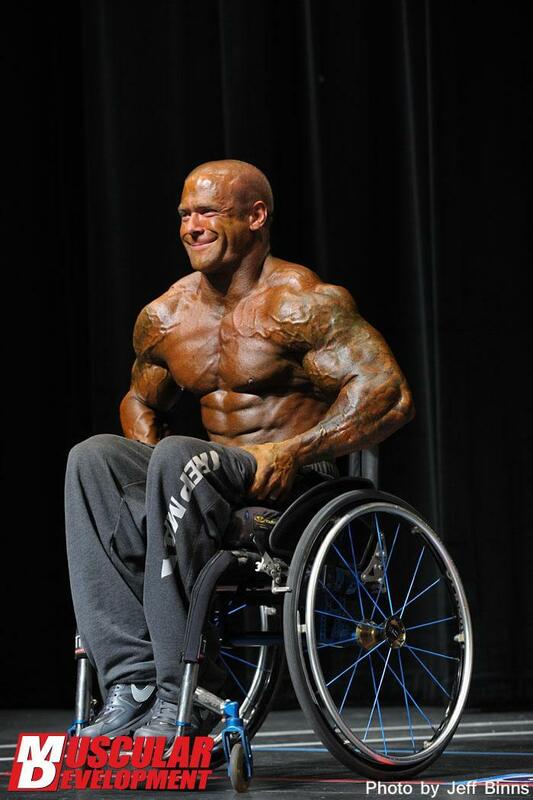 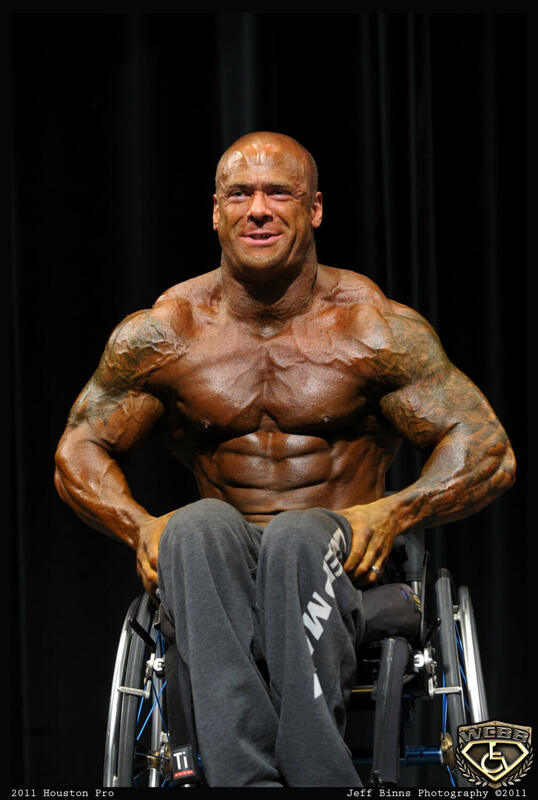 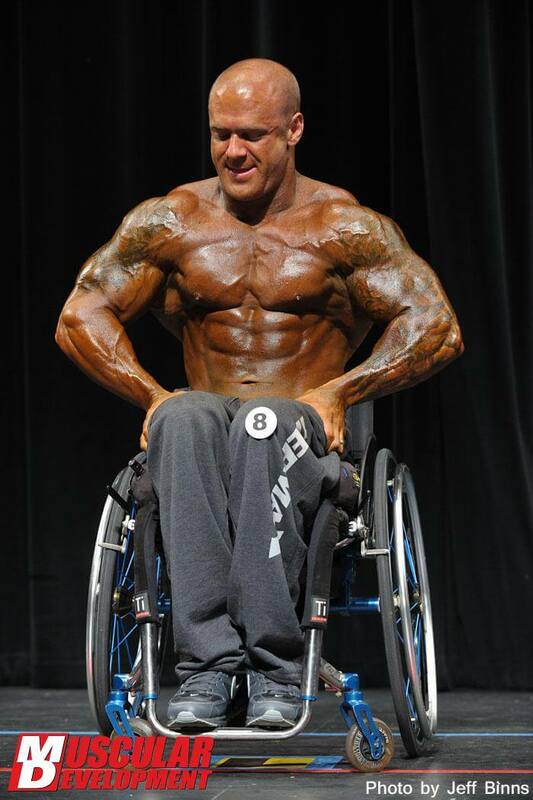 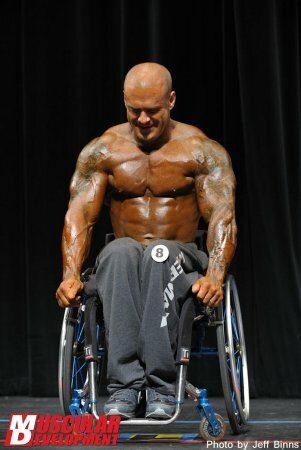 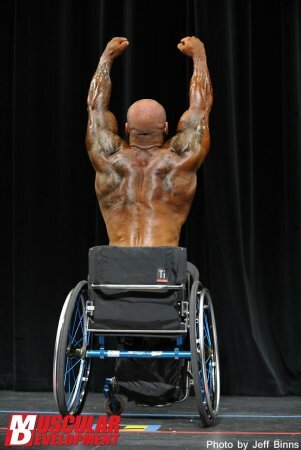 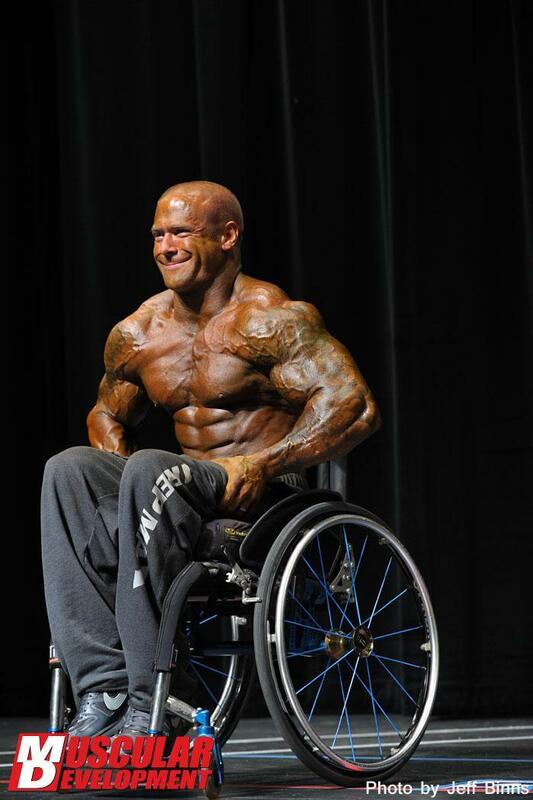 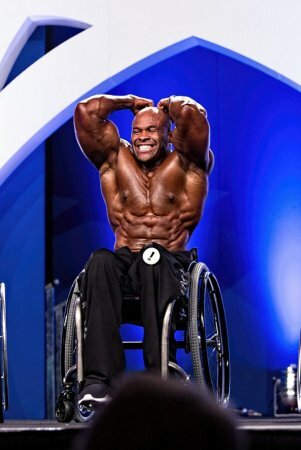 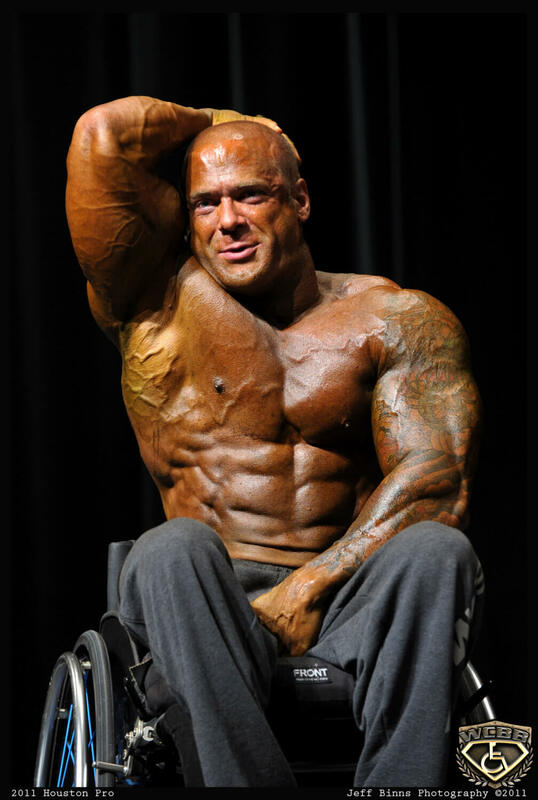 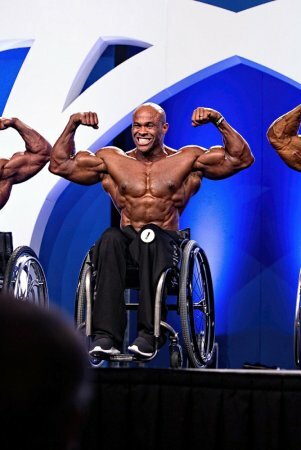 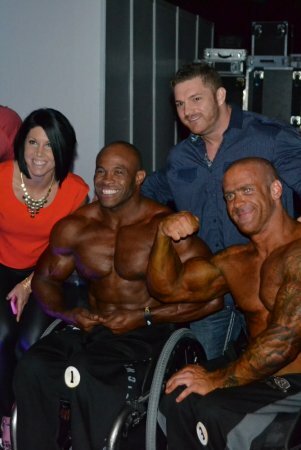 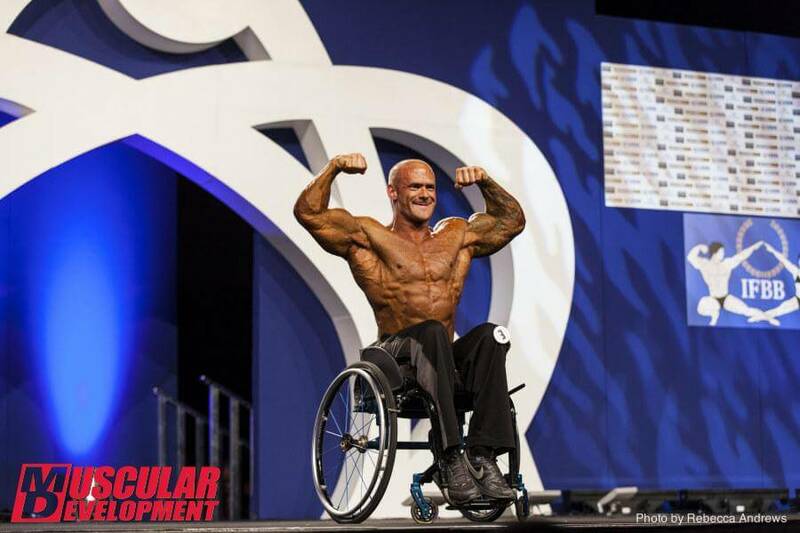 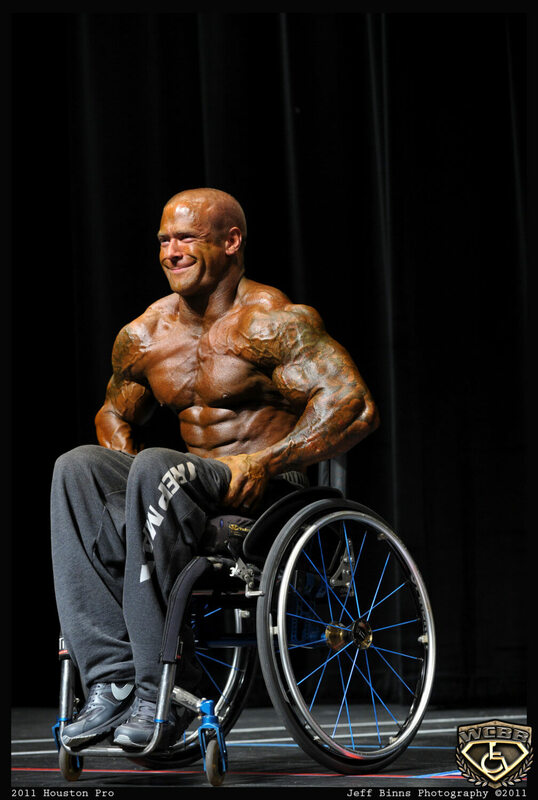 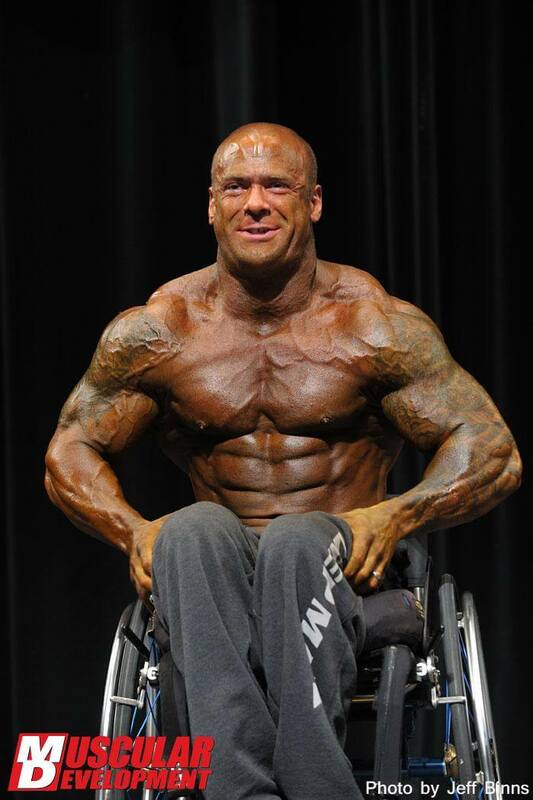 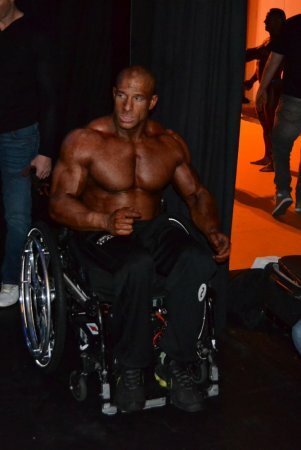 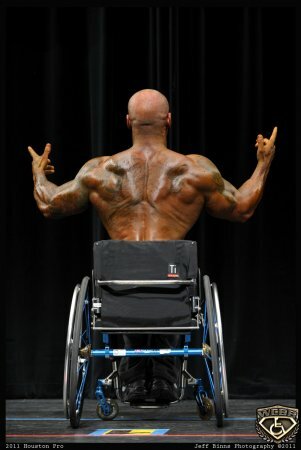 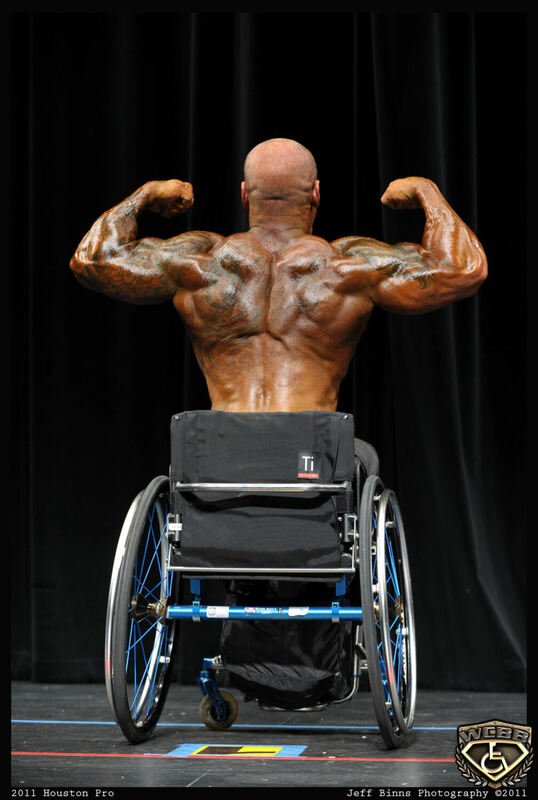 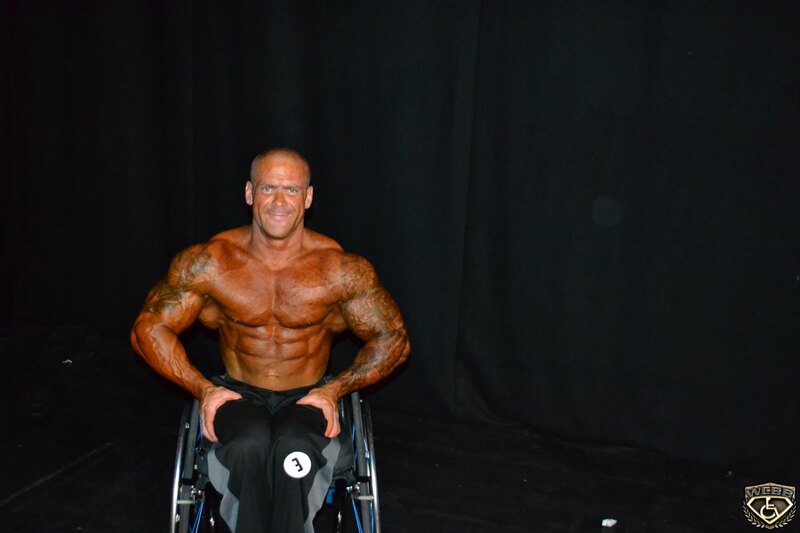 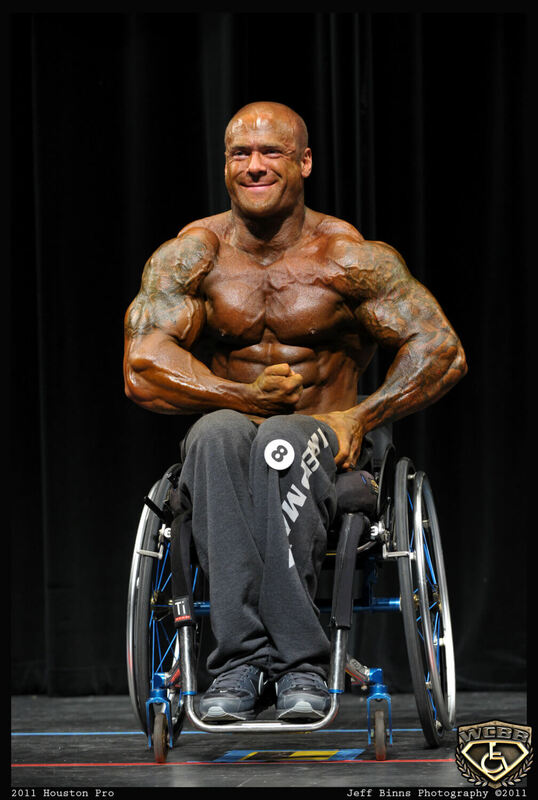 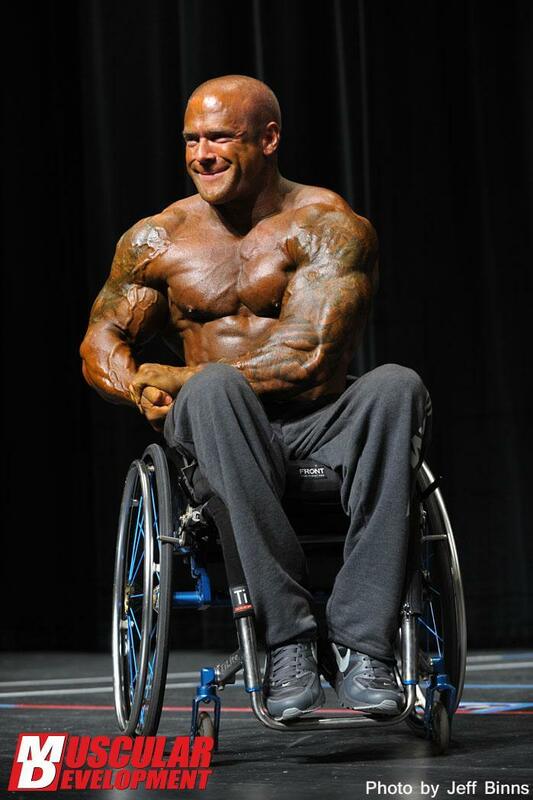 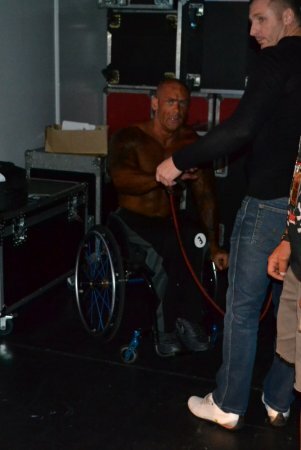 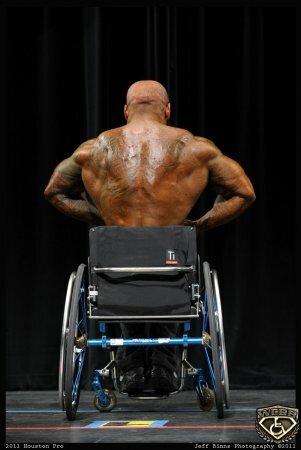 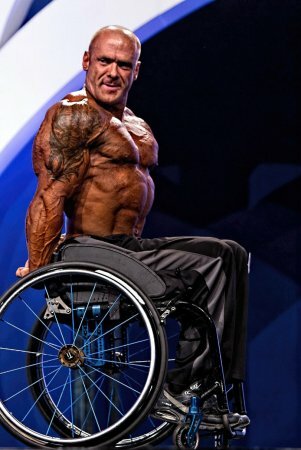 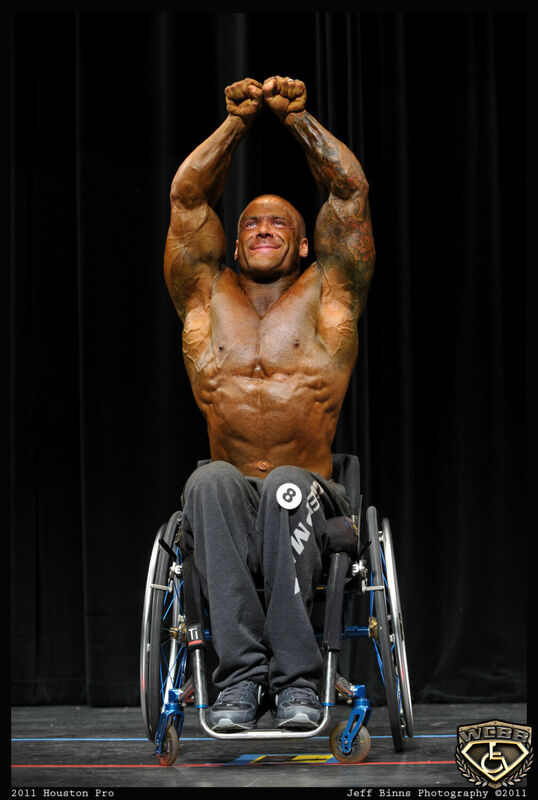 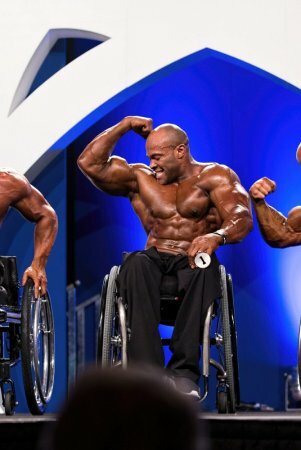 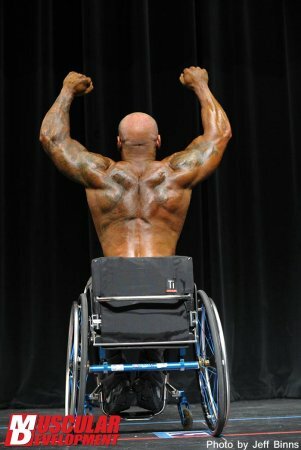 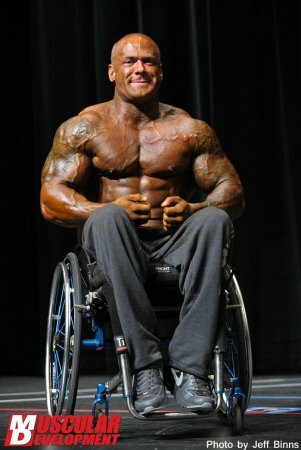 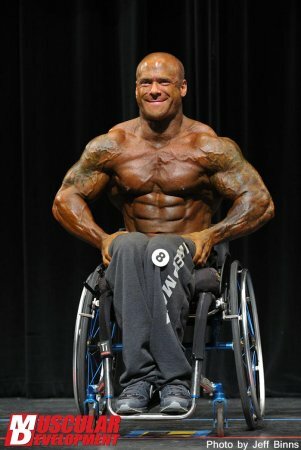 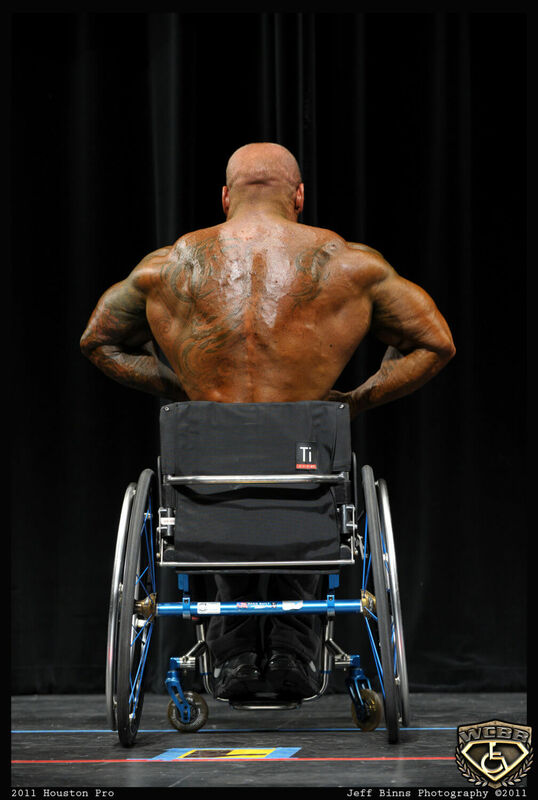 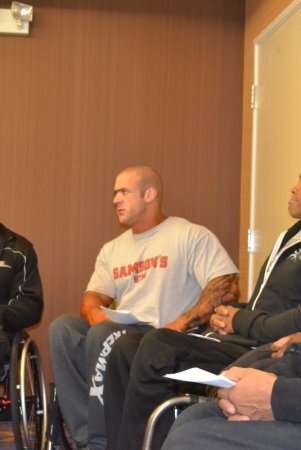 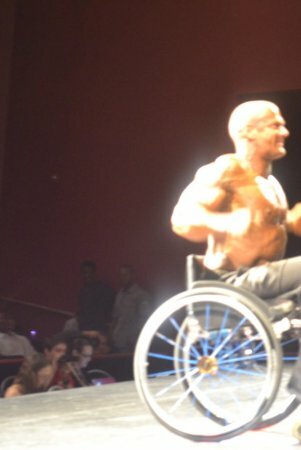 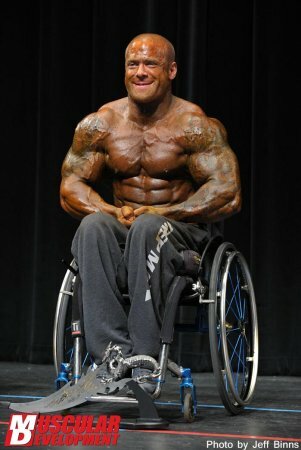 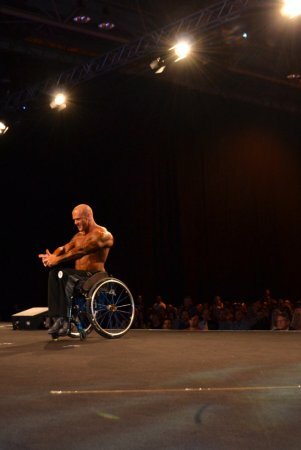 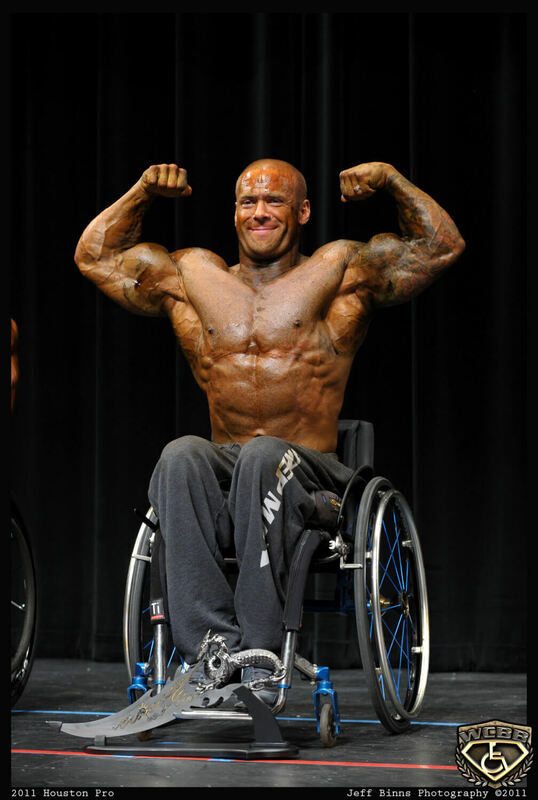 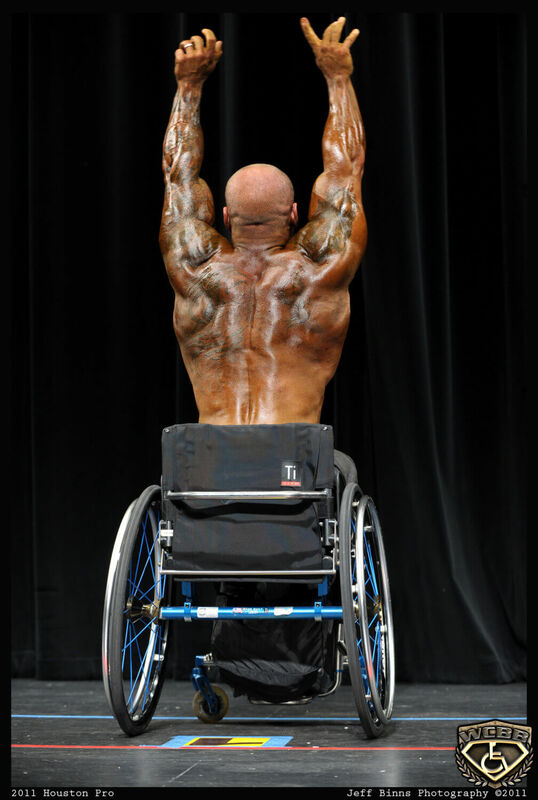 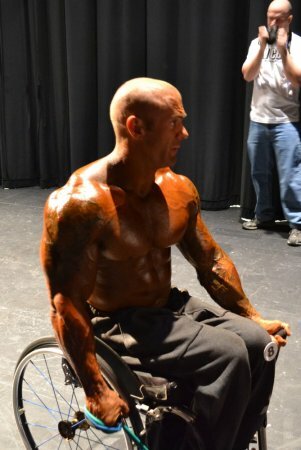 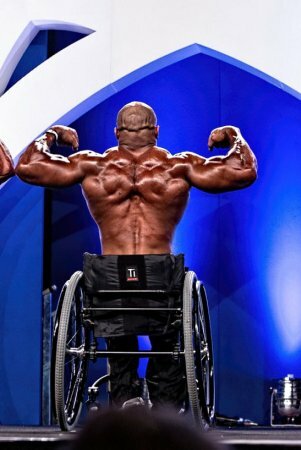 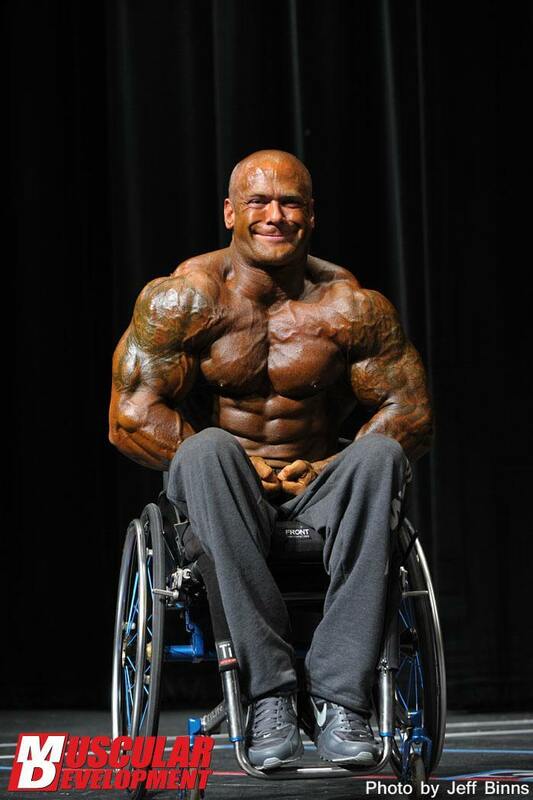 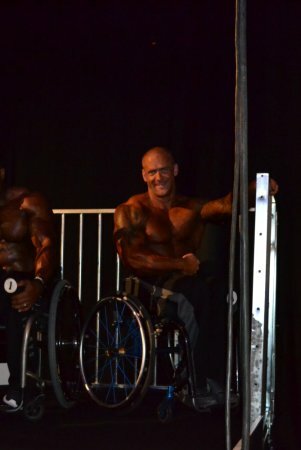 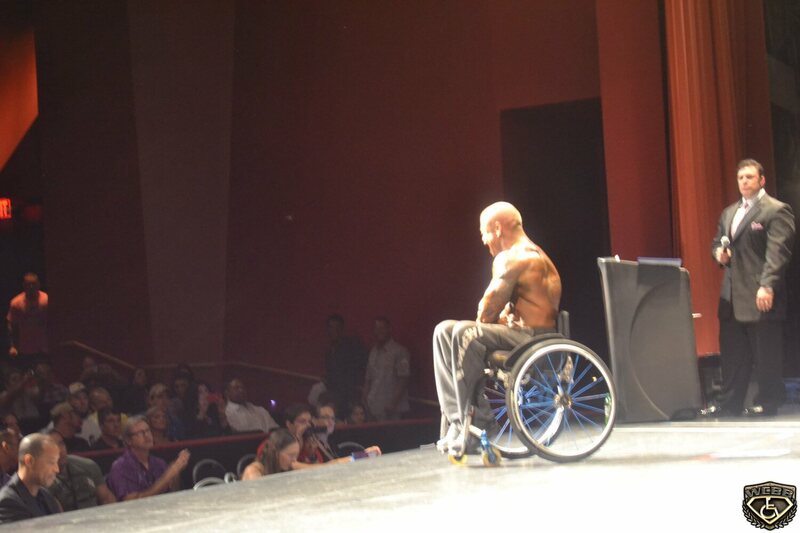 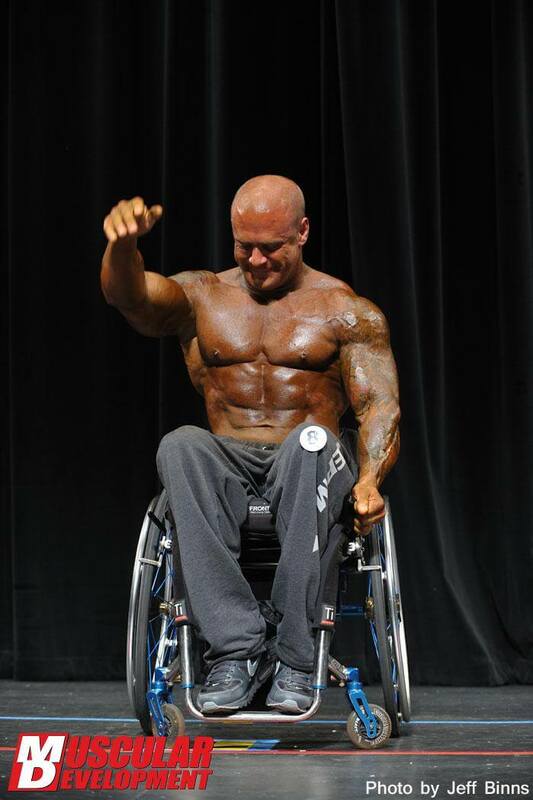 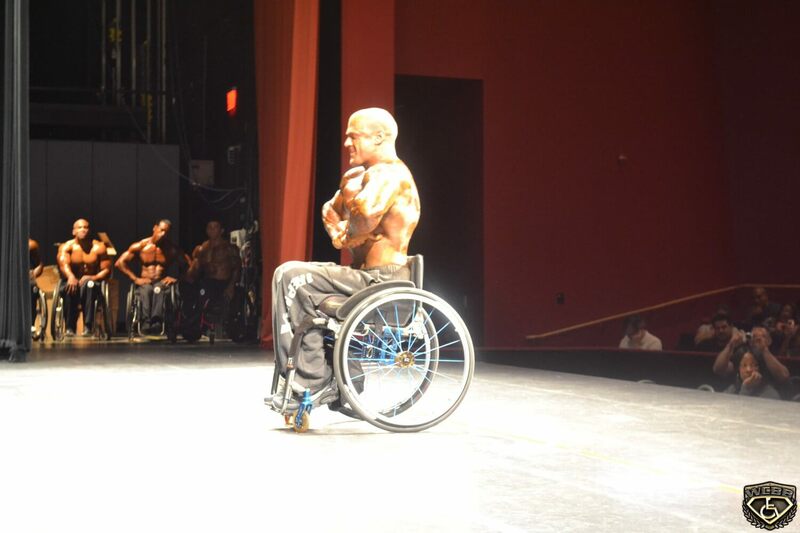 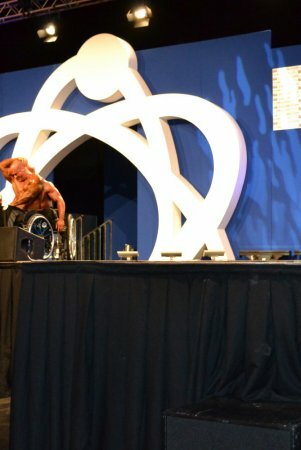 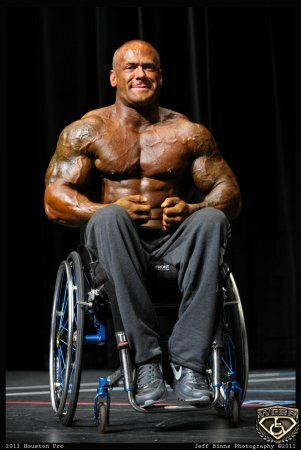 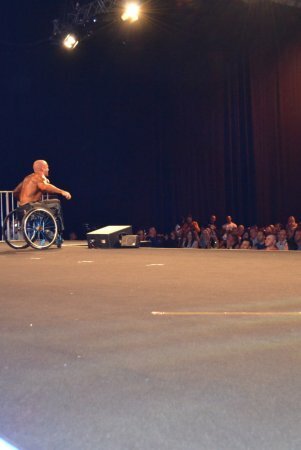 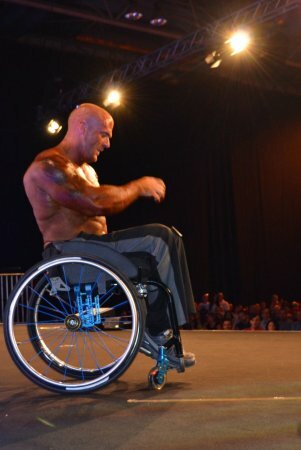 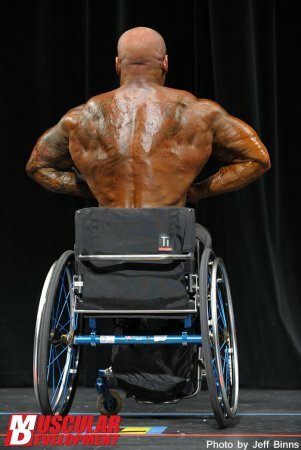 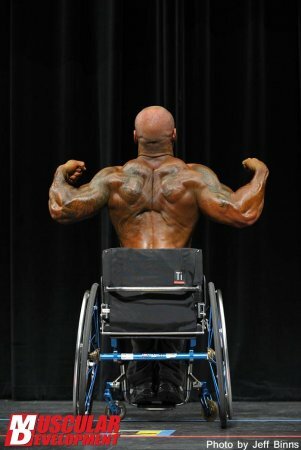 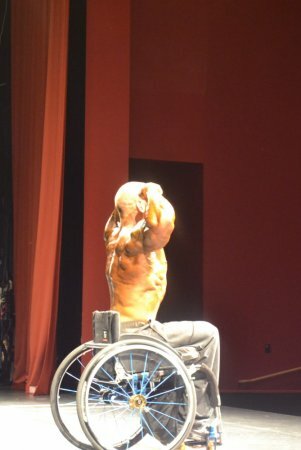 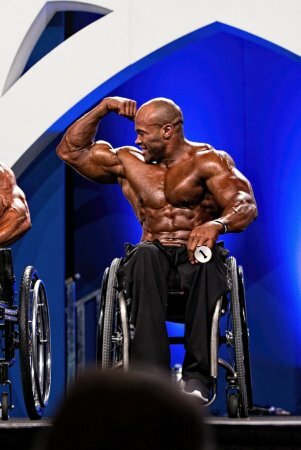 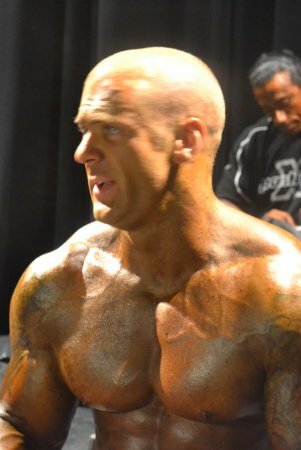 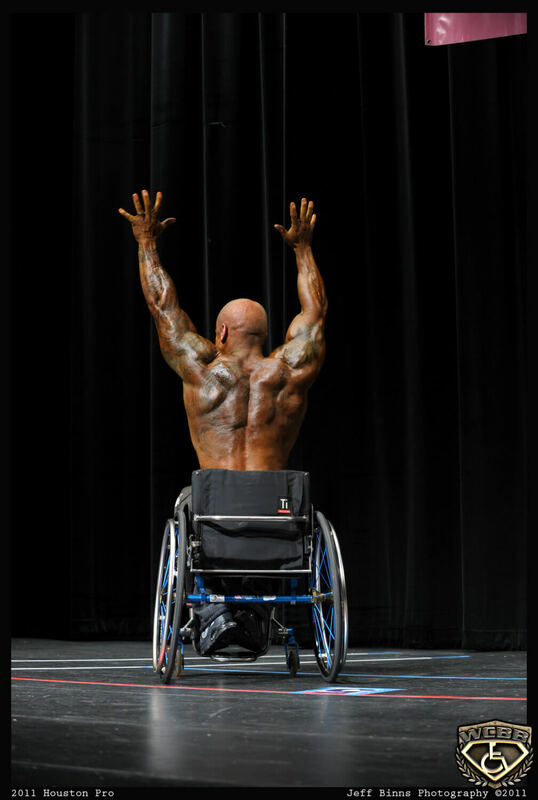 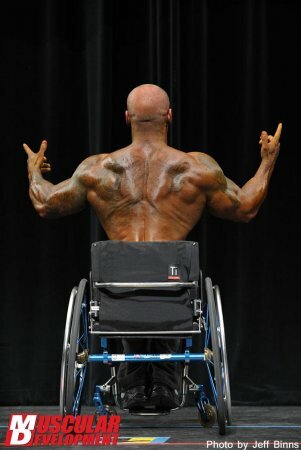 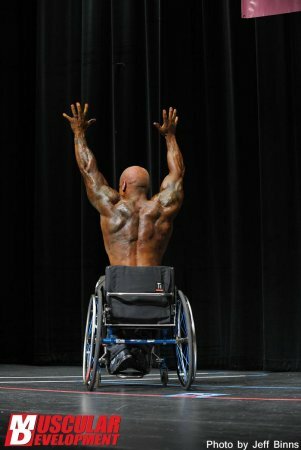 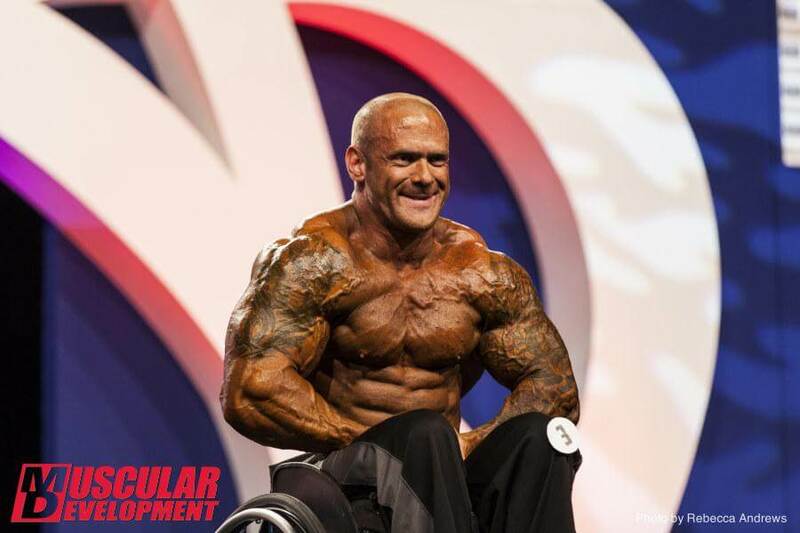 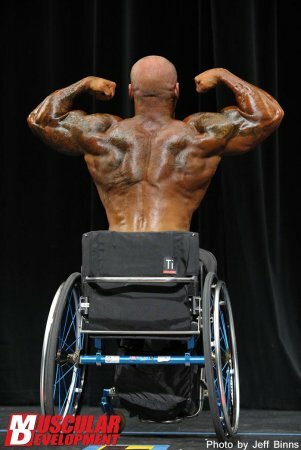 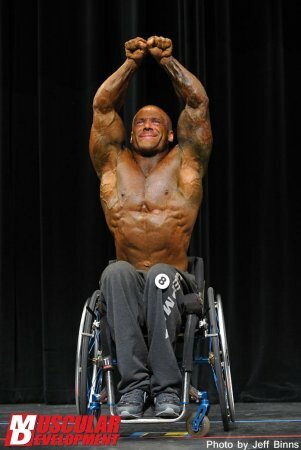 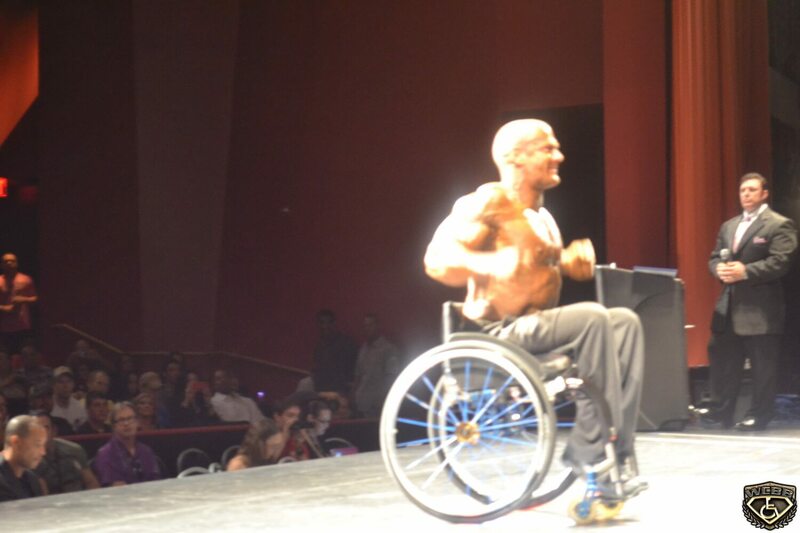 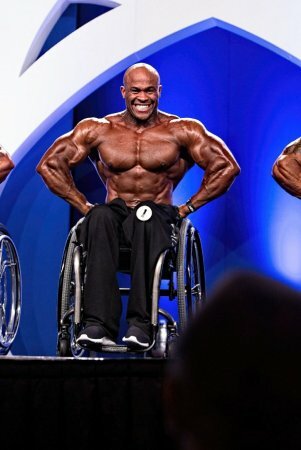 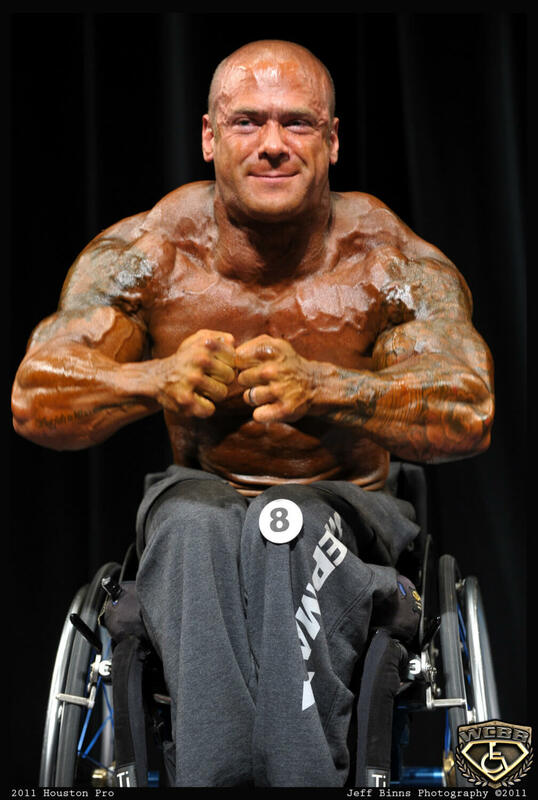 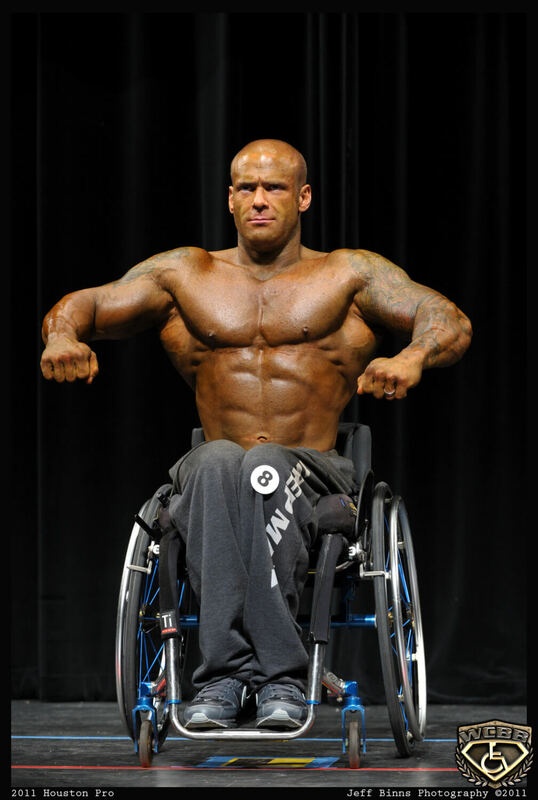 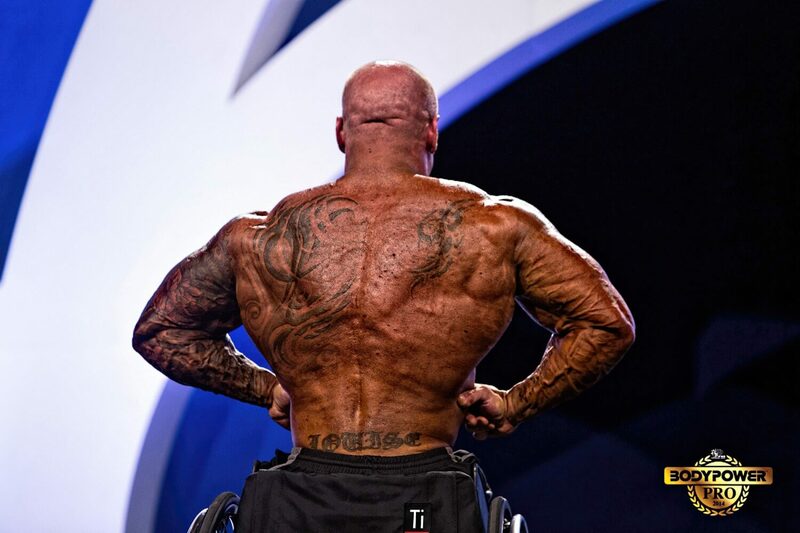 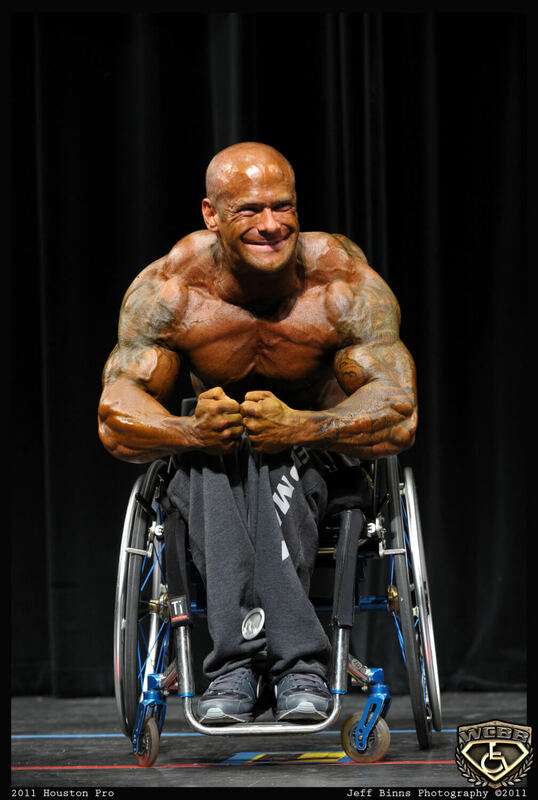 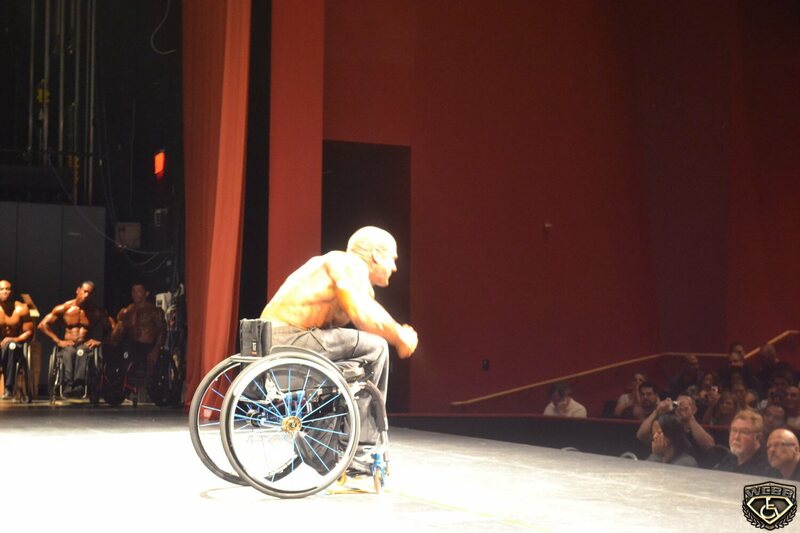 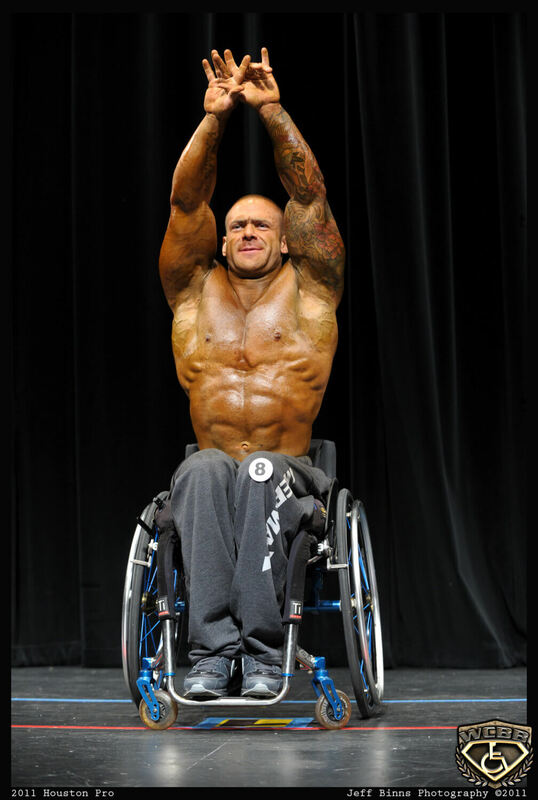 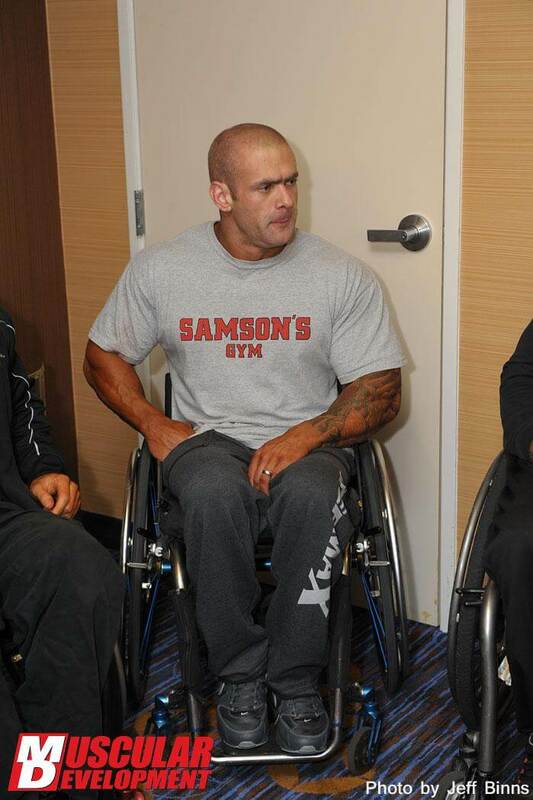 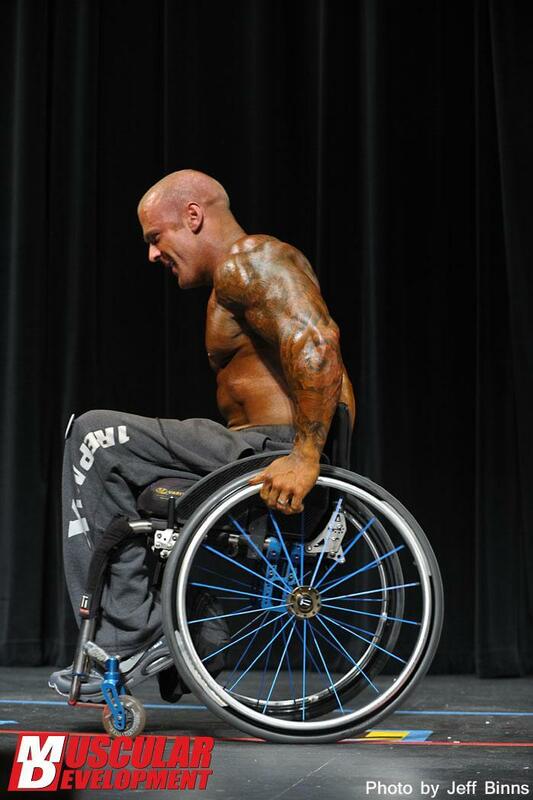 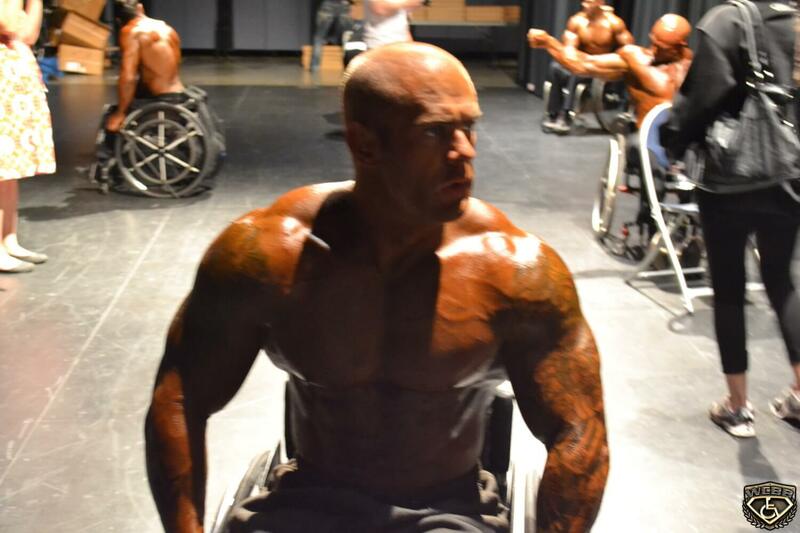 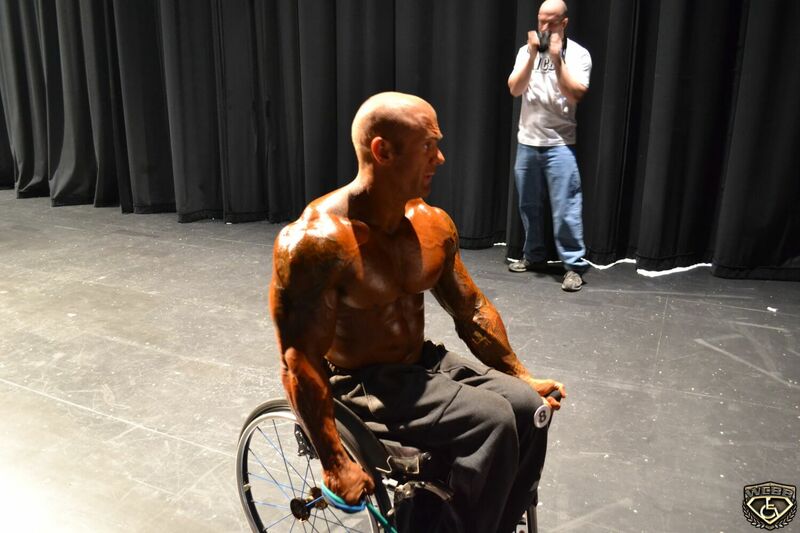 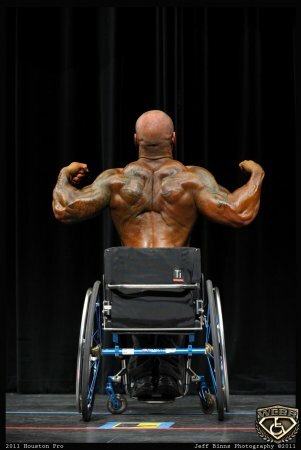 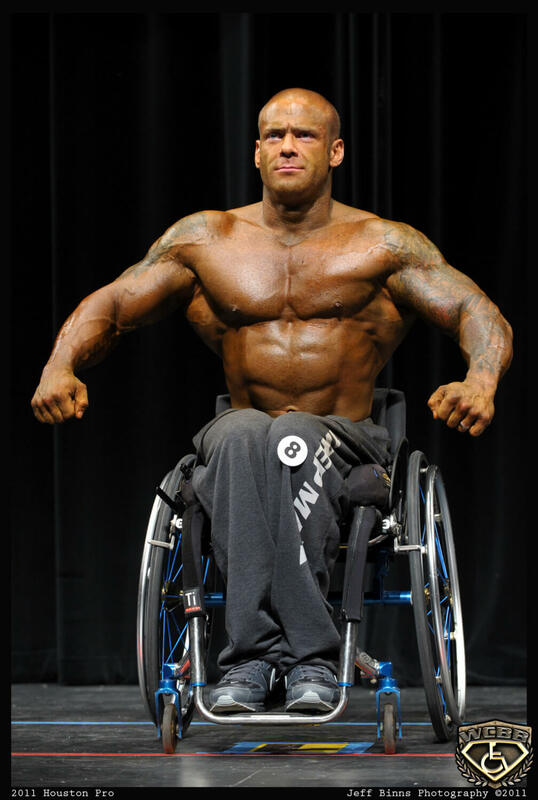 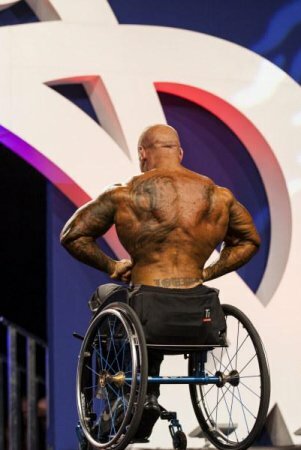 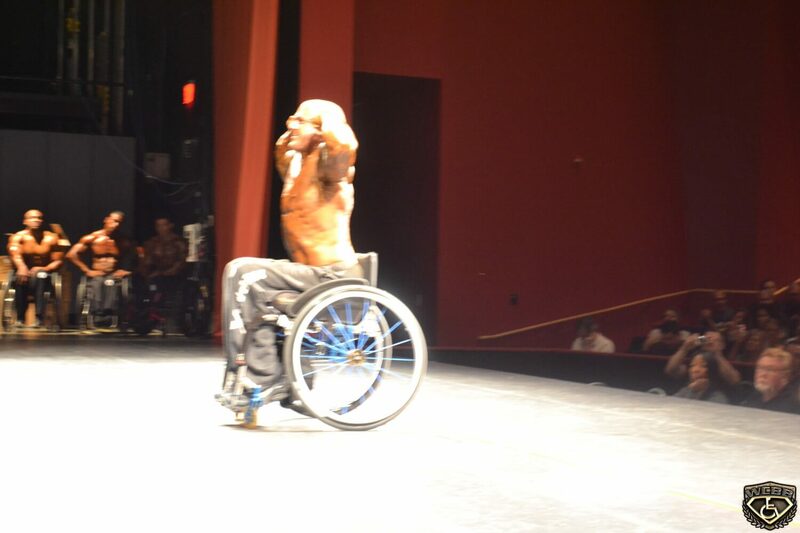 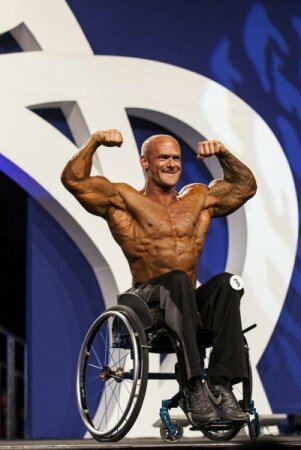 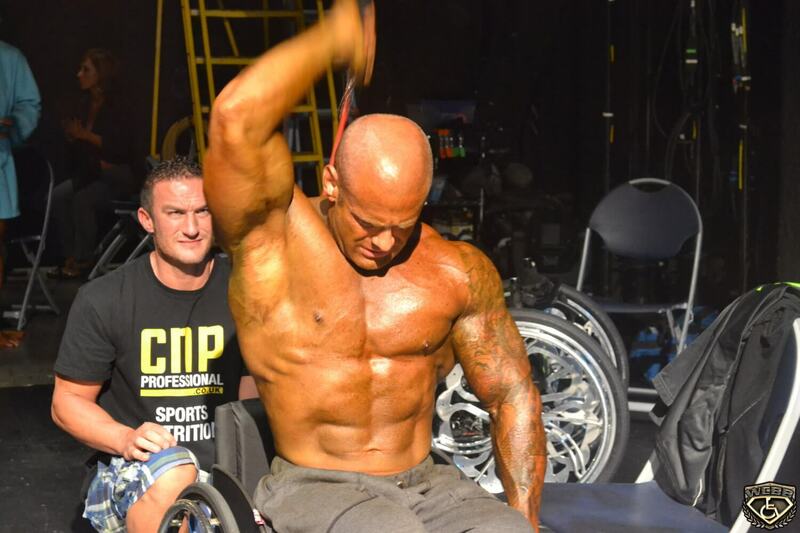 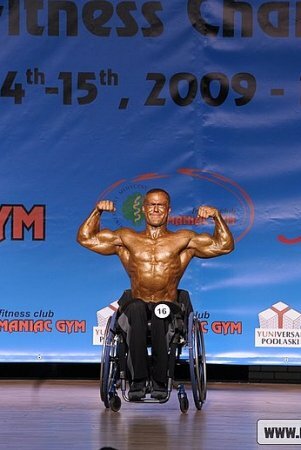 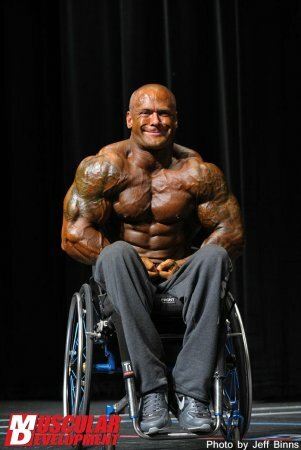 This was Dan’s debut appearance as a competitor since his horrendous accident in 2006; which damaged his spine and put him in a wheelchair. 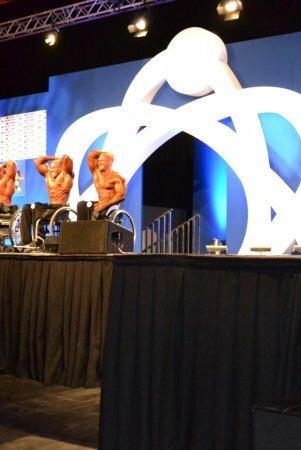 Dan has already impressed judges and fellow body builders alike when participating in guest spots at British body building events this year. 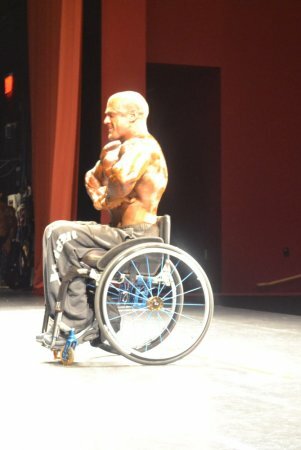 This was his first competitive event. 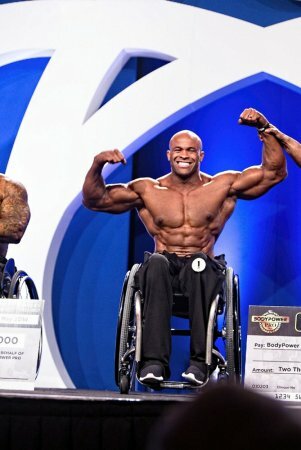 “What a great start,” he says. 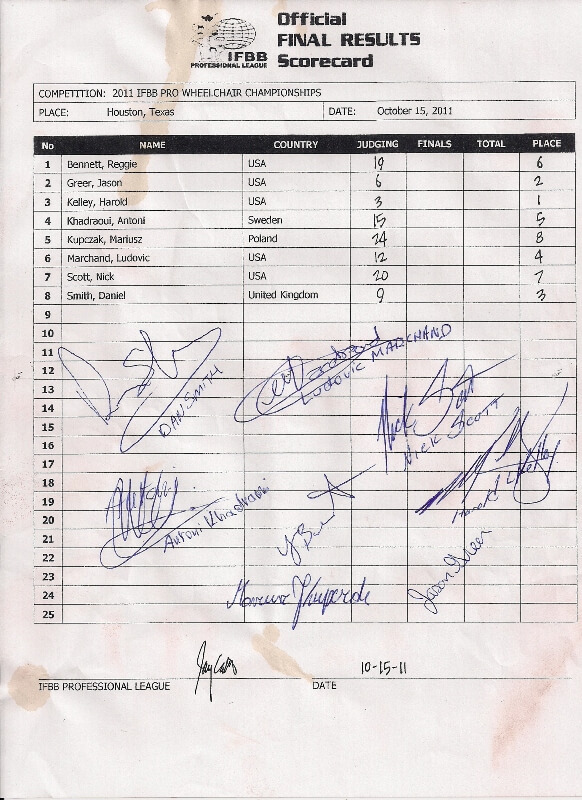 “I’m just knocked out about winning in Poland. 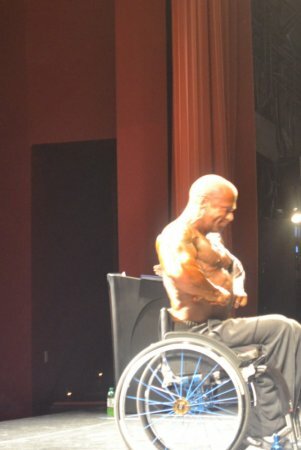 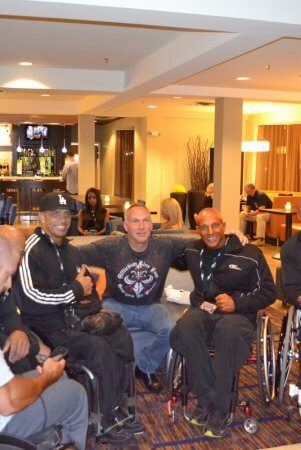 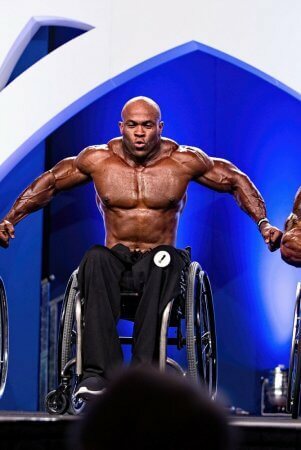 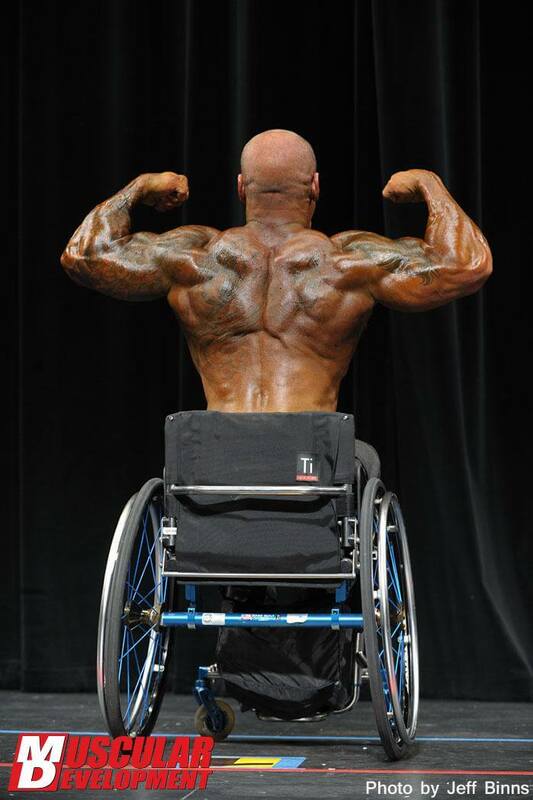 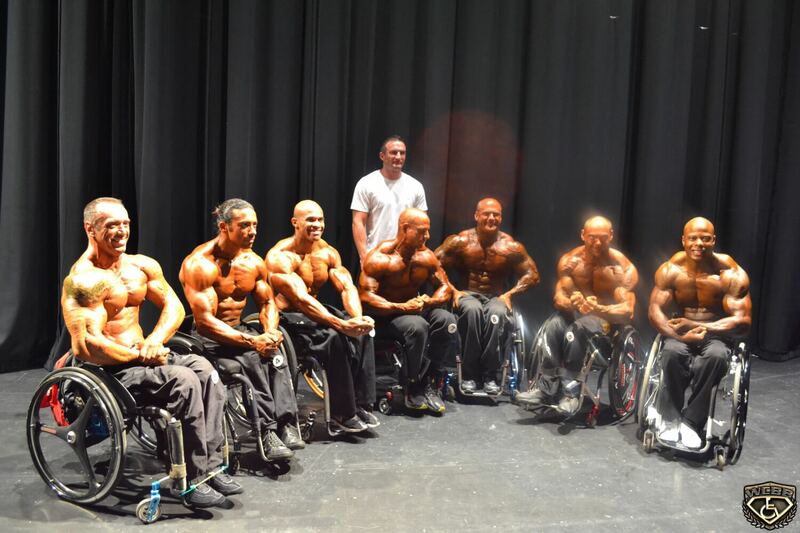 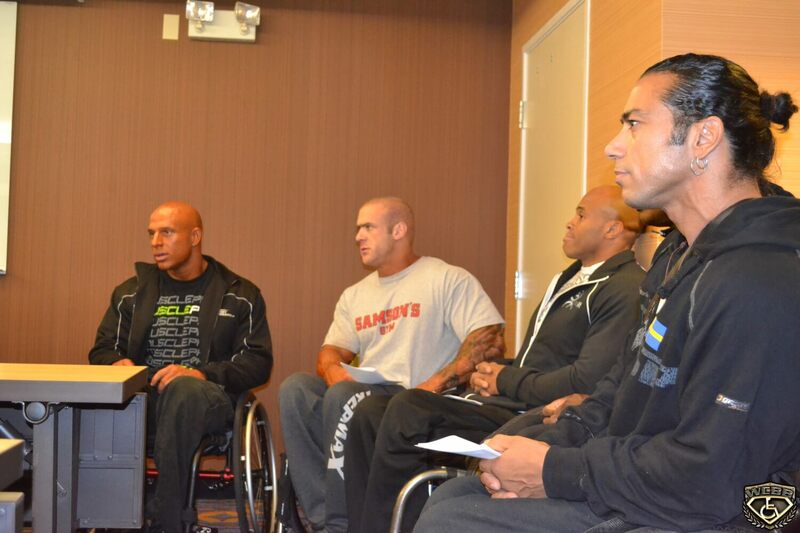 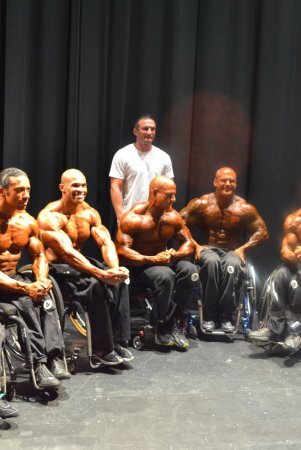 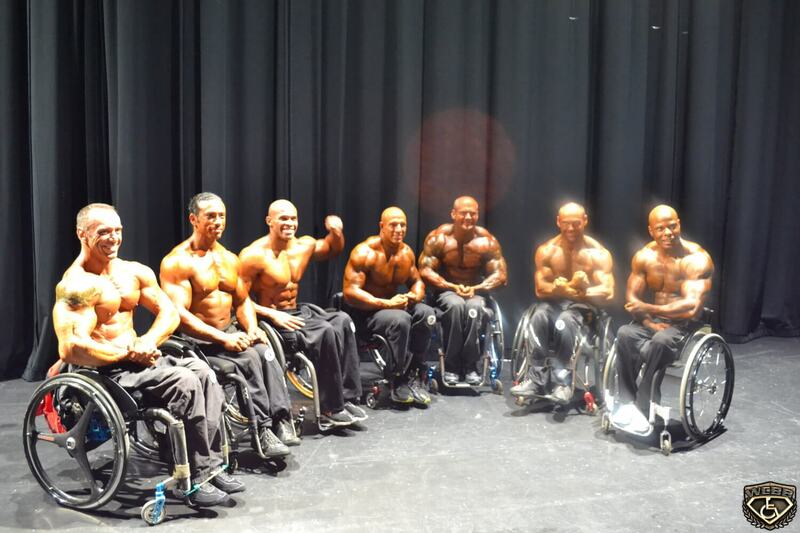 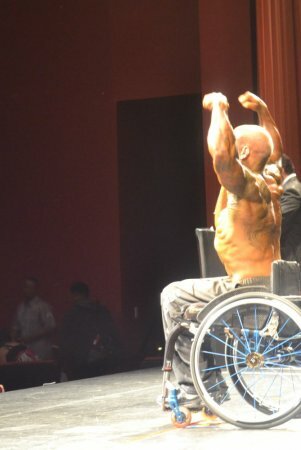 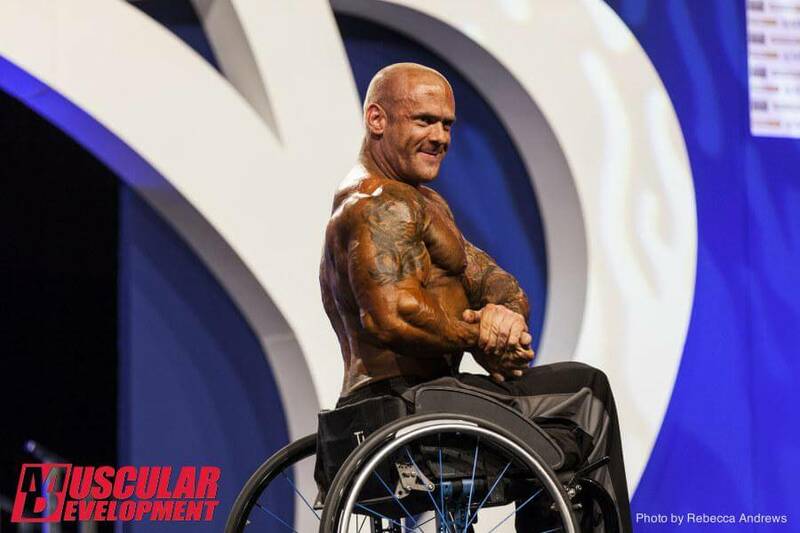 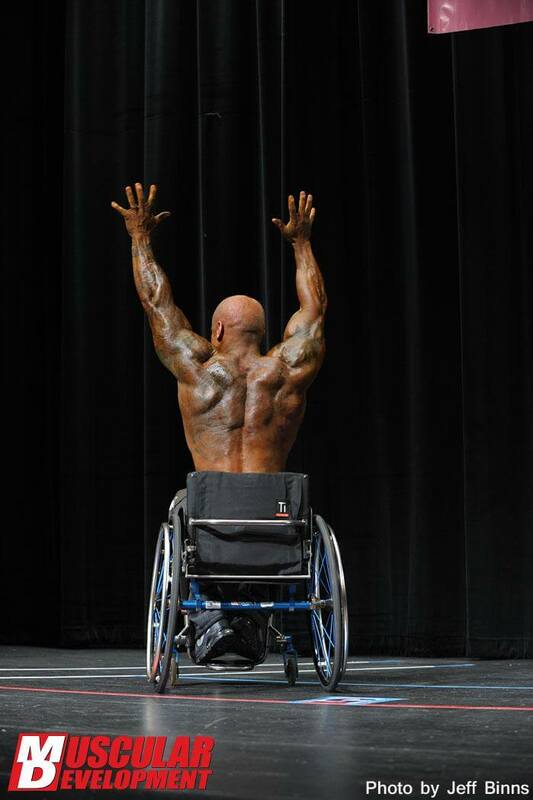 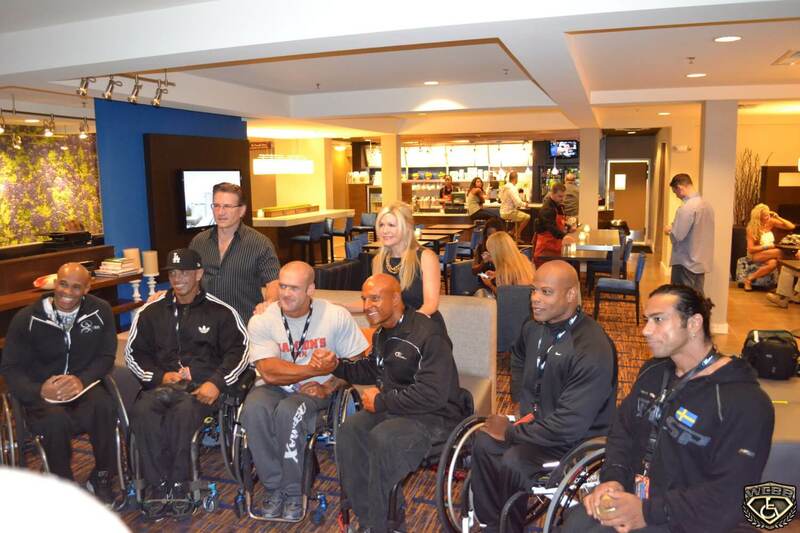 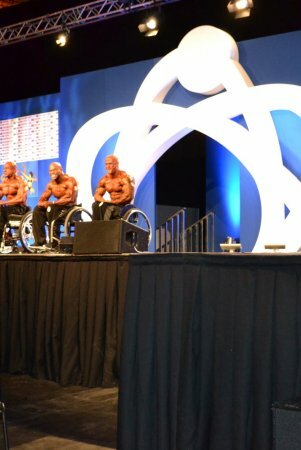 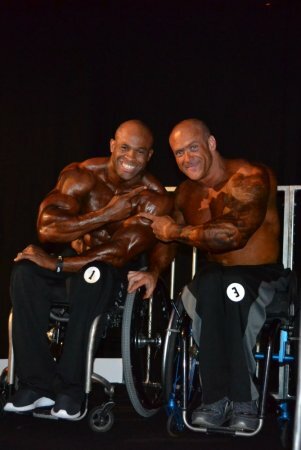 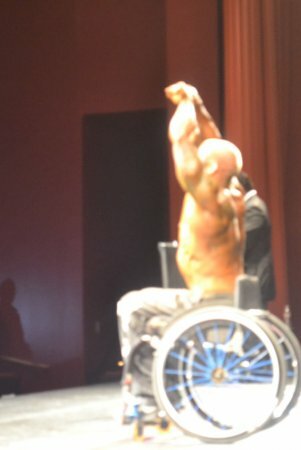 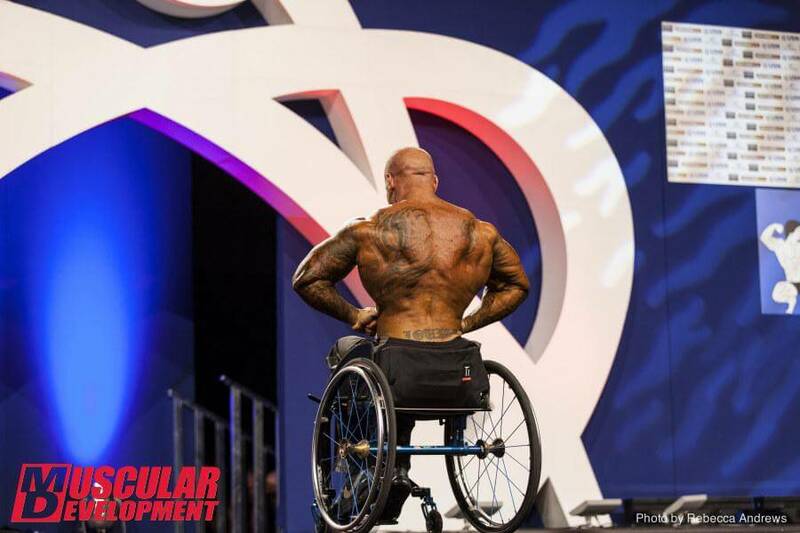 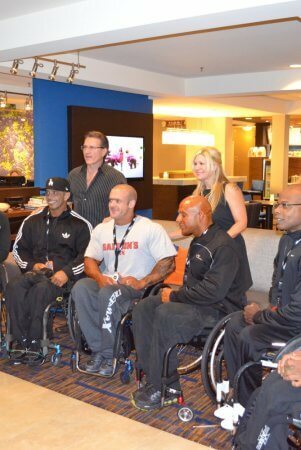 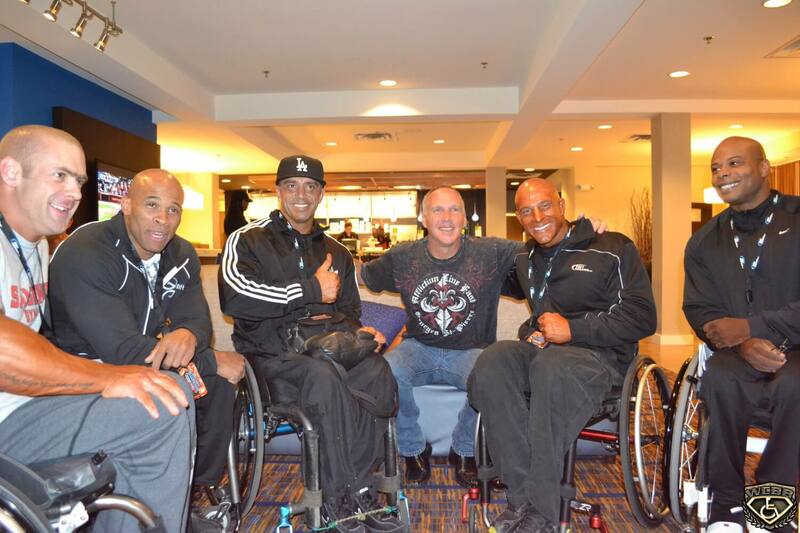 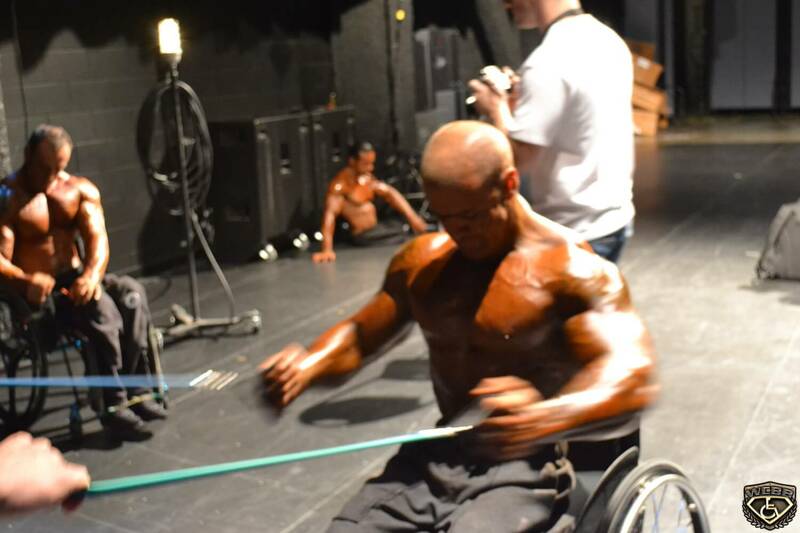 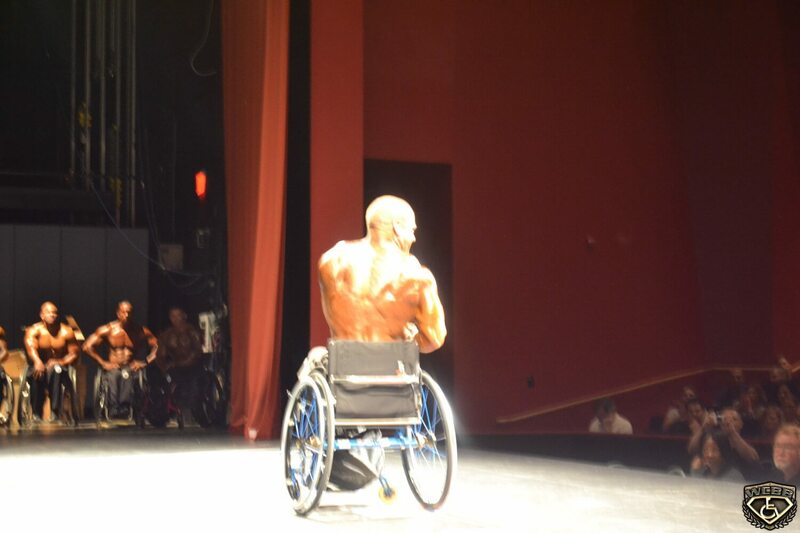 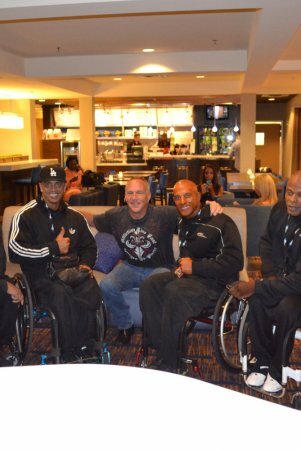 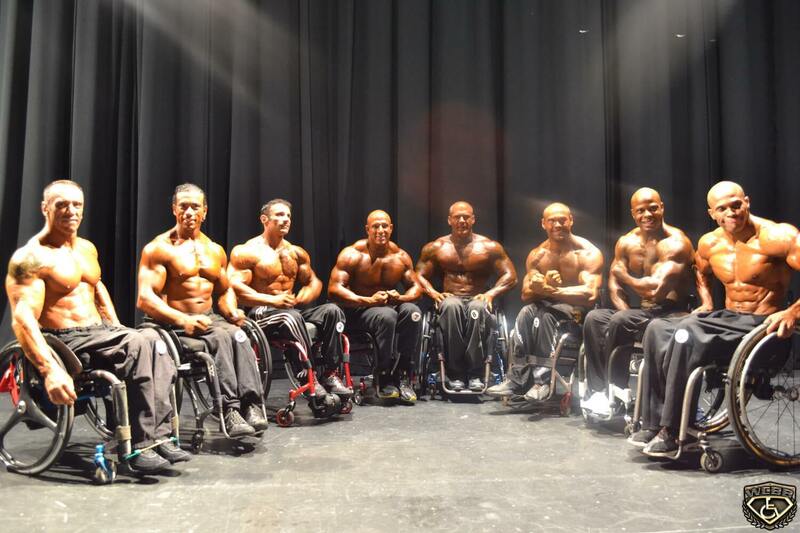 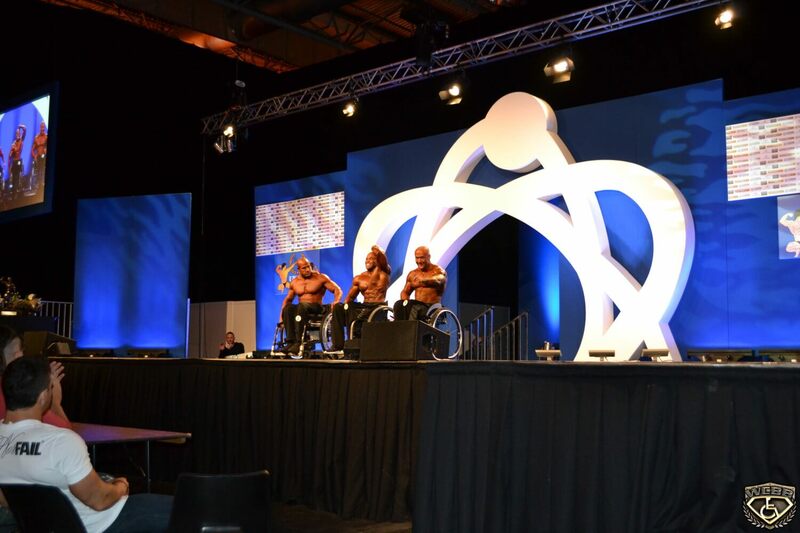 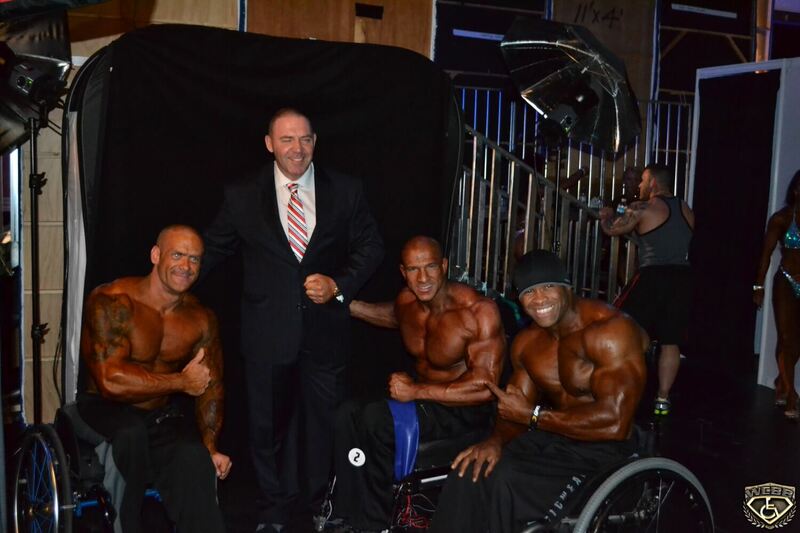 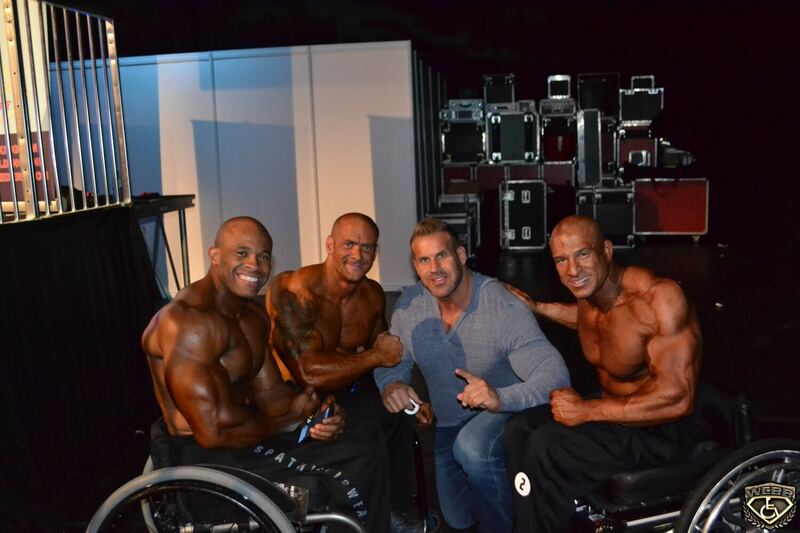 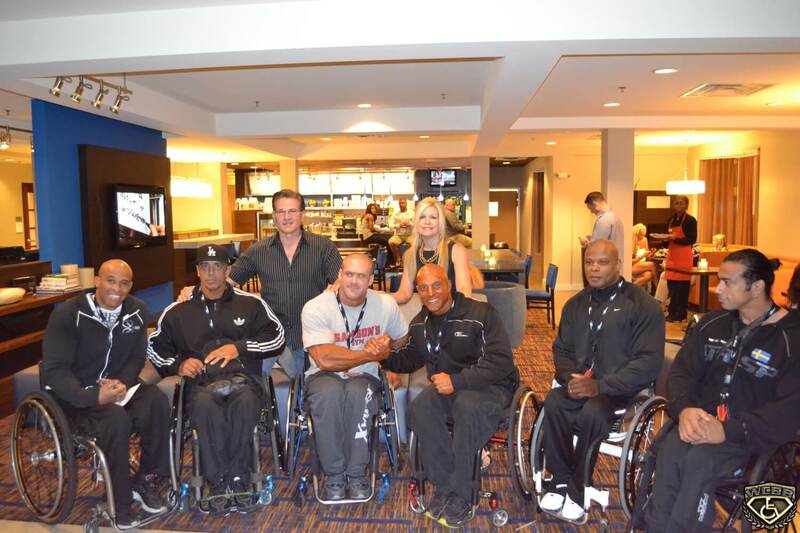 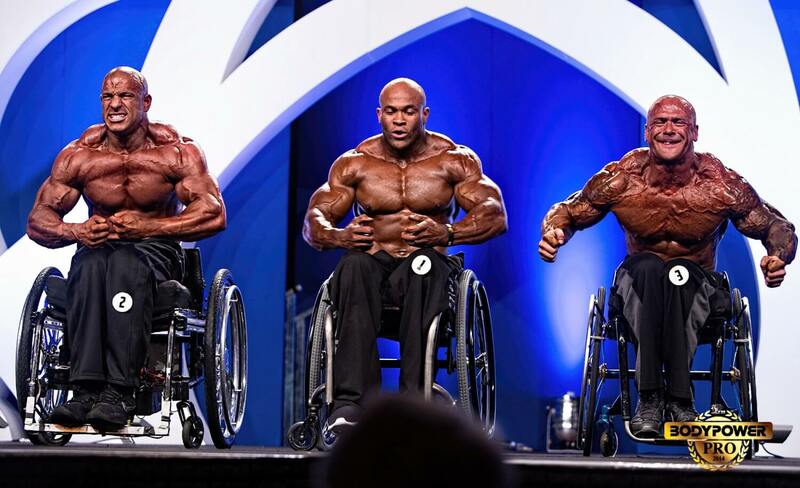 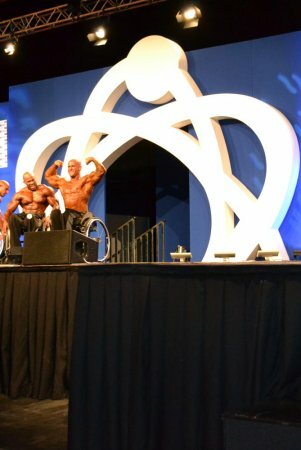 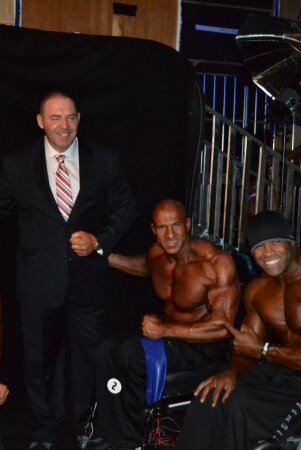 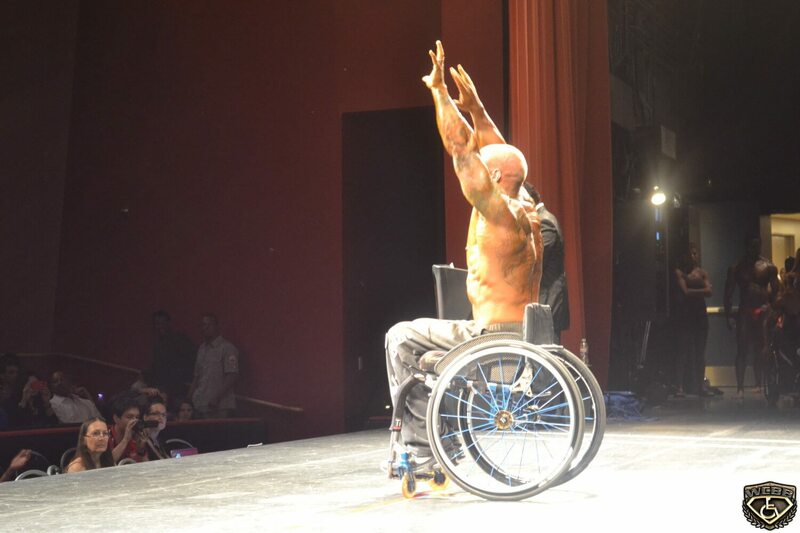 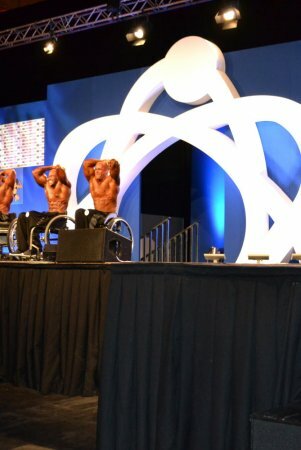 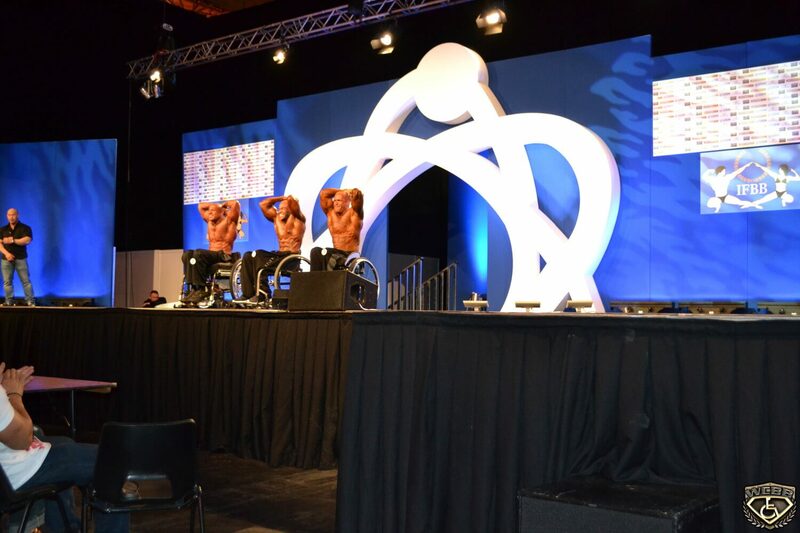 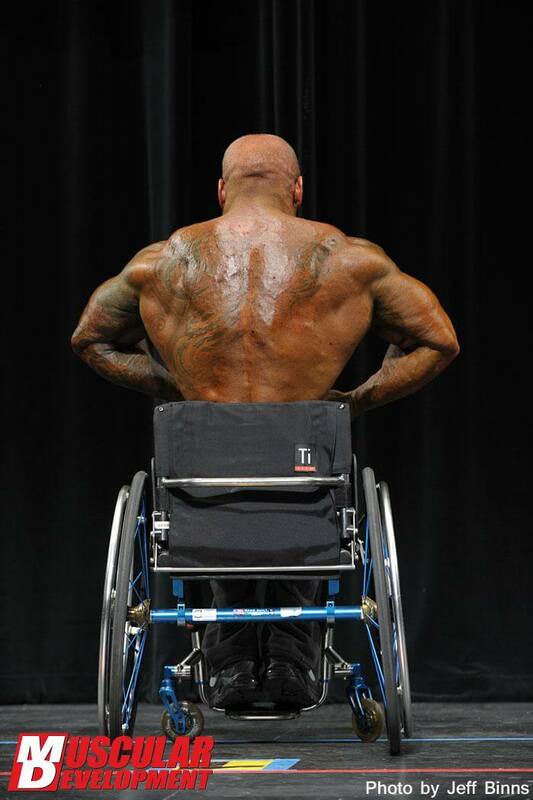 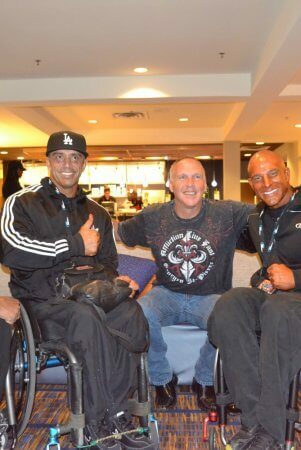 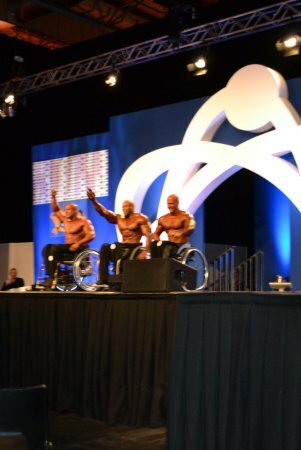 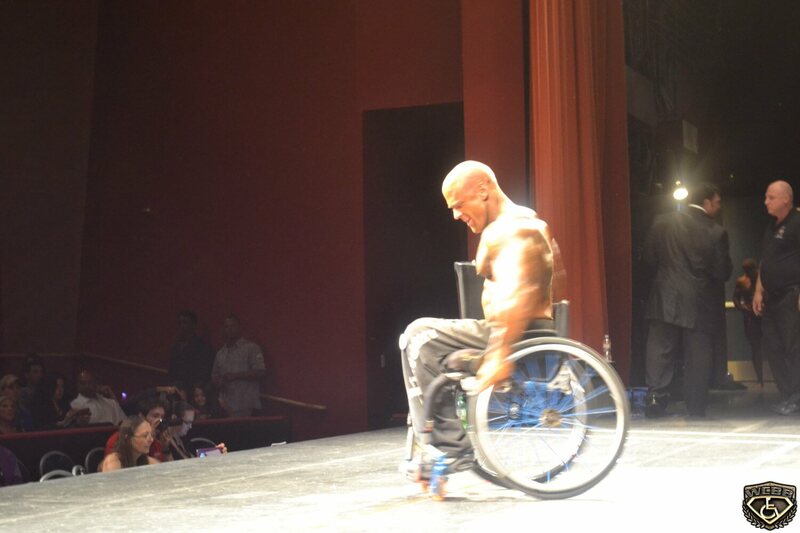 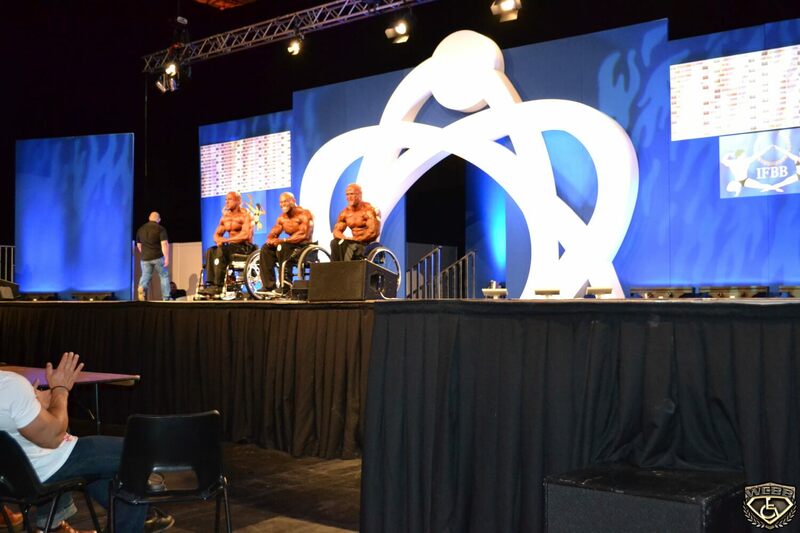 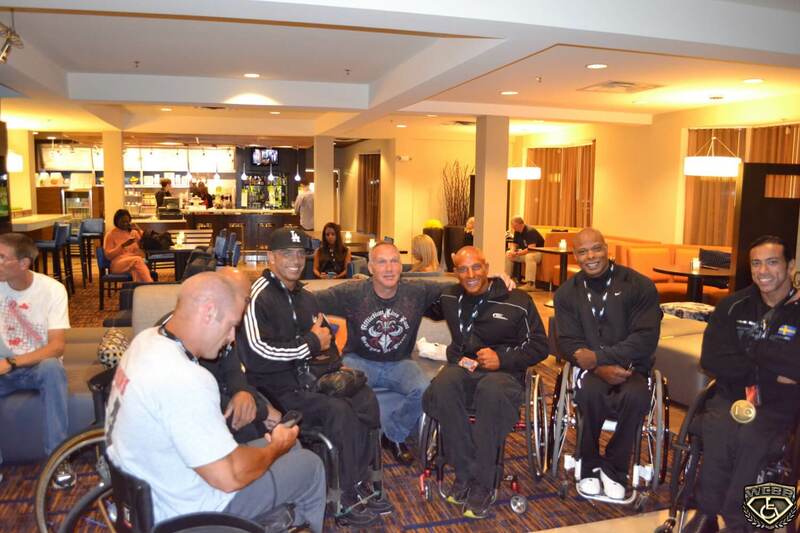 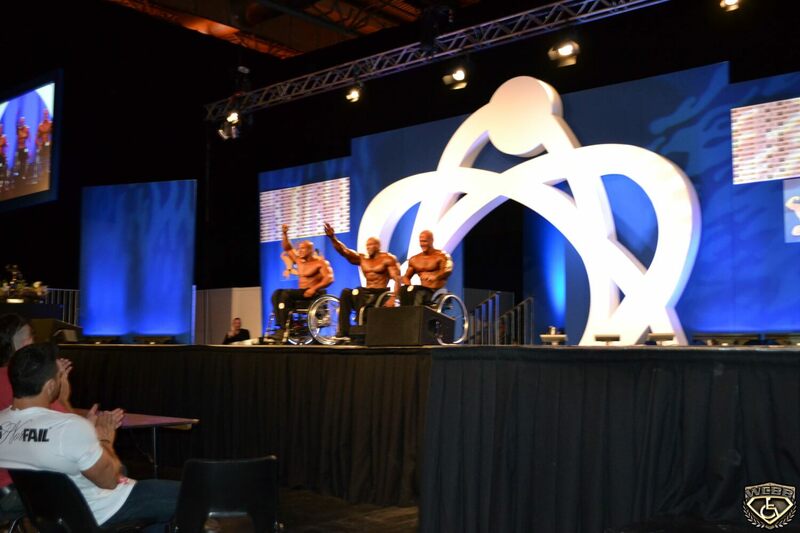 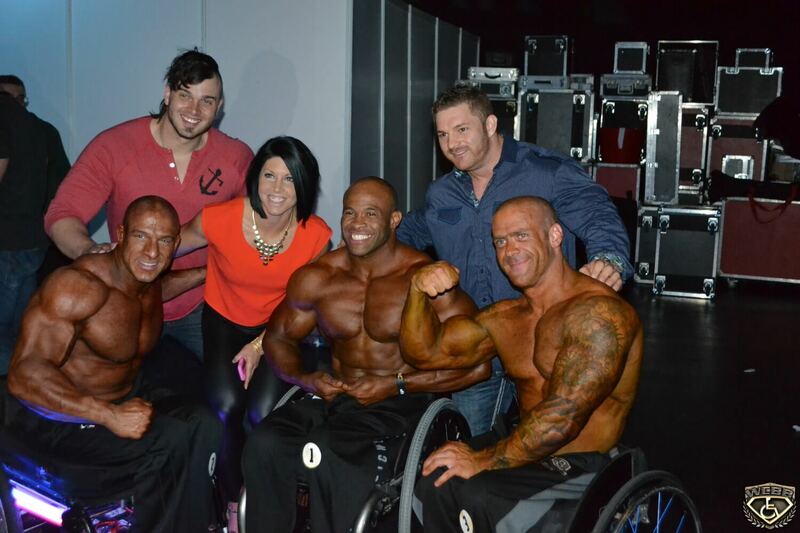 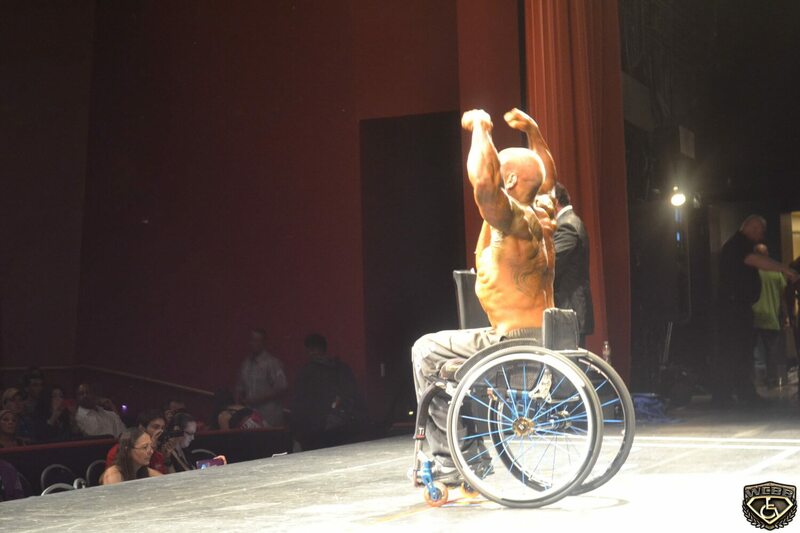 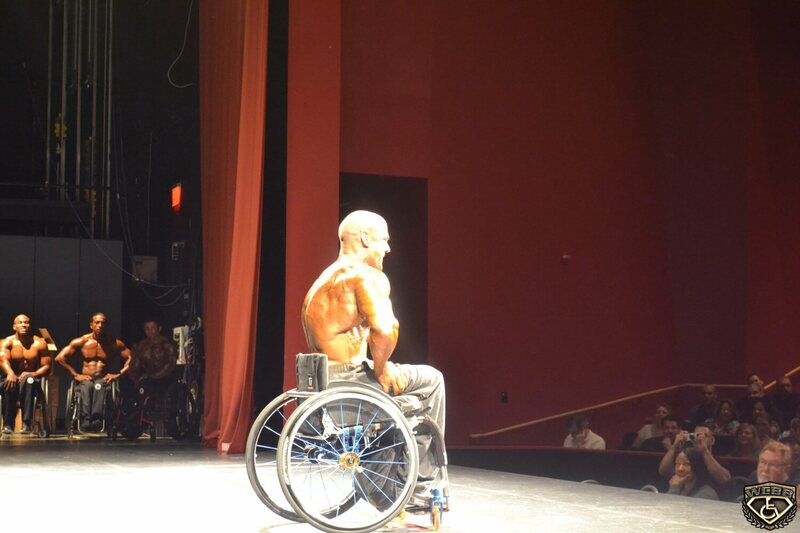 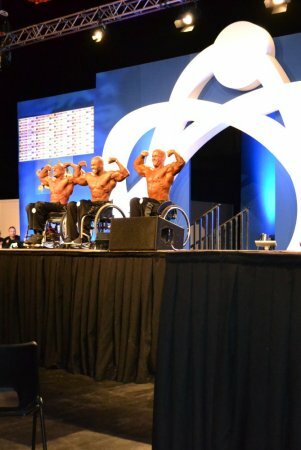 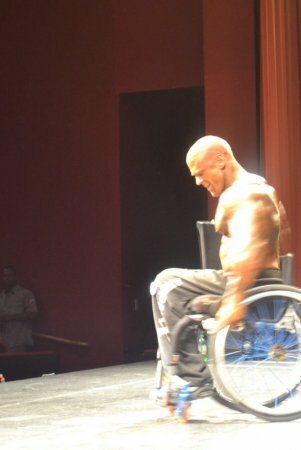 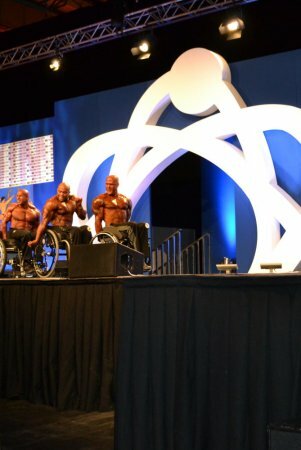 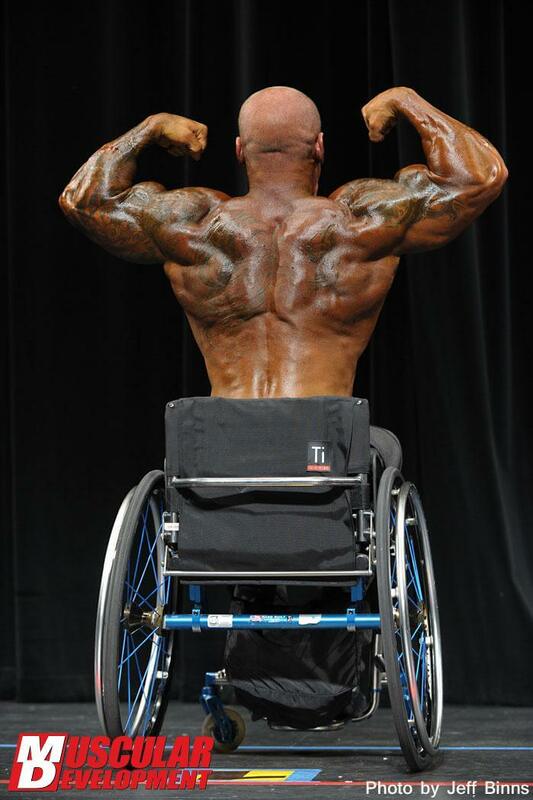 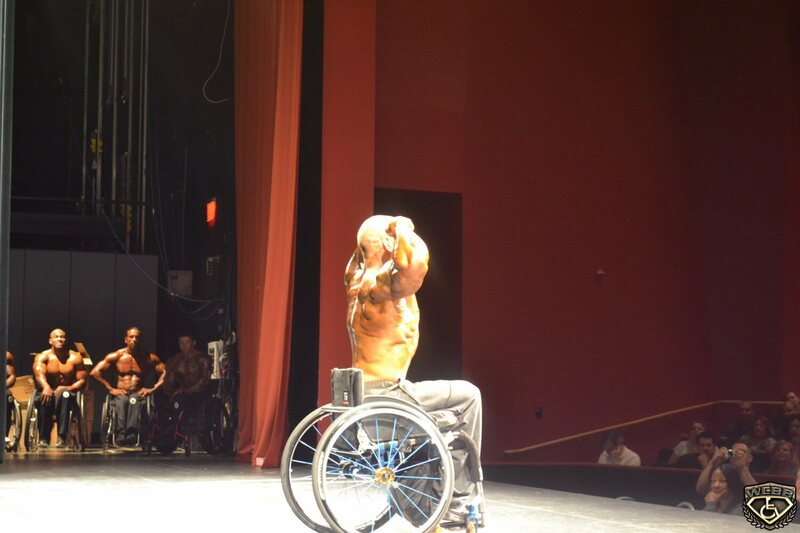 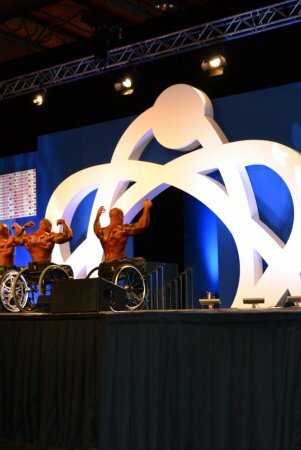 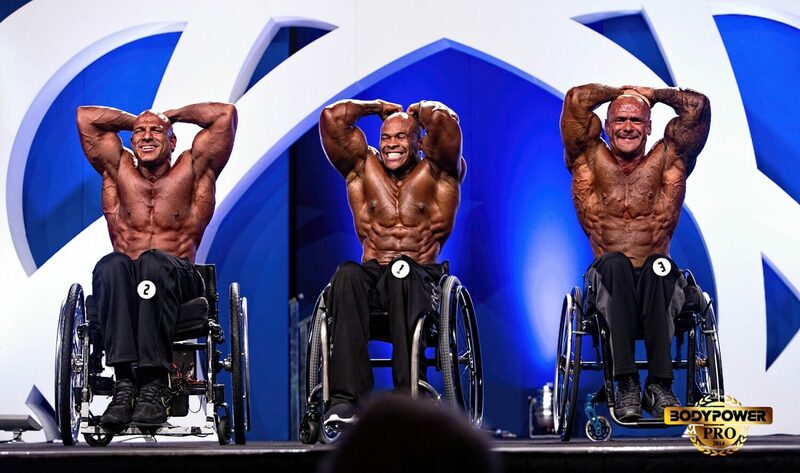 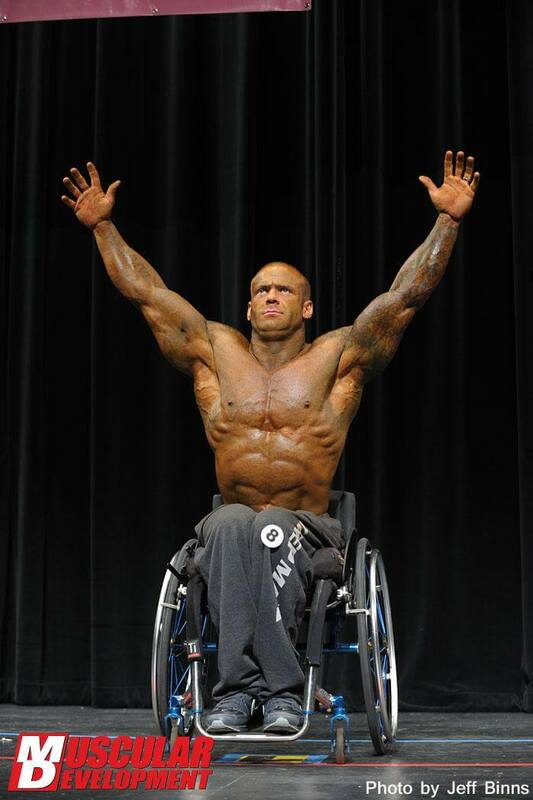 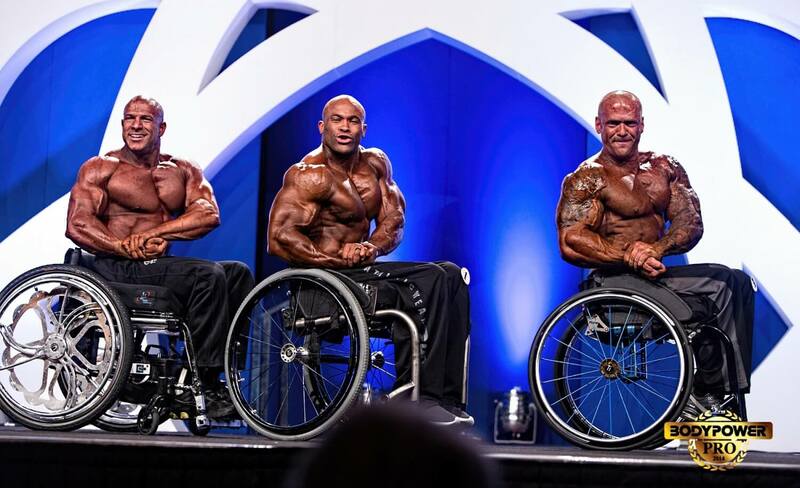 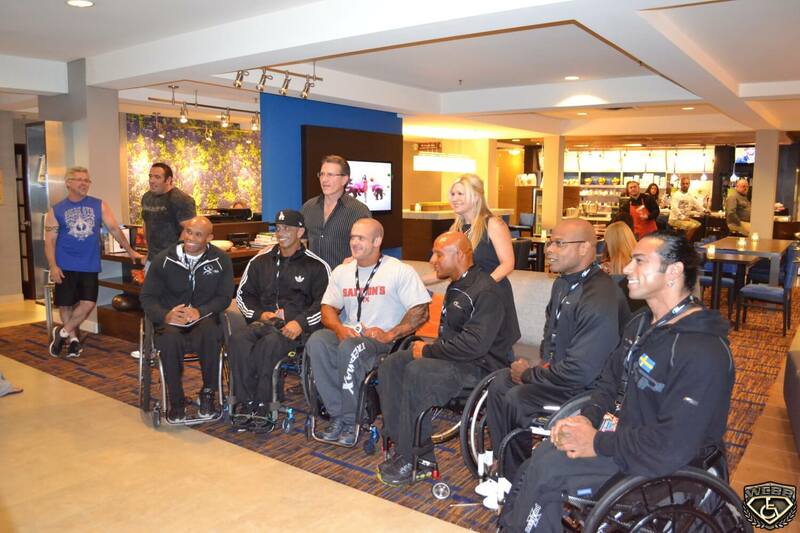 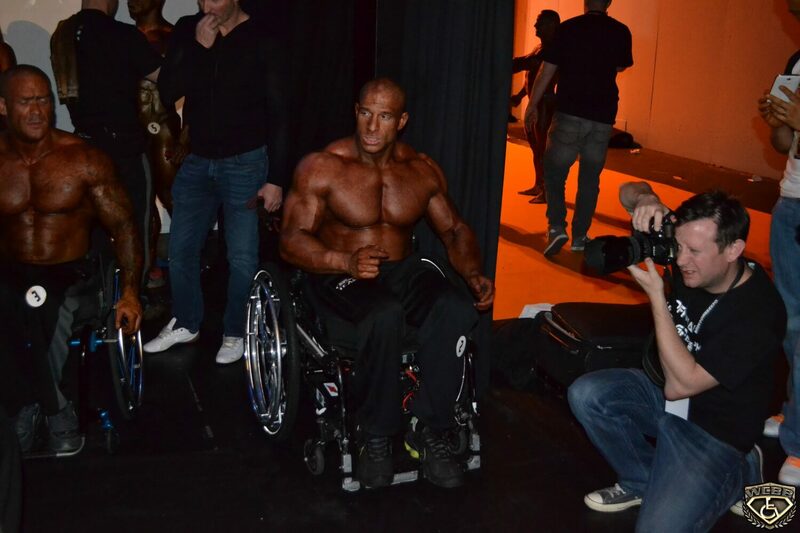 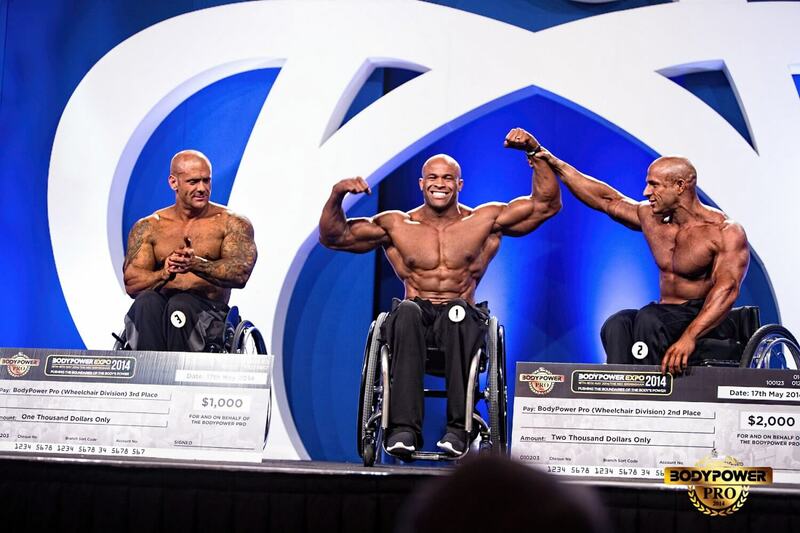 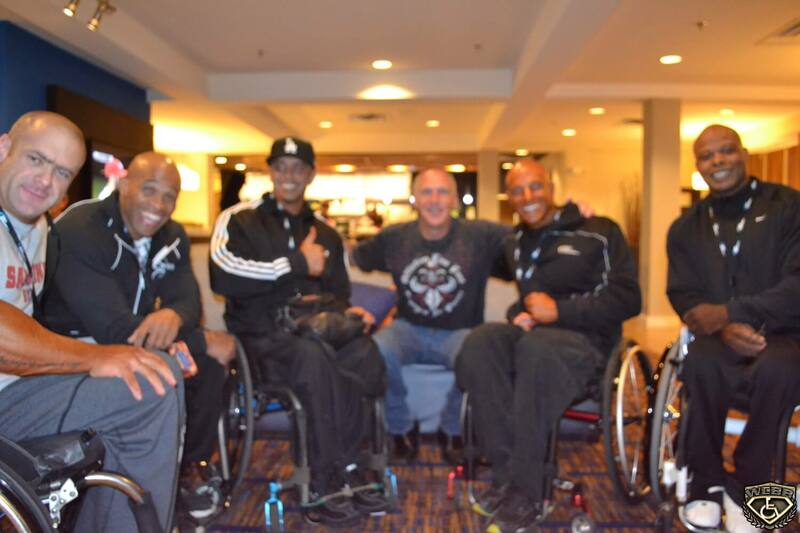 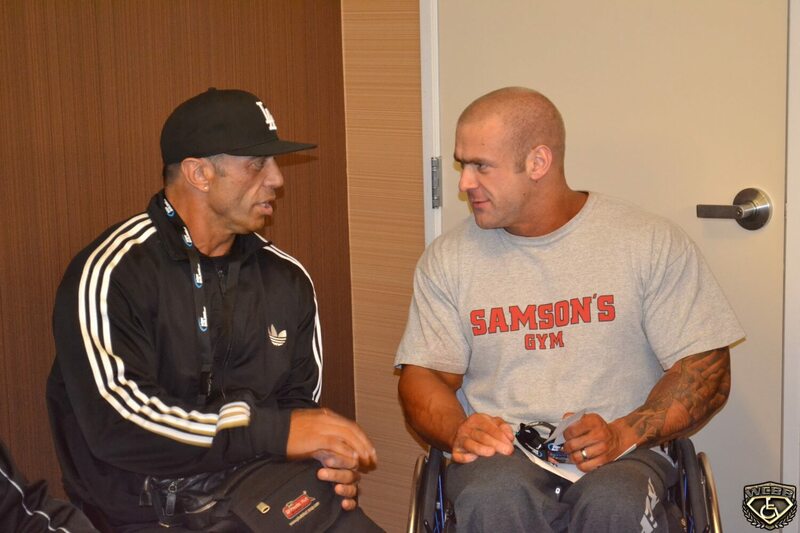 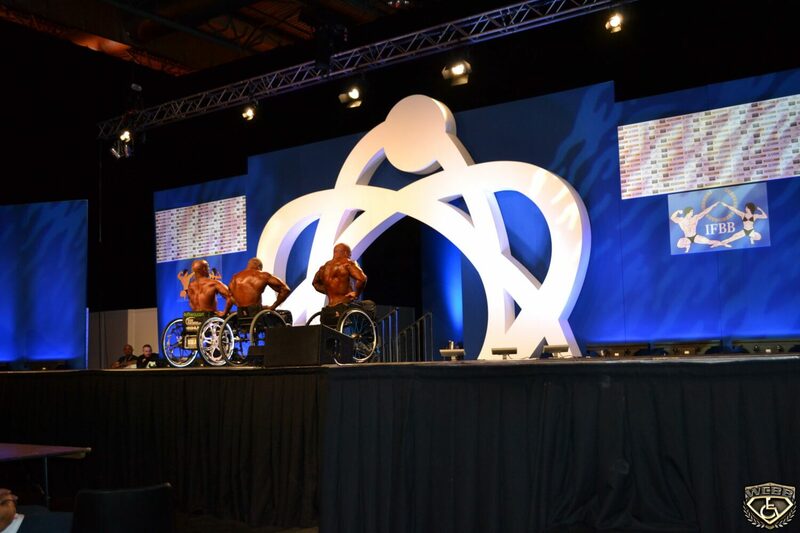 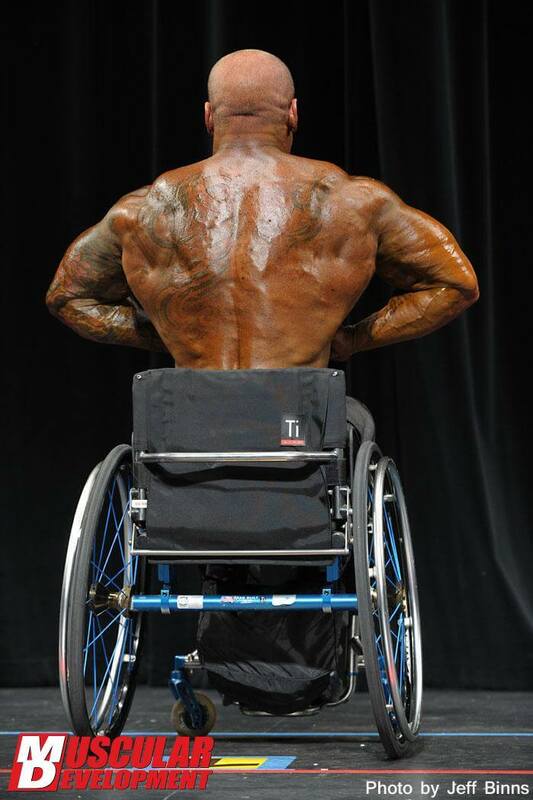 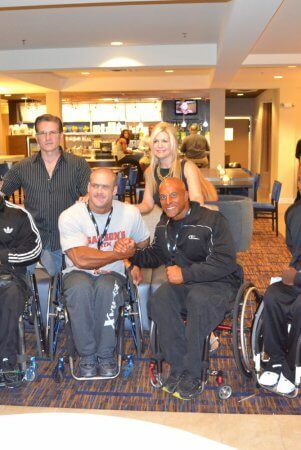 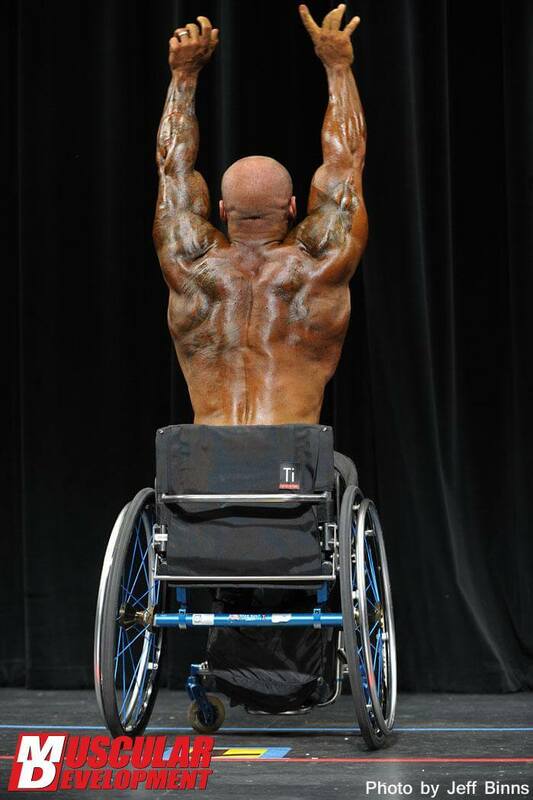 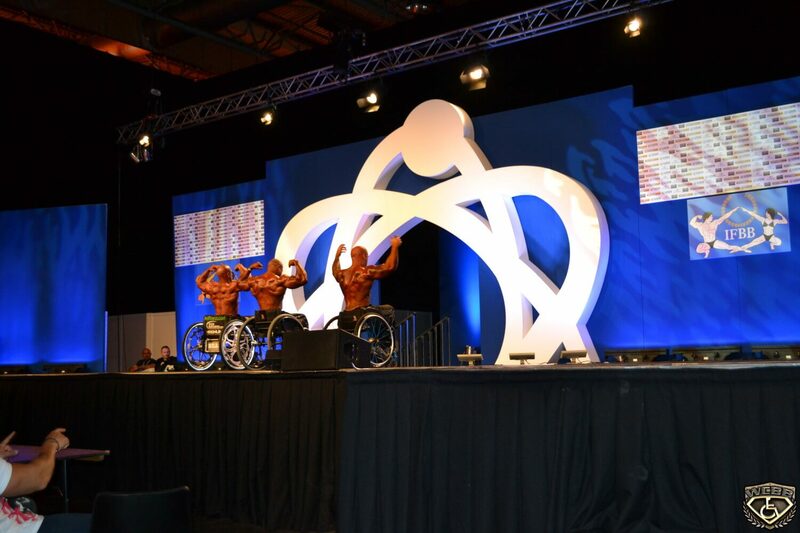 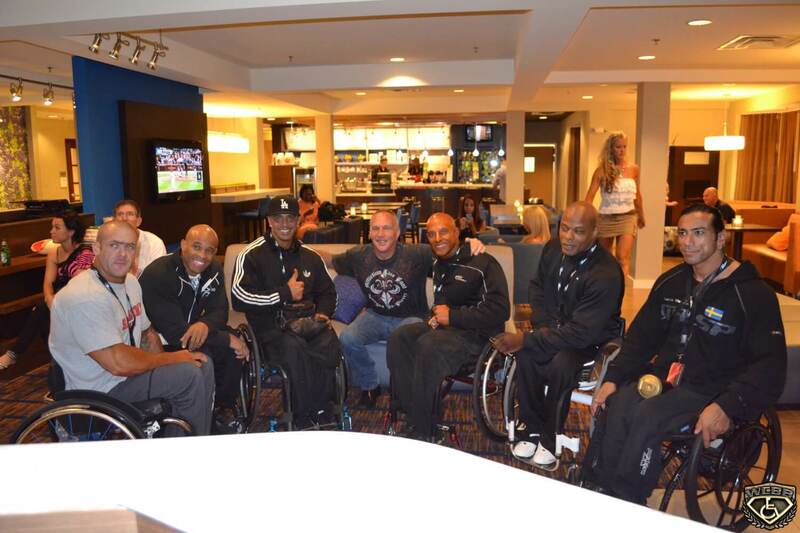 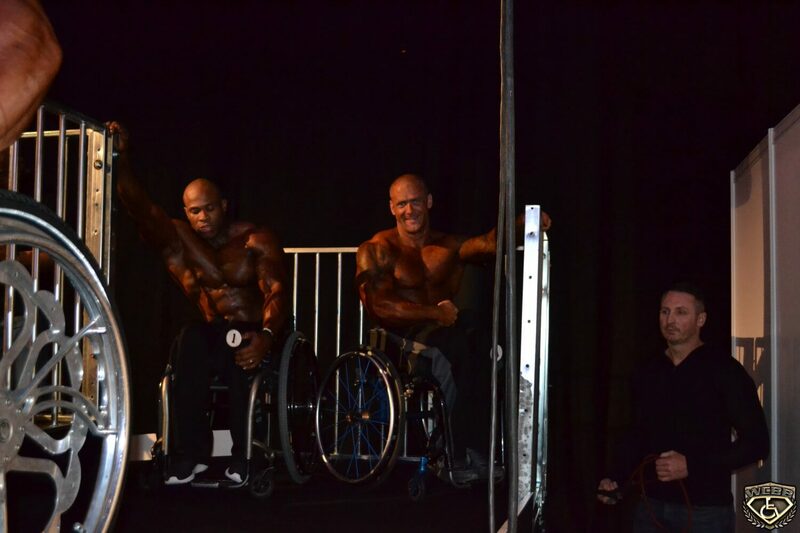 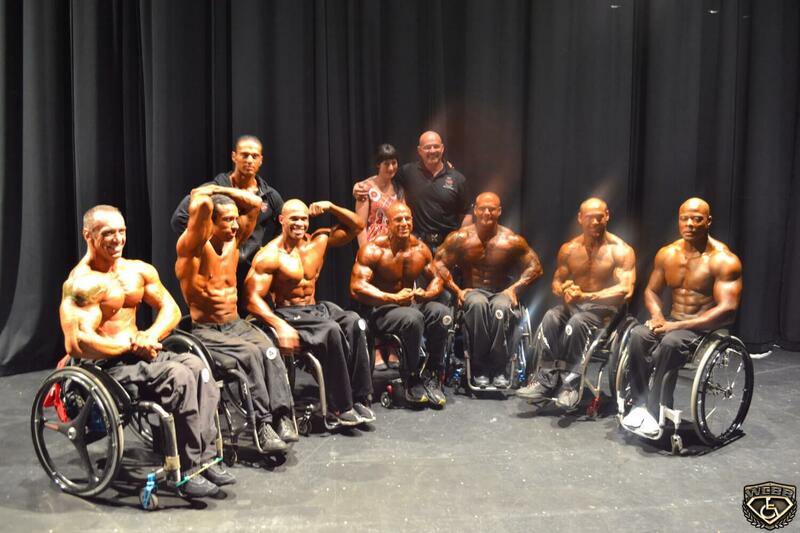 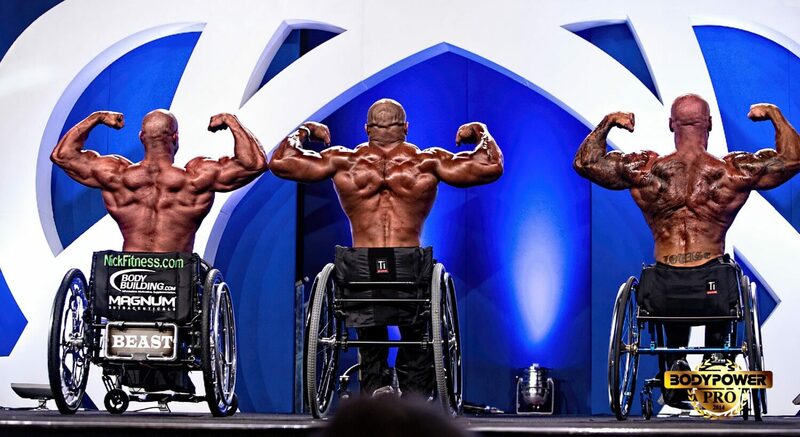 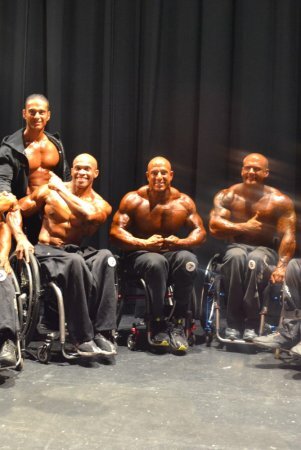 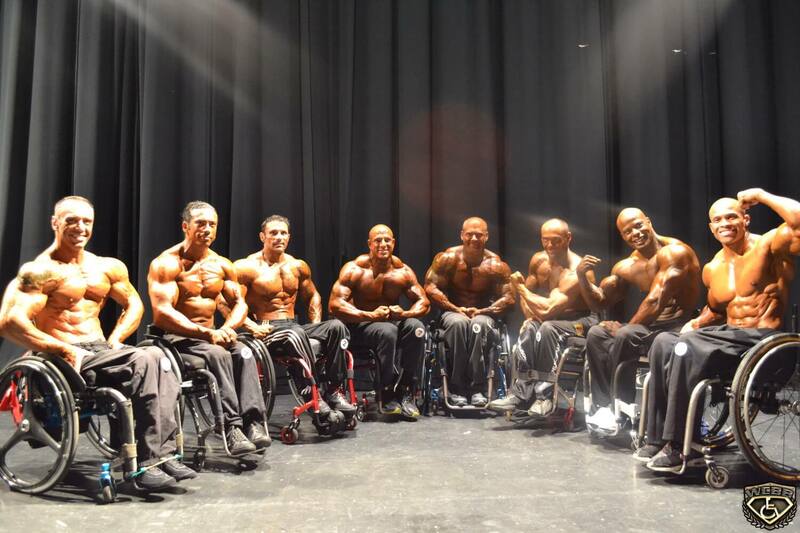 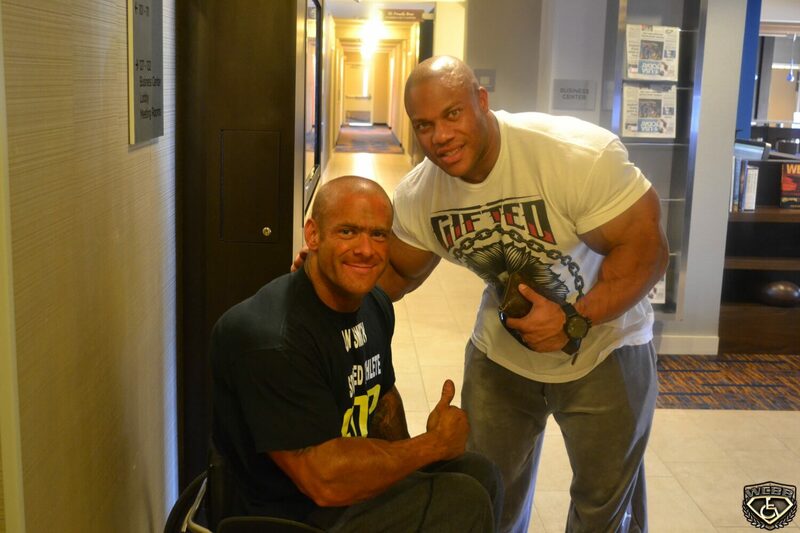 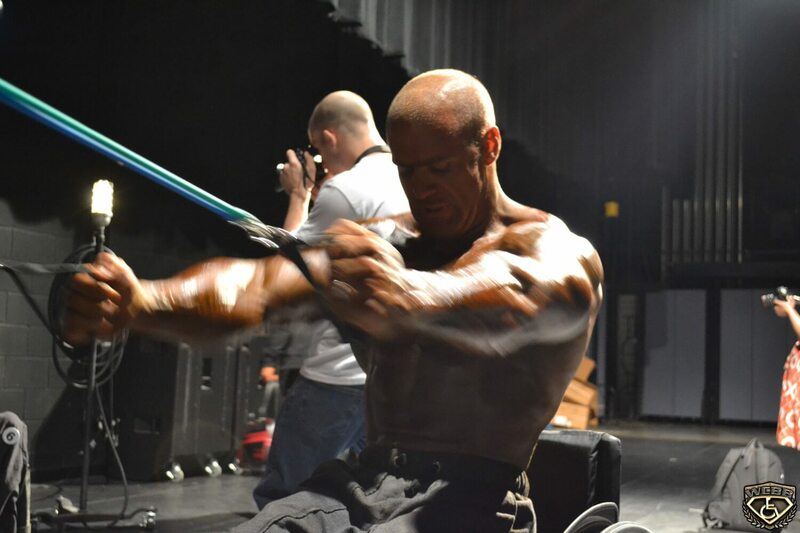 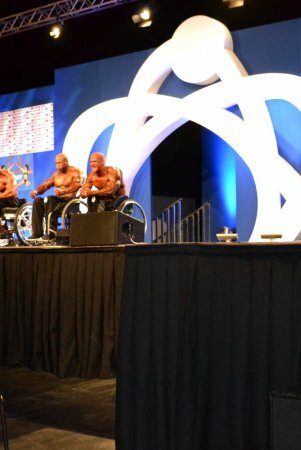 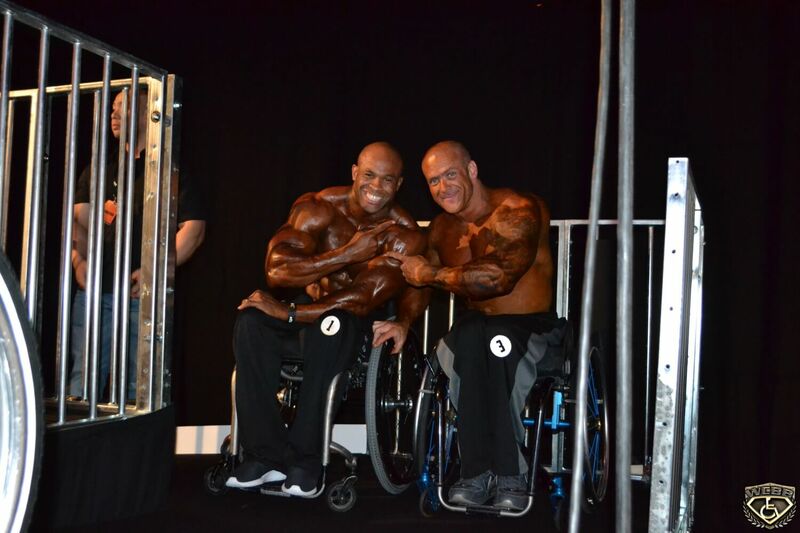 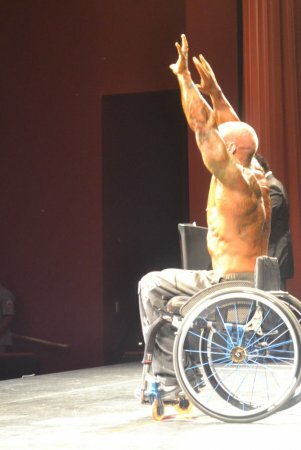 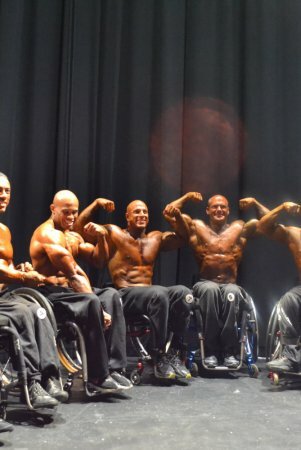 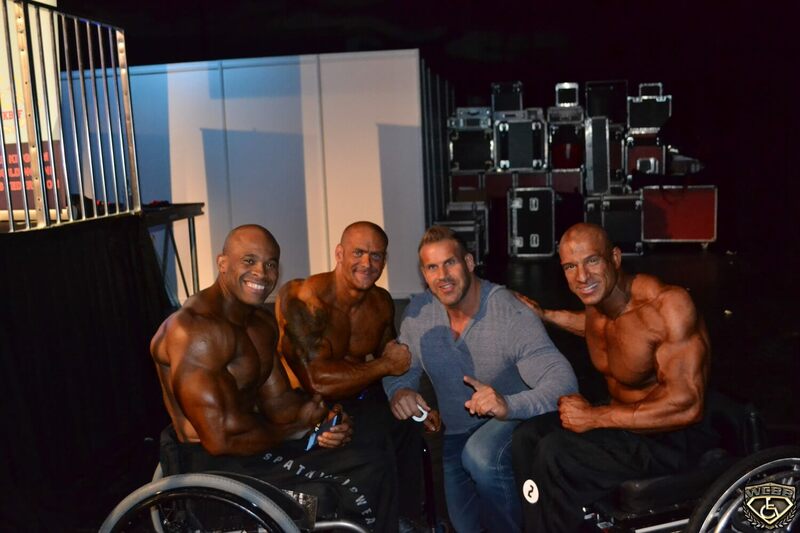 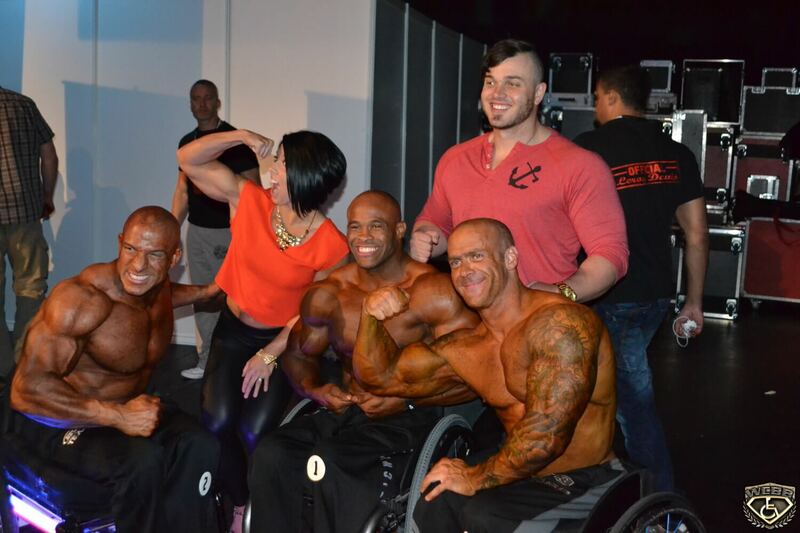 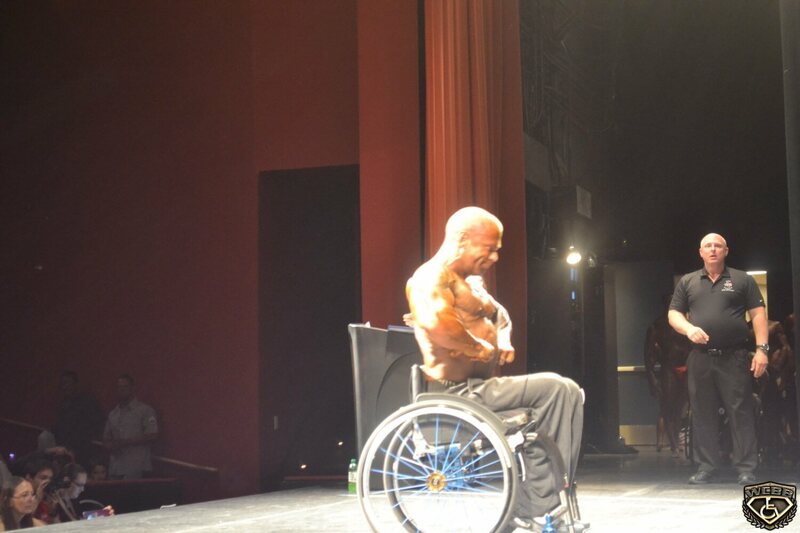 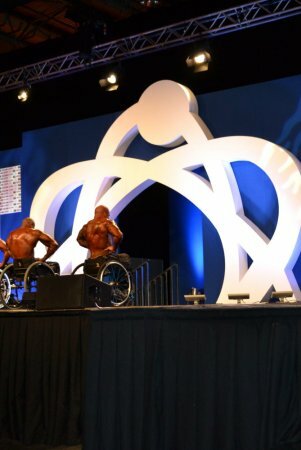 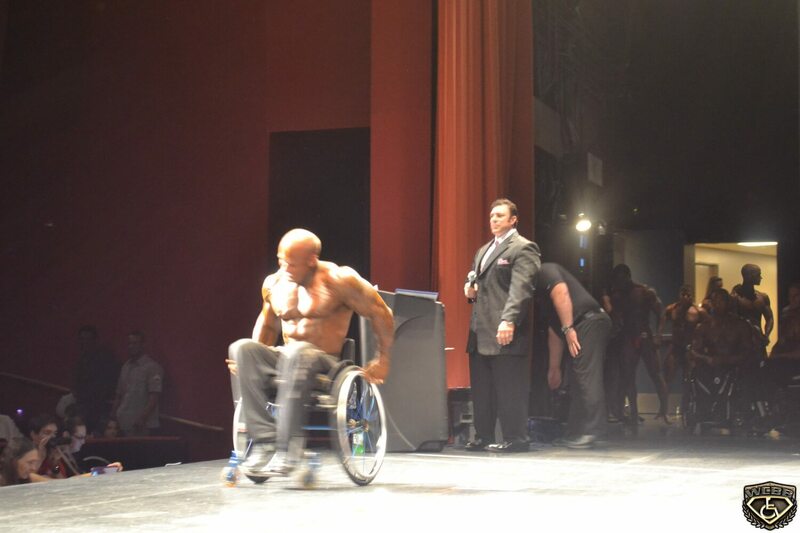 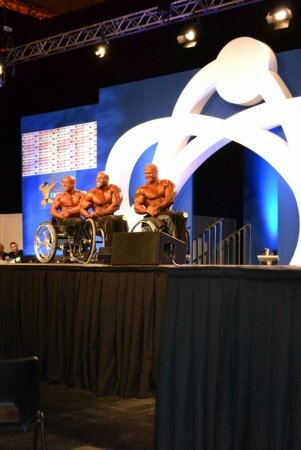 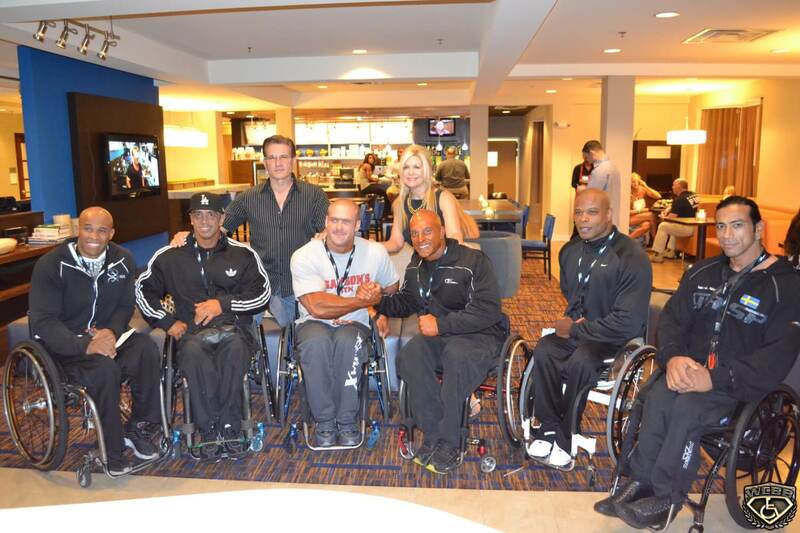 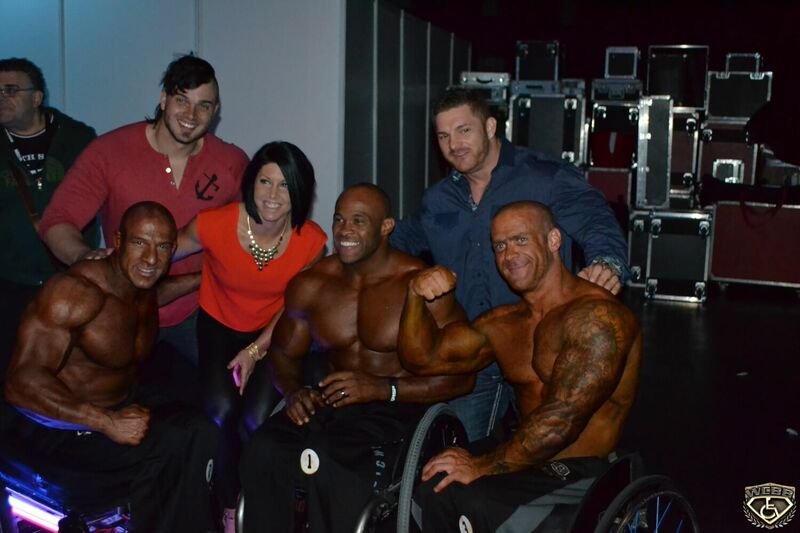 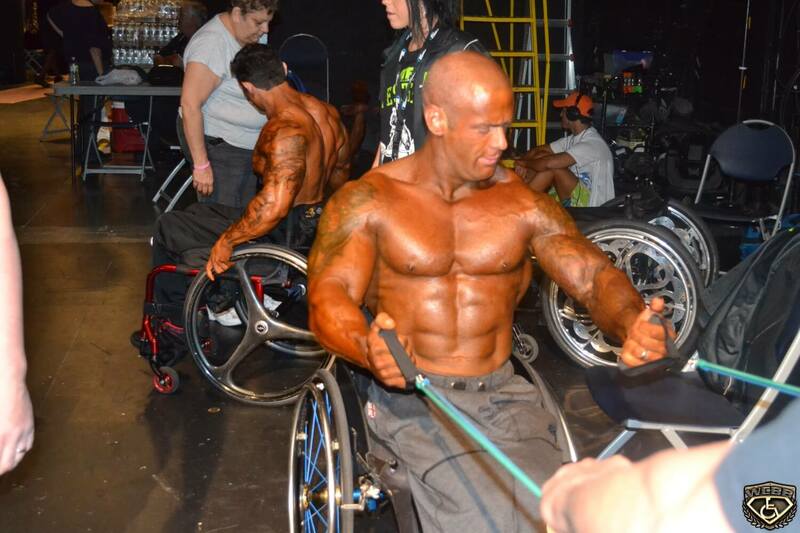 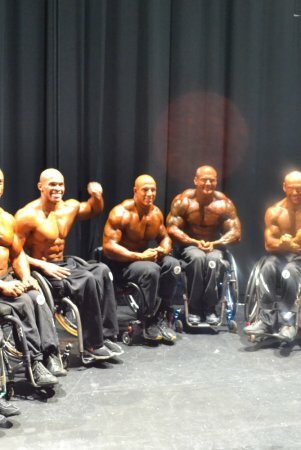 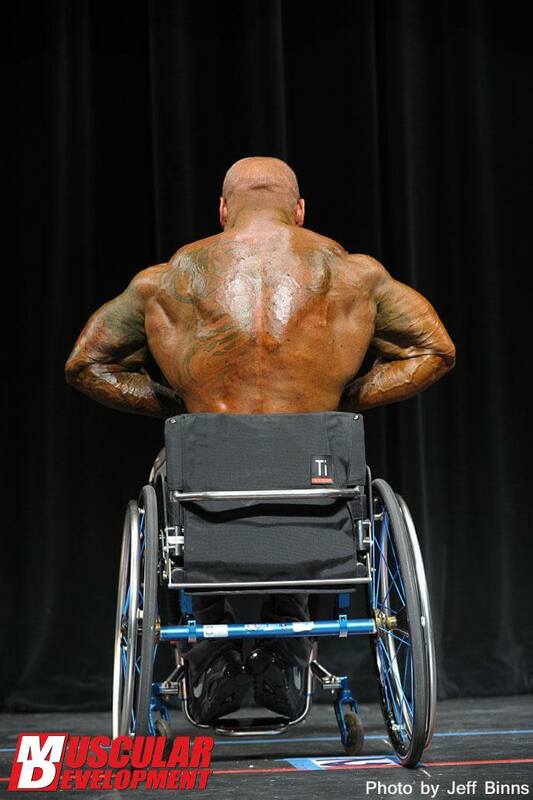 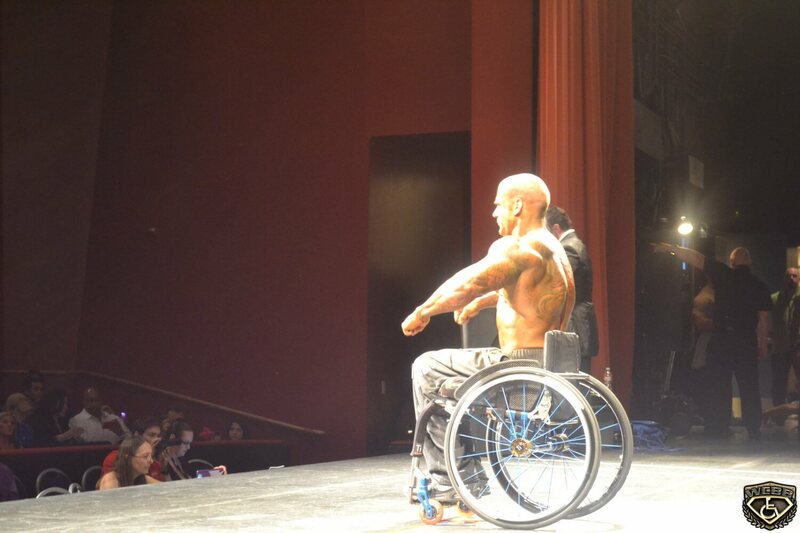 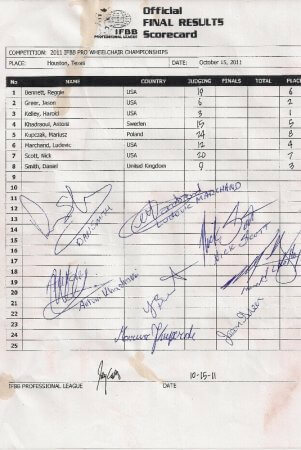 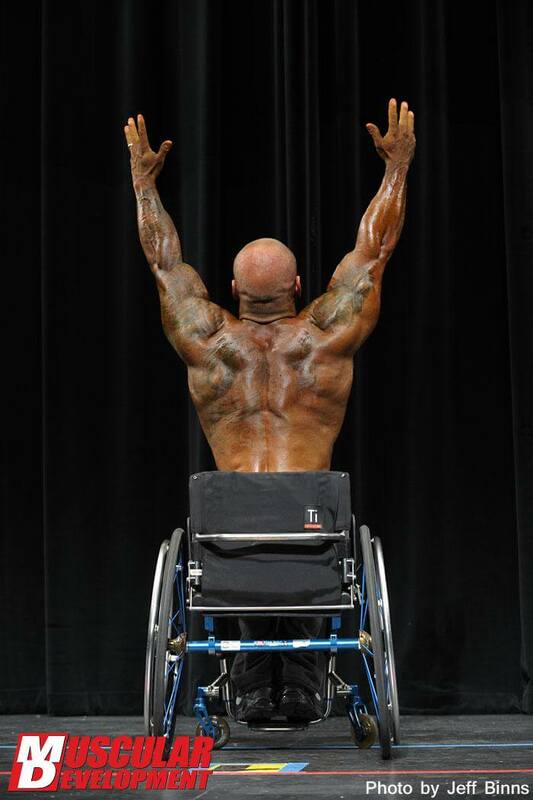 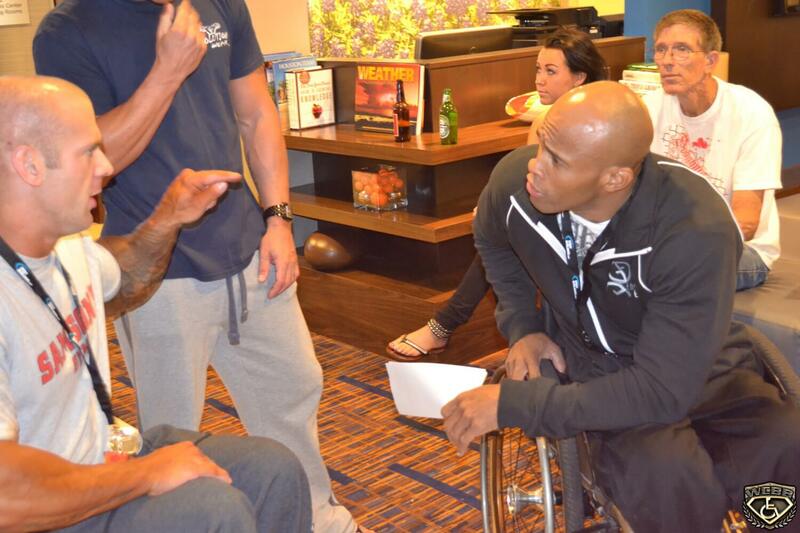 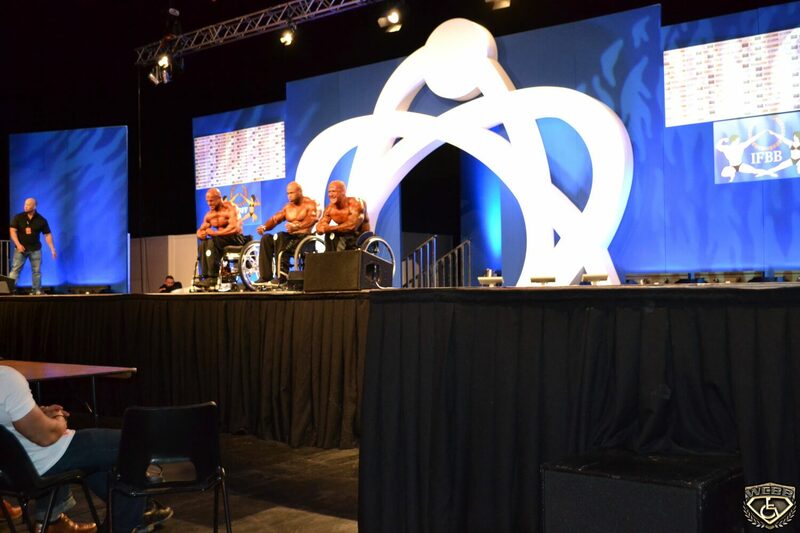 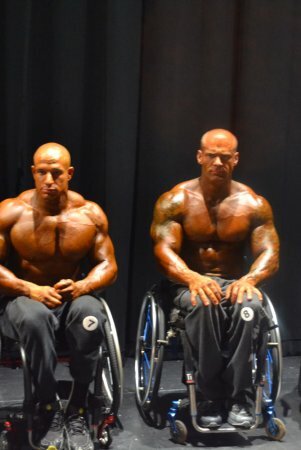 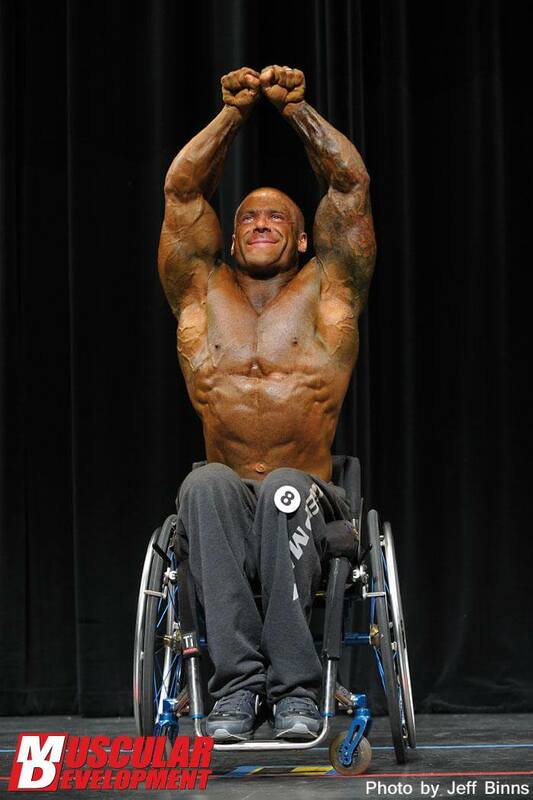 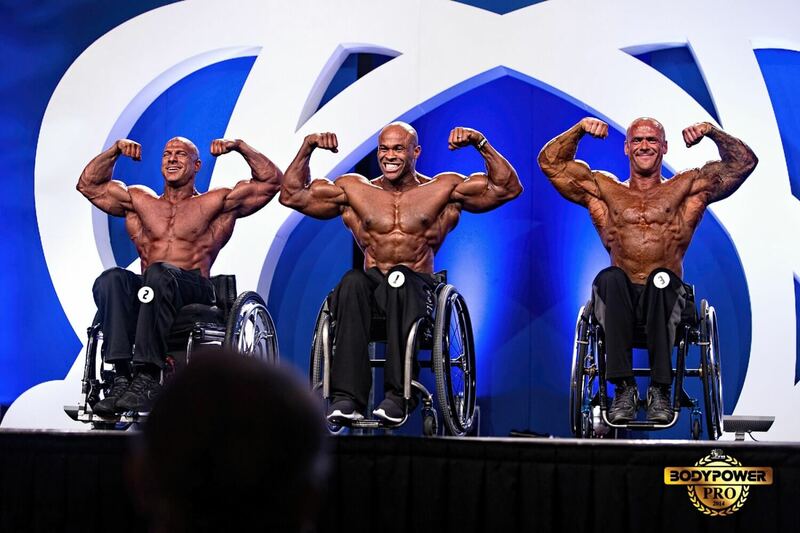 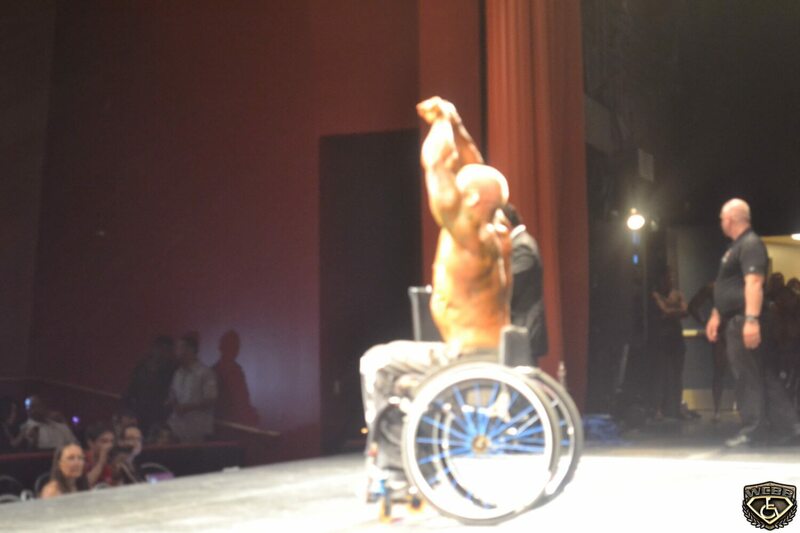 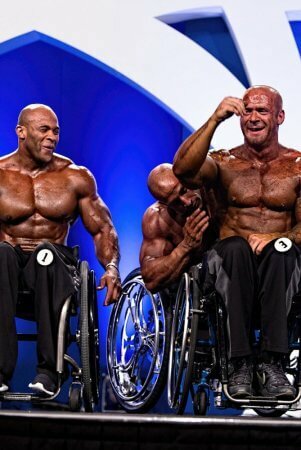 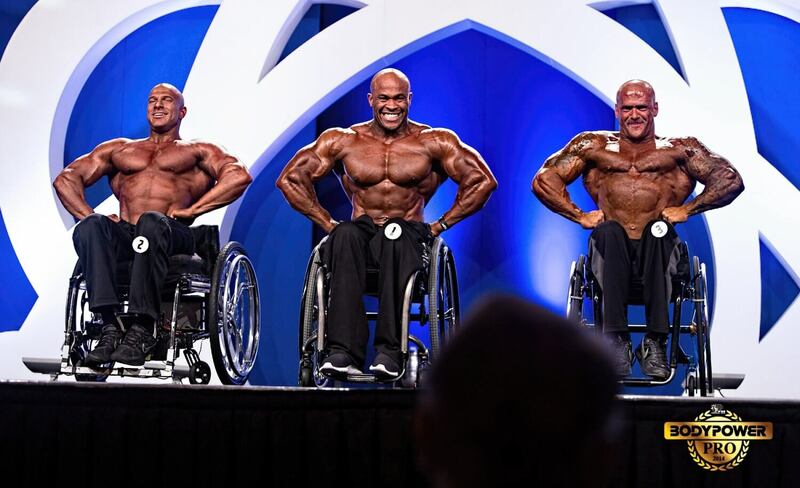 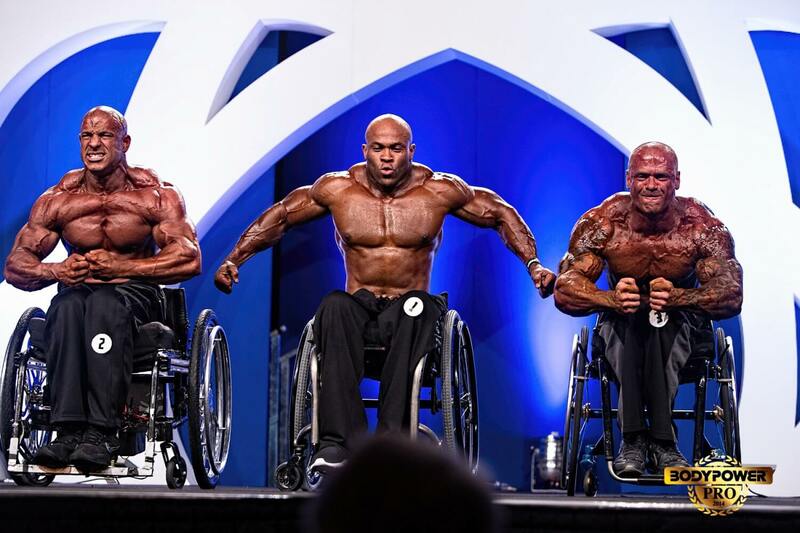 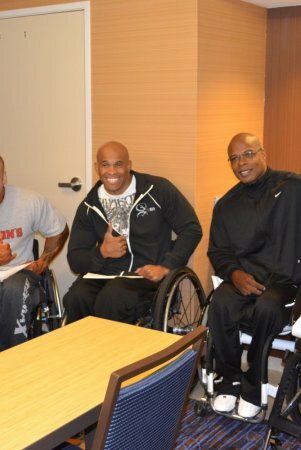 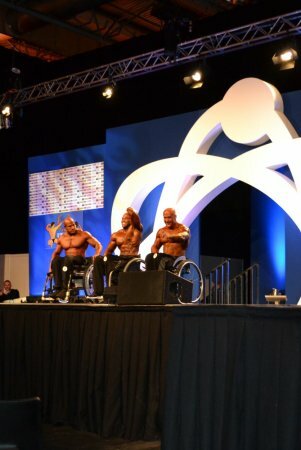 There were bodybuilders there from 45 countries and the competition in the wheelchair class was phenomenal. 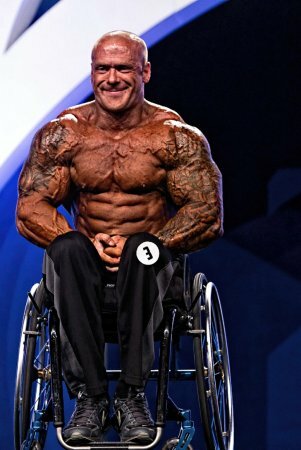 To come first against those guys is just brilliant.” Ultimately Dan wants to become a Pro body builder and hopes to be able to compete in America next year. 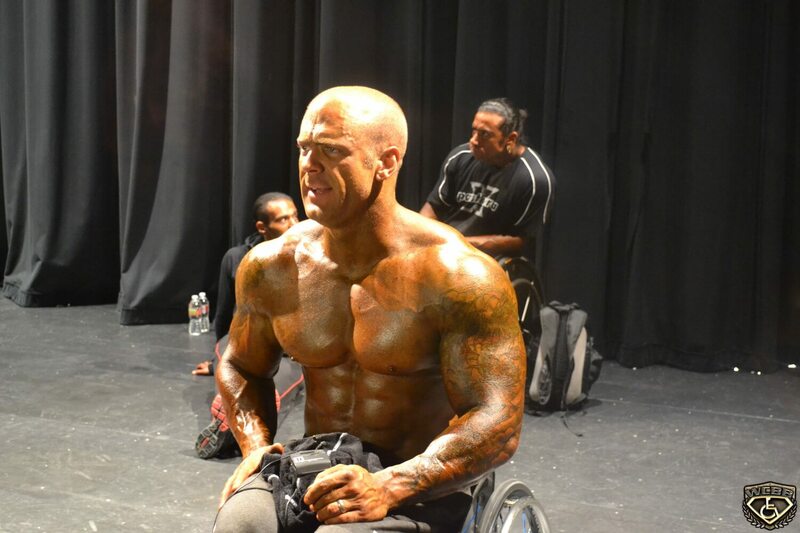 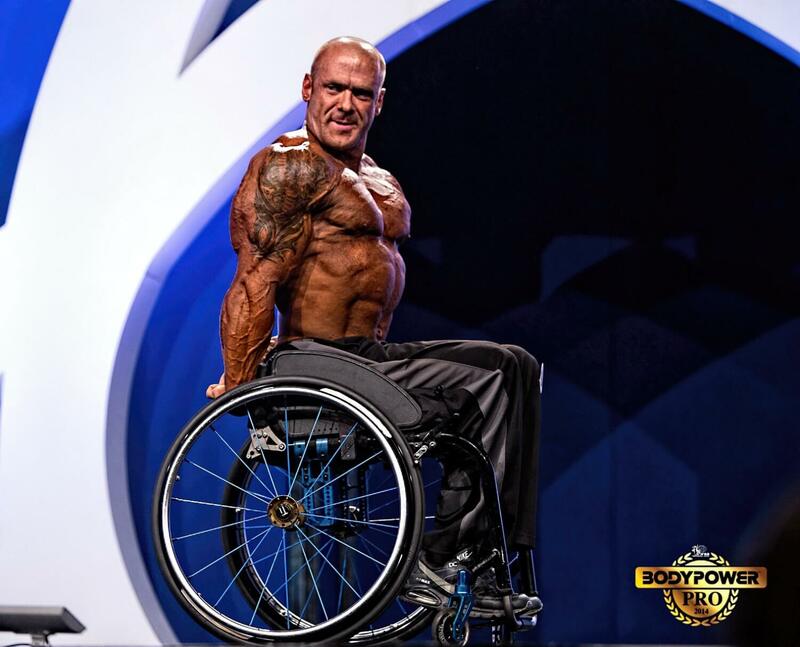 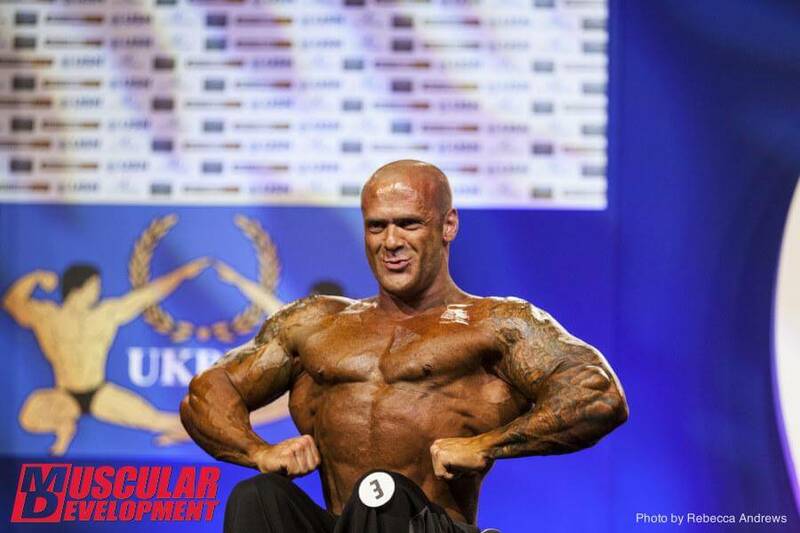 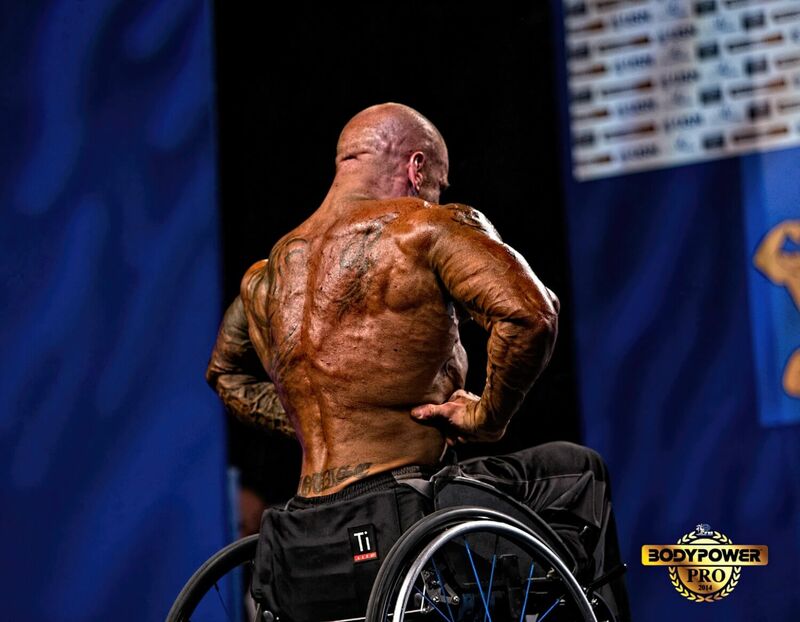 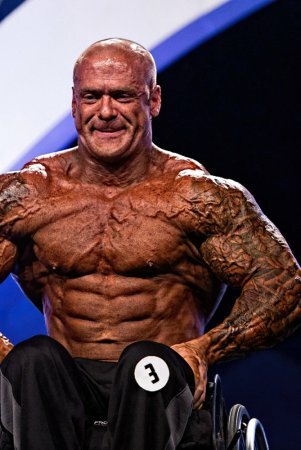 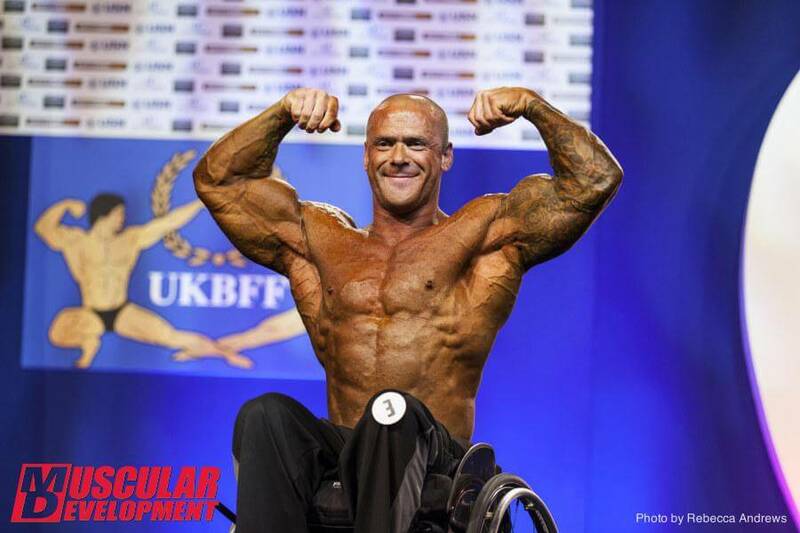 Although this will take him onto the US Pro circuit, Dan intends to keep the UK as his base and hopefully see a wheelchair class added into UKBFF (UK Bodybuilding and Fitness Federation) competitions before too long. 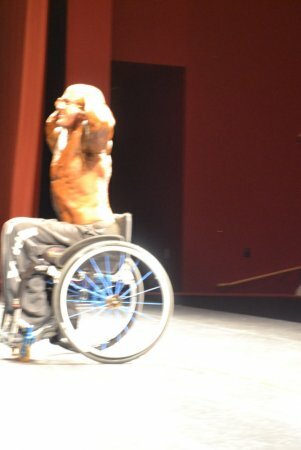 Fell through a roof in 2006 breaking my spine at T12 leaving me paralyzed from the chest down. 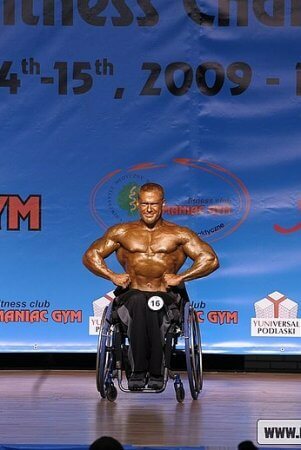 But luckily after 6 years, I'm able to get to the gym with ankle supports and sticks. 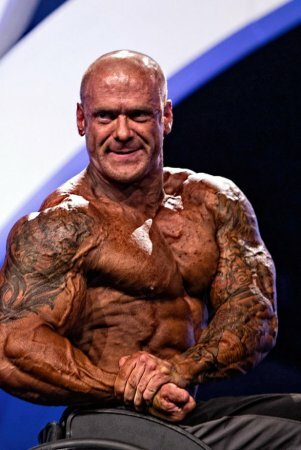 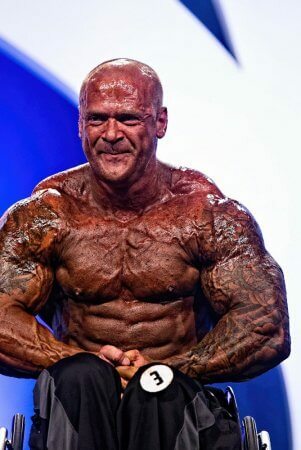 I got started in bodybuilding because I was always a very small bloke and wanted to beef up a bit so I didn't keep getting asked for ID in every club I went to. 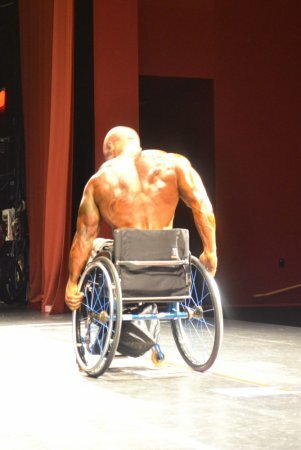 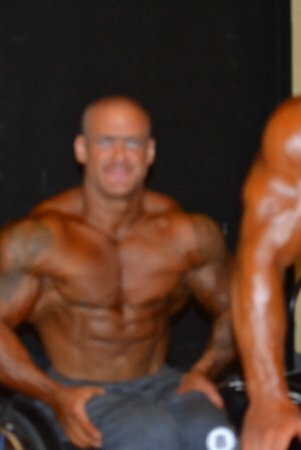 I was a bodybuilder before my accident as a hobby. 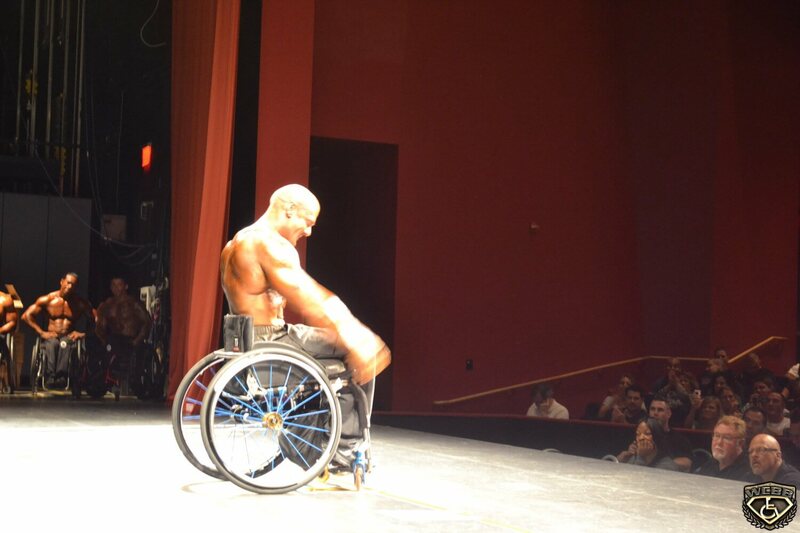 After the accident, I had the time to train and be the best I can be. 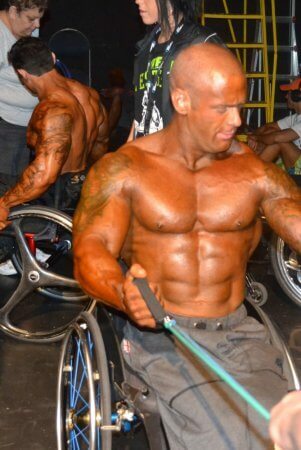 Well, my friend dragged me back down to the gym that I used to train in and got me working out again. 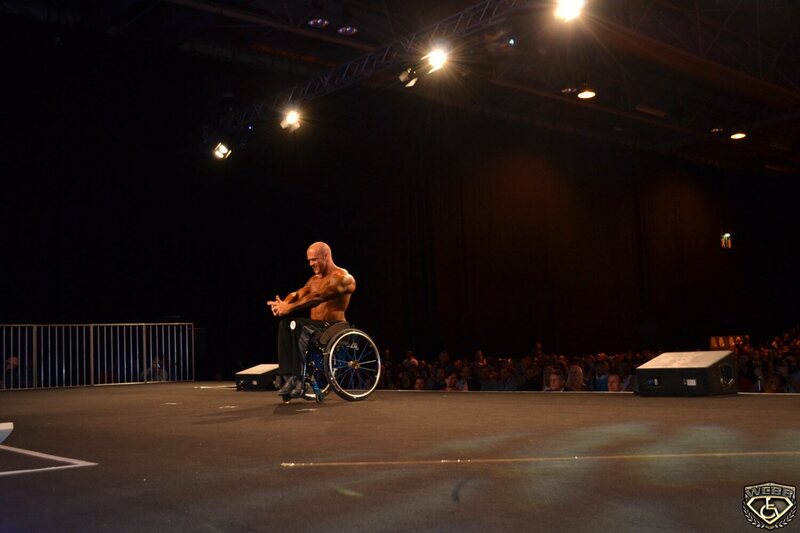 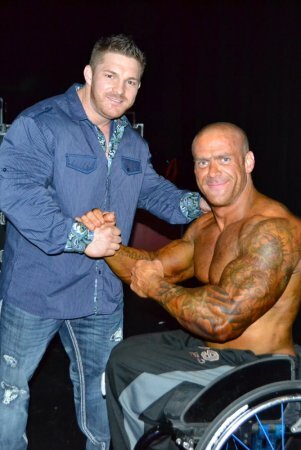 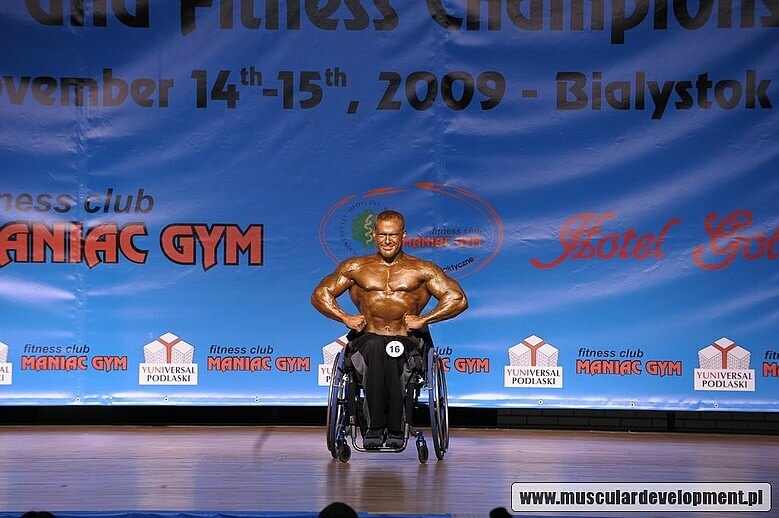 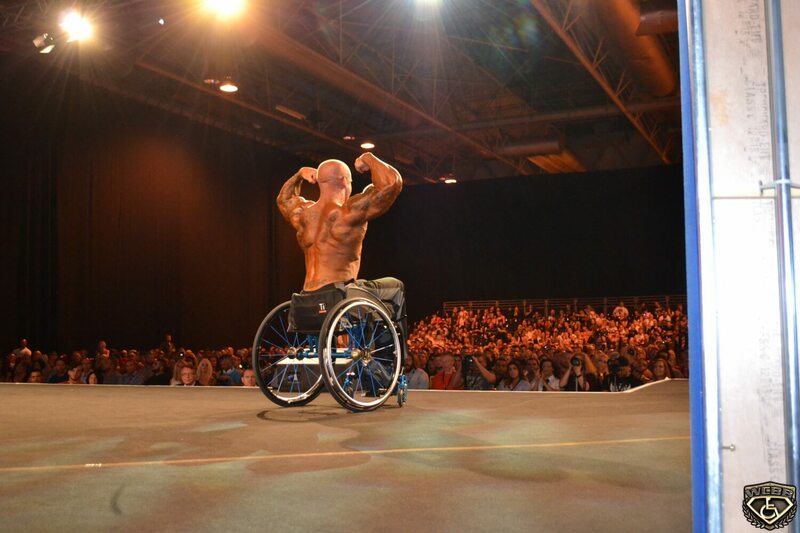 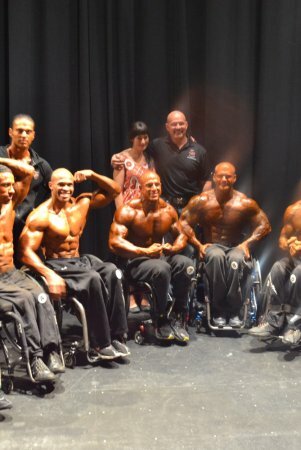 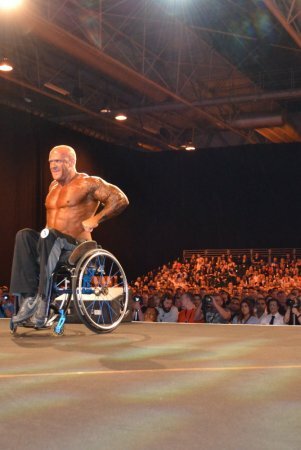 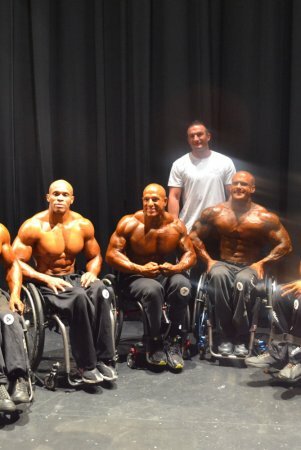 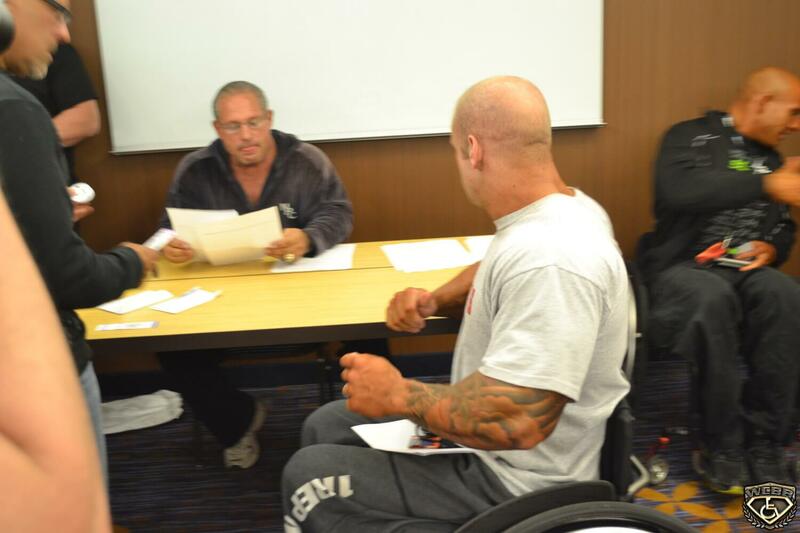 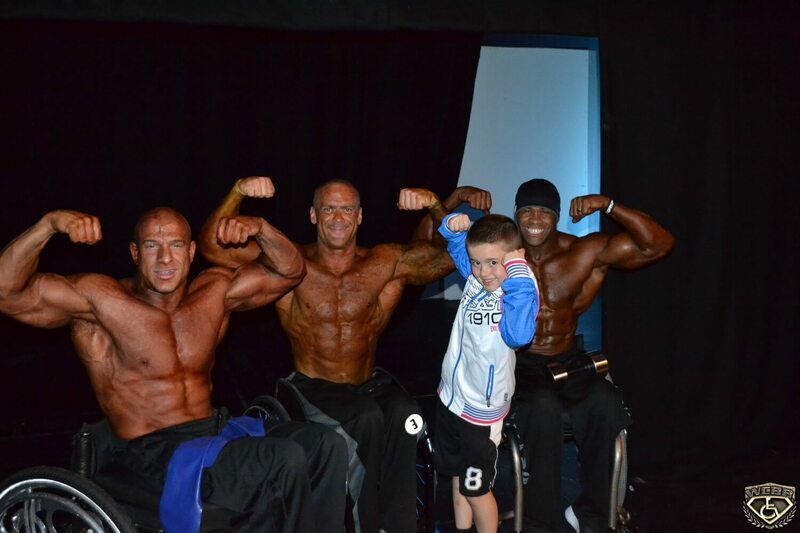 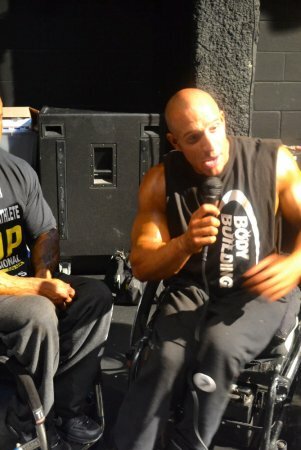 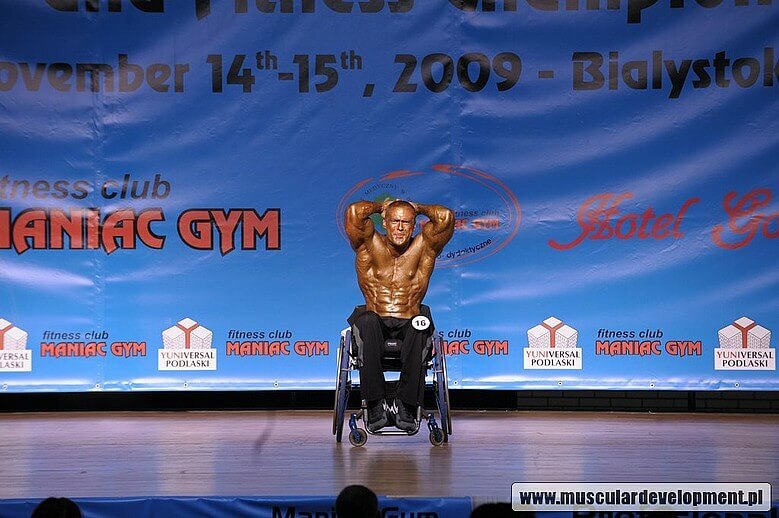 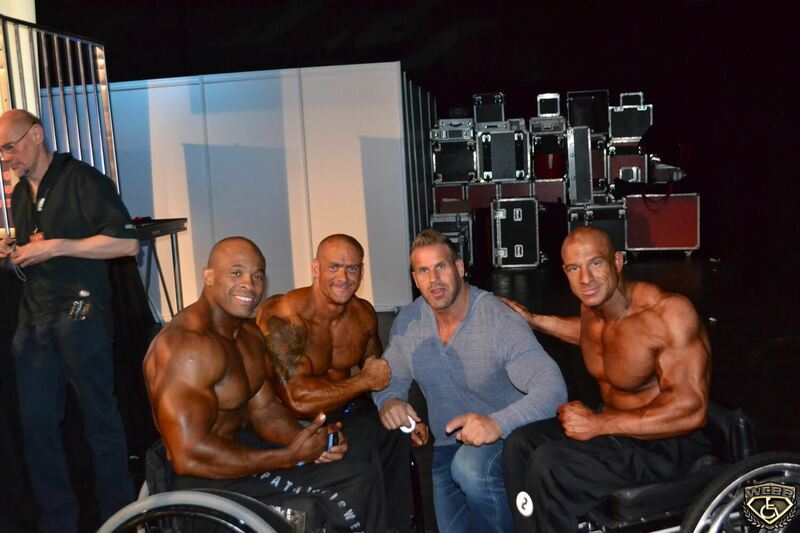 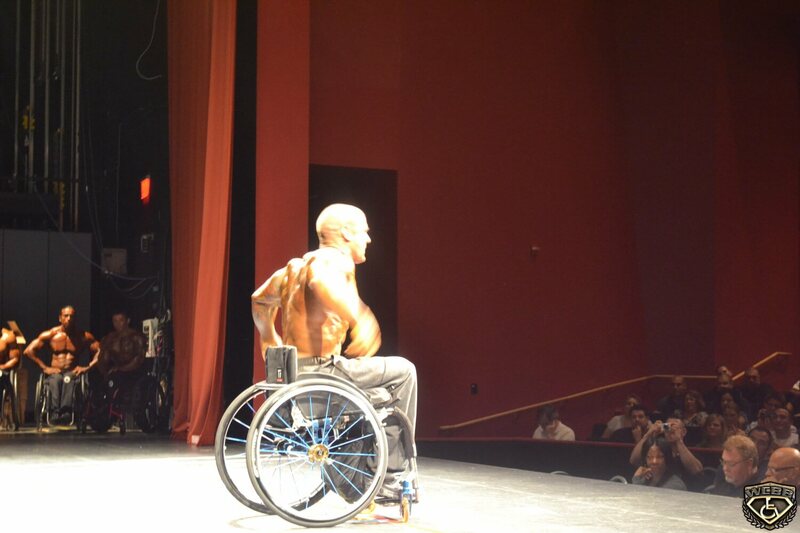 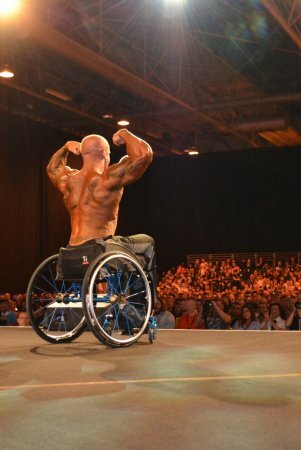 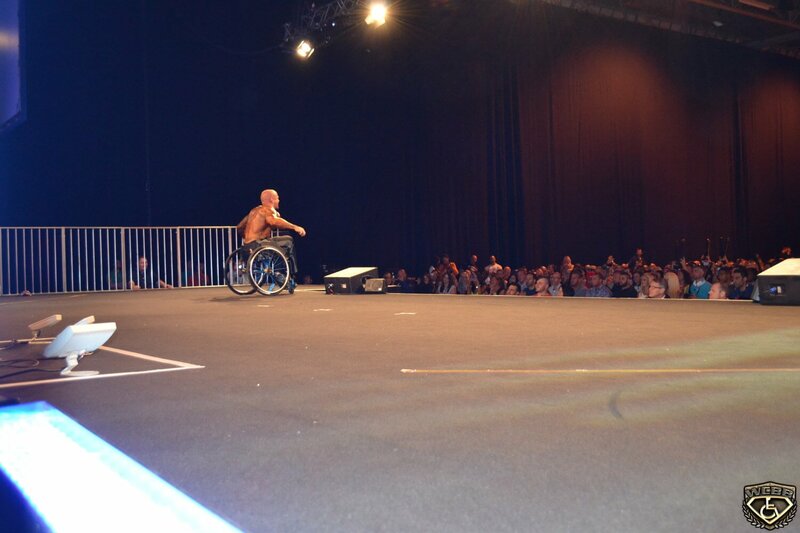 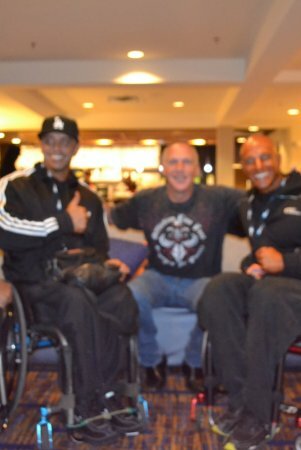 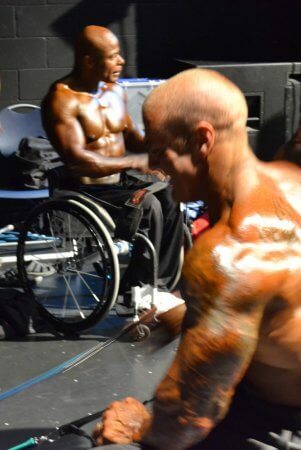 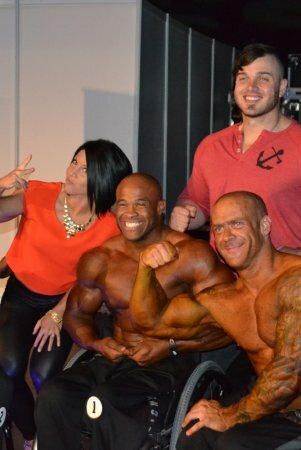 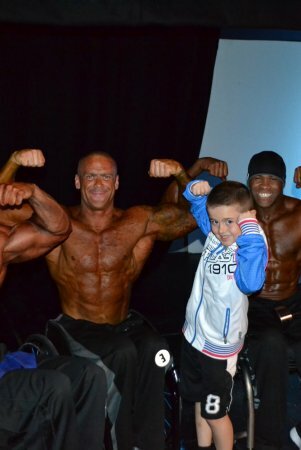 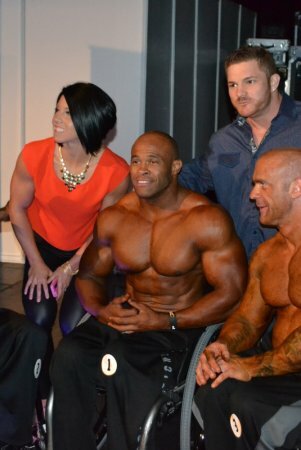 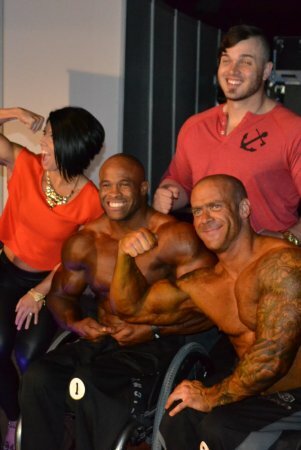 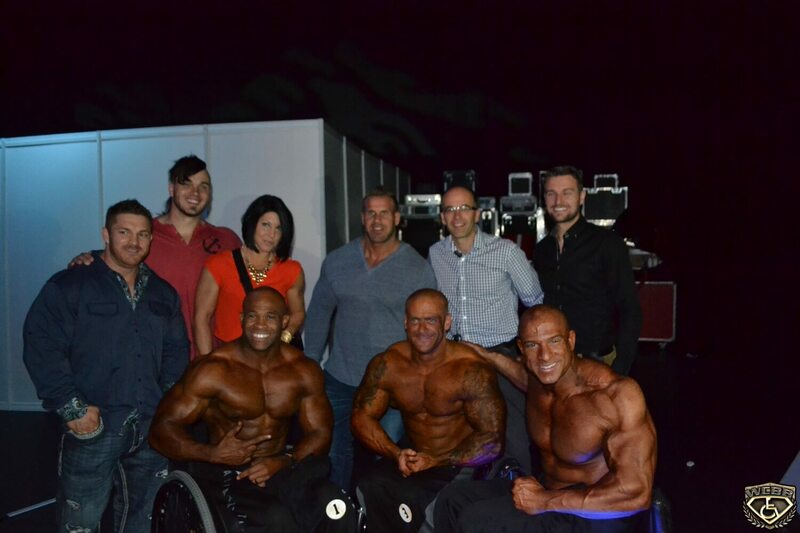 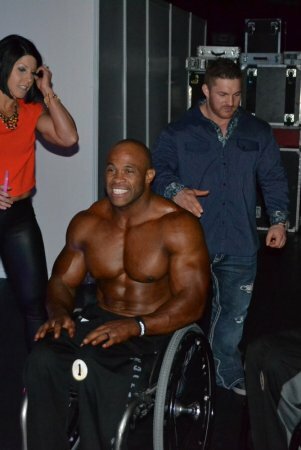 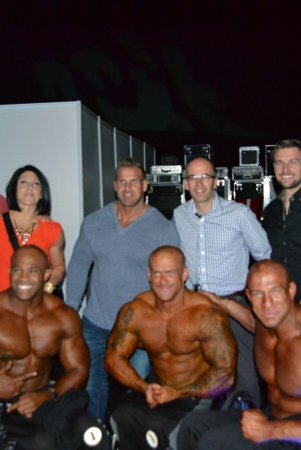 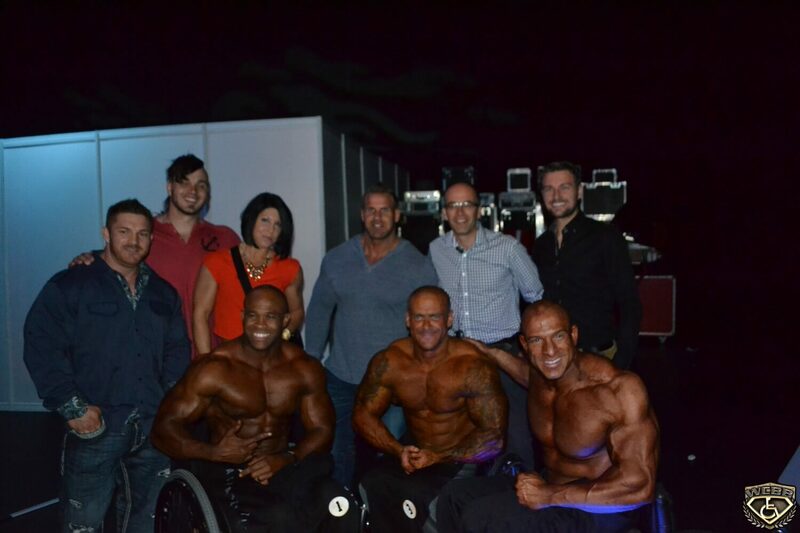 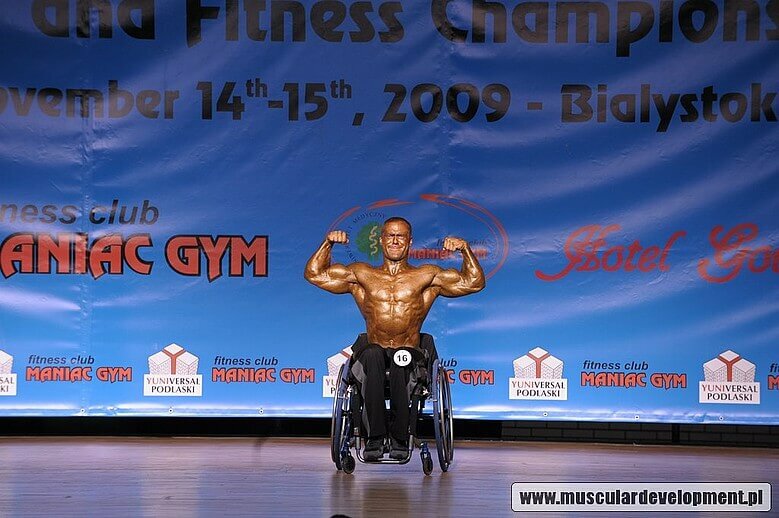 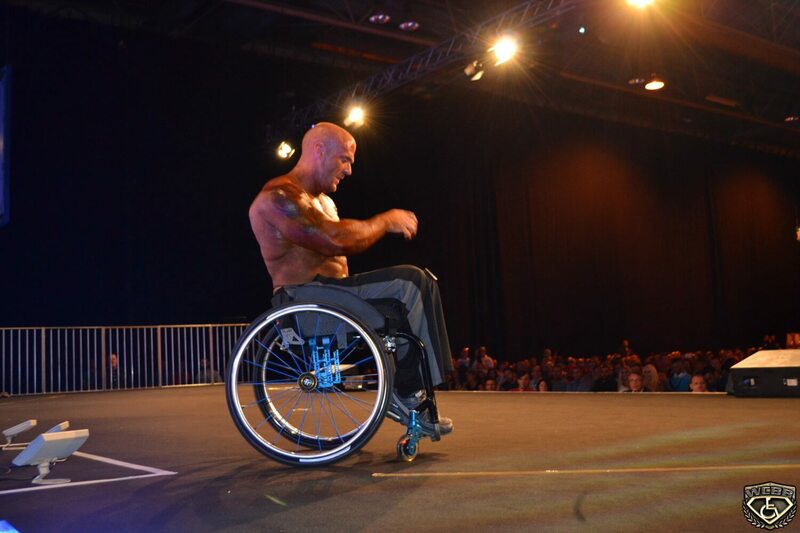 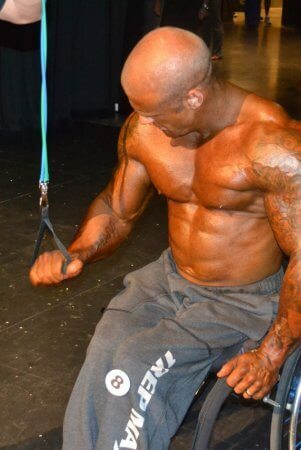 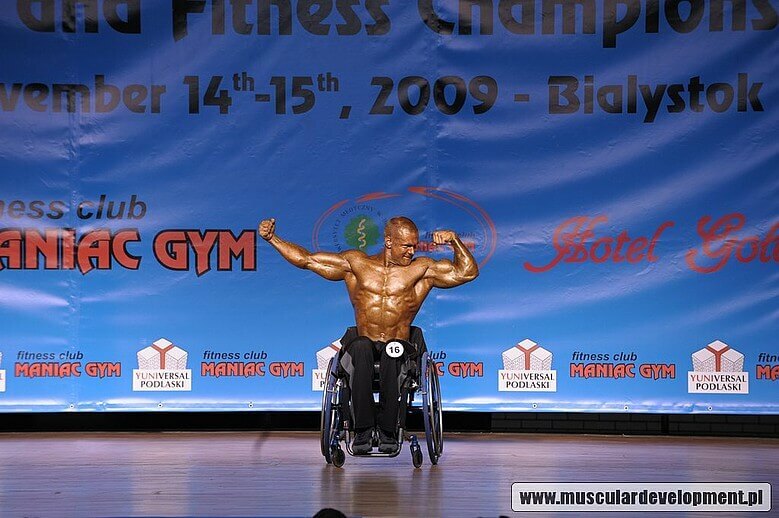 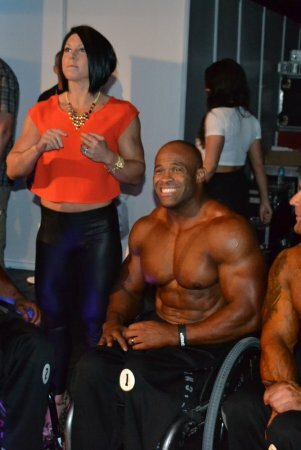 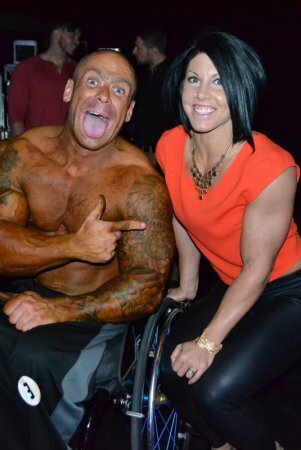 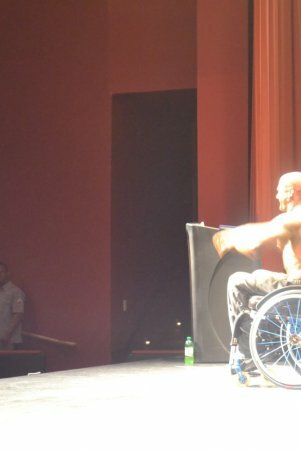 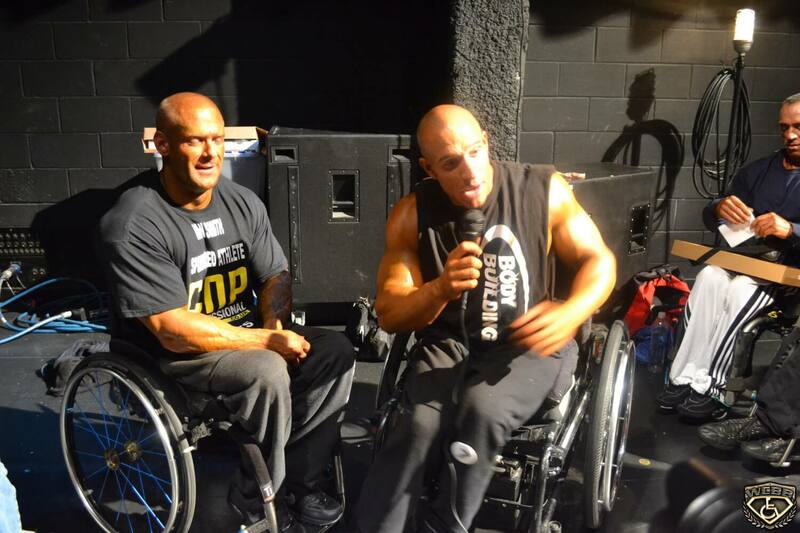 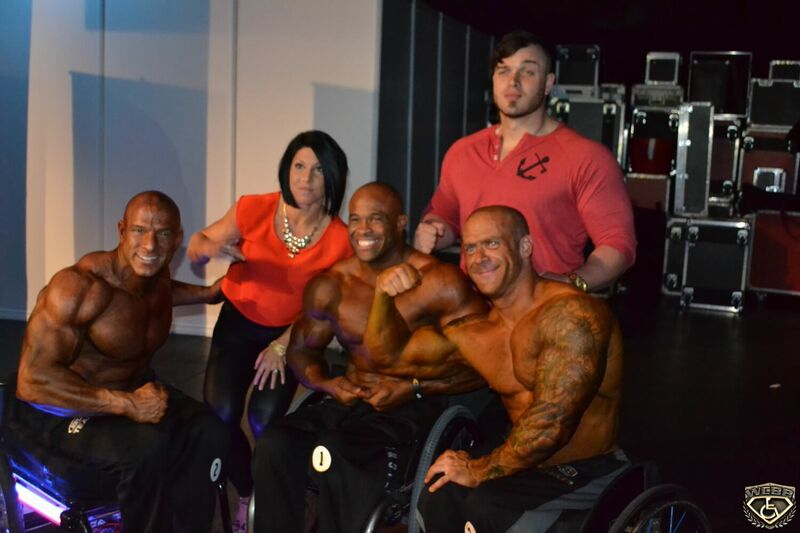 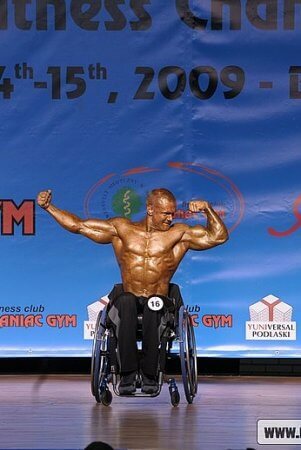 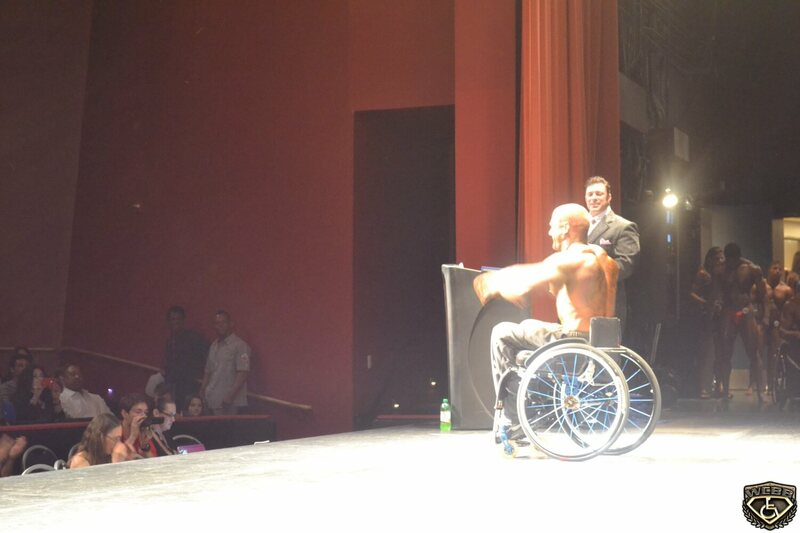 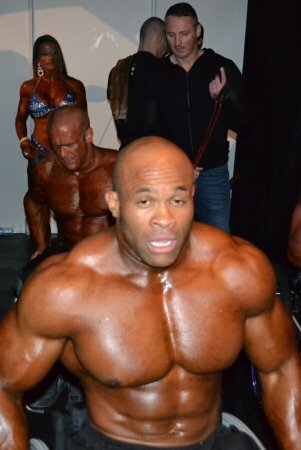 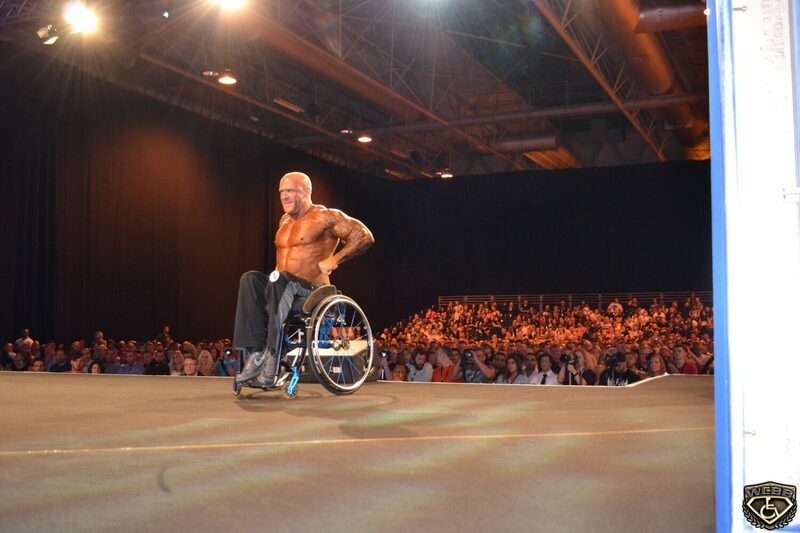 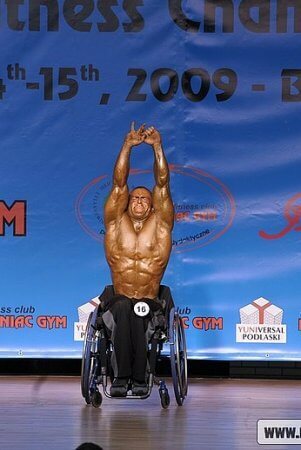 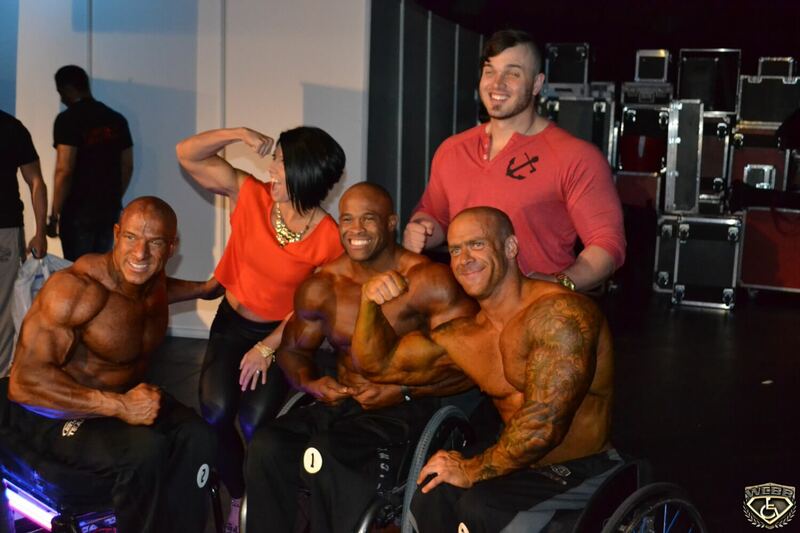 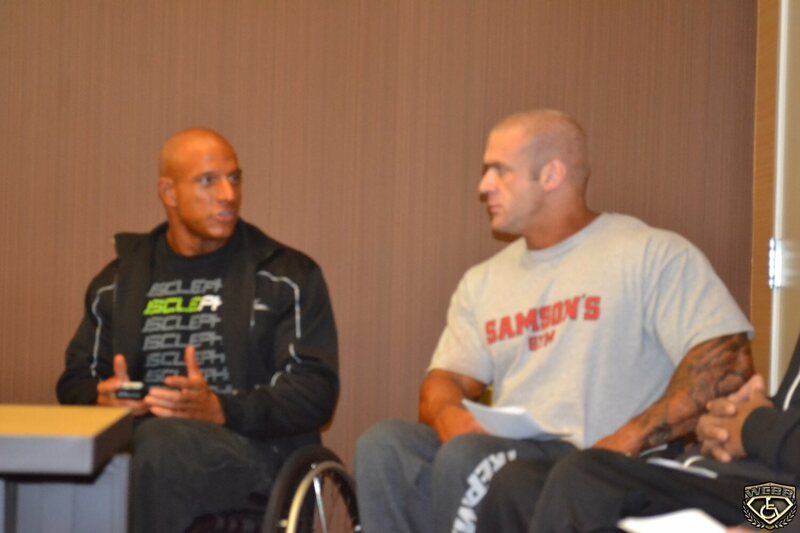 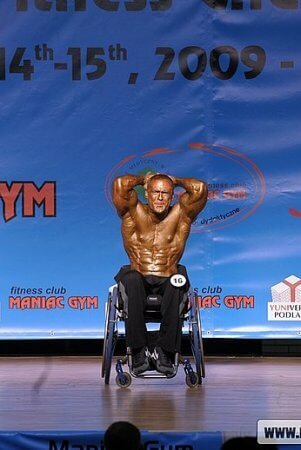 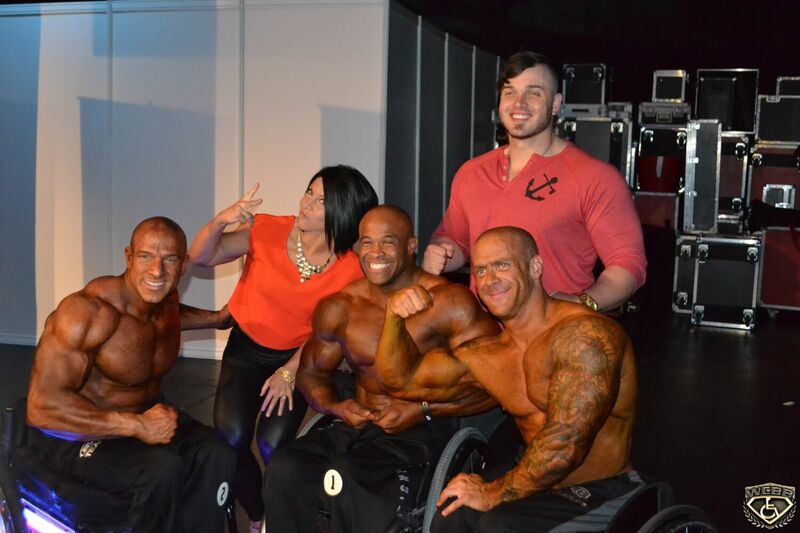 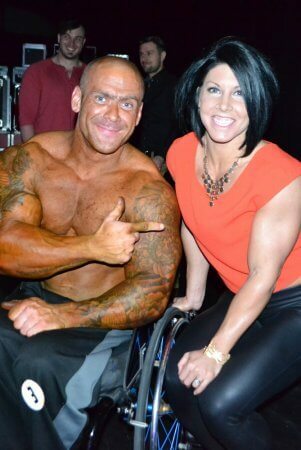 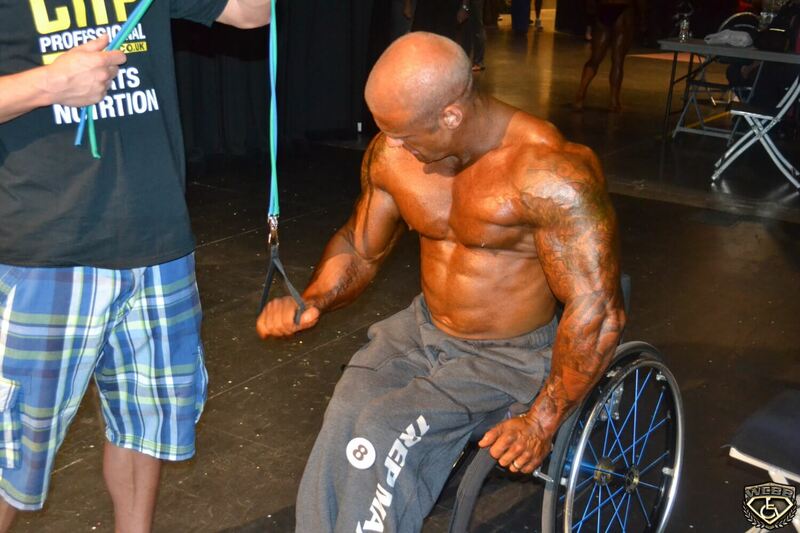 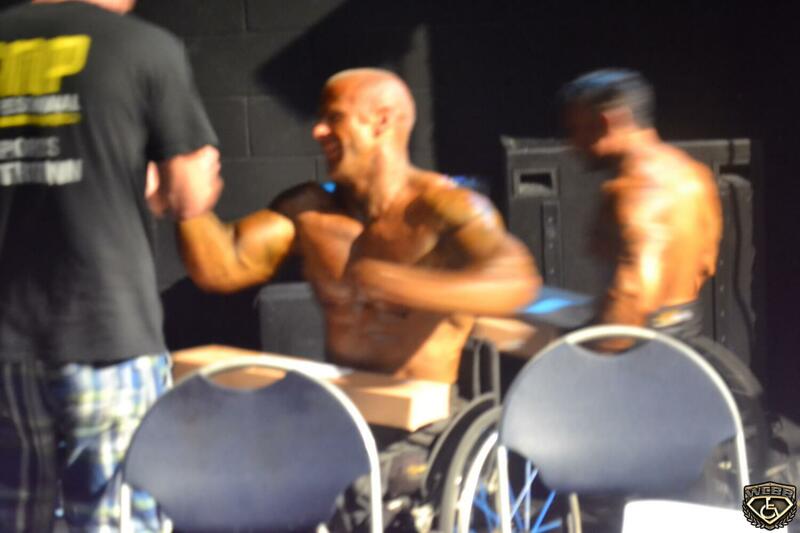 I was the asked to do a guest spot a year later and that gave me the drive to be UK's number 1 Wheelchair Bodybuilder. 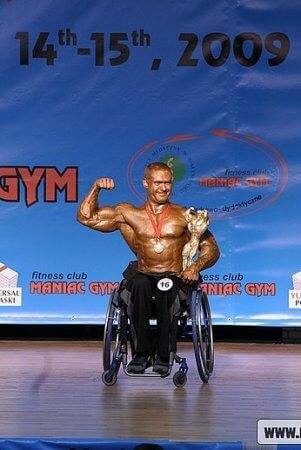 I wanted to prove that no matter what you can get to the gym and achieve your goals! 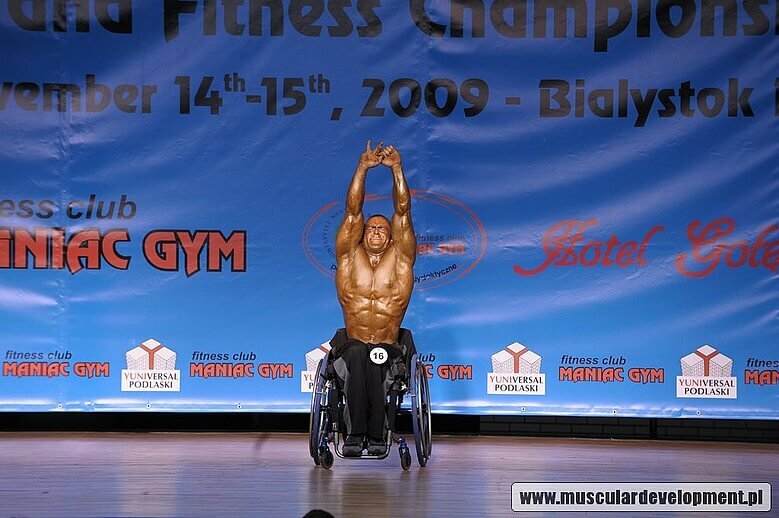 Predominantly to be the best I can be. 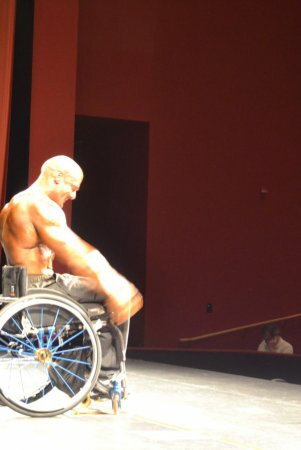 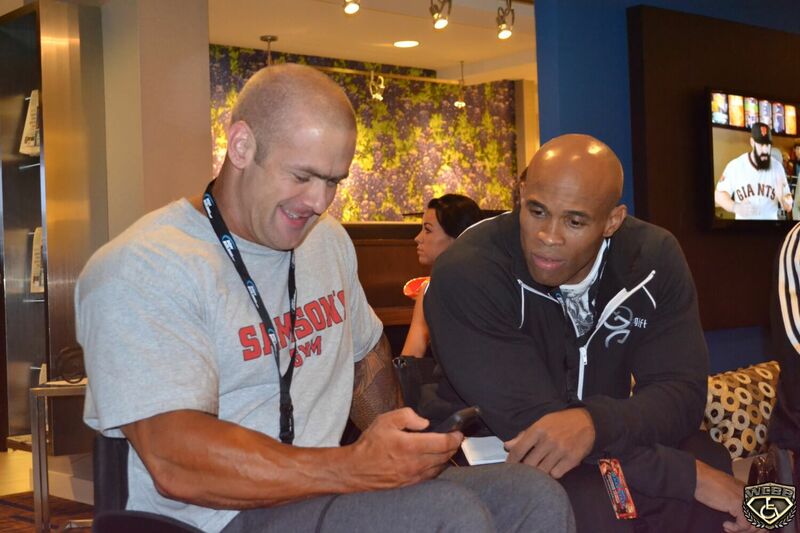 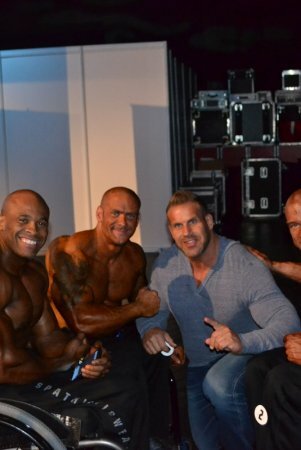 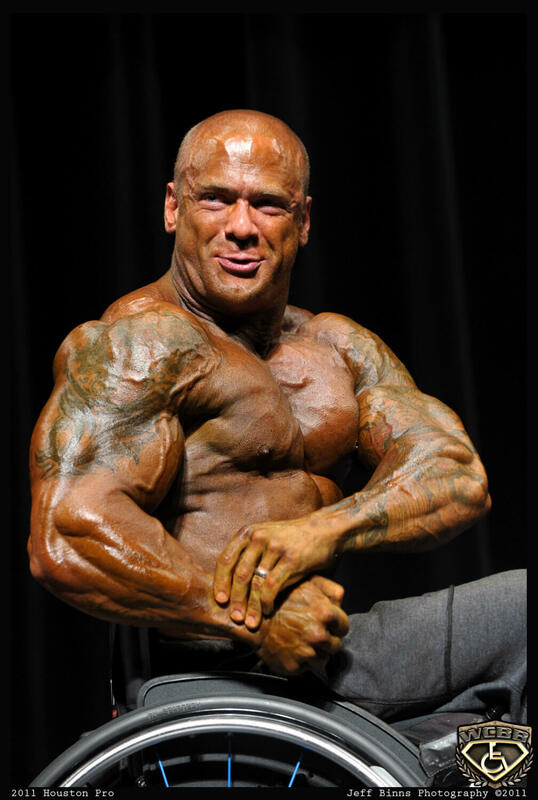 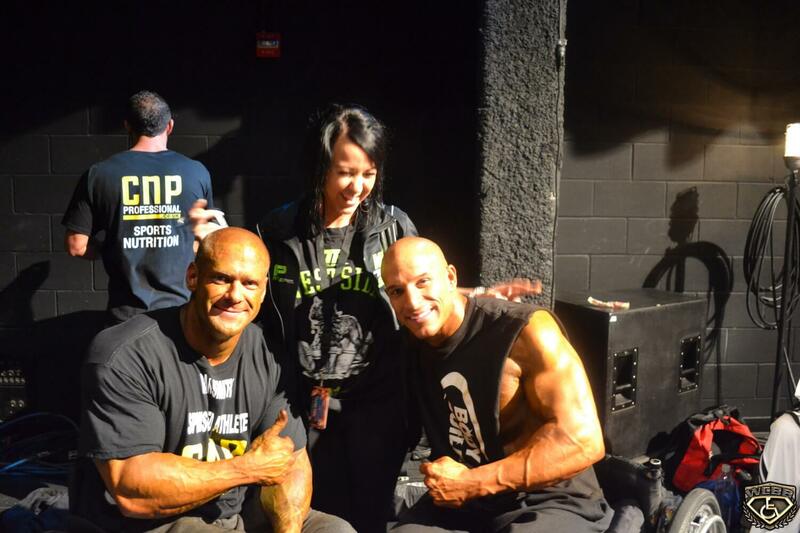 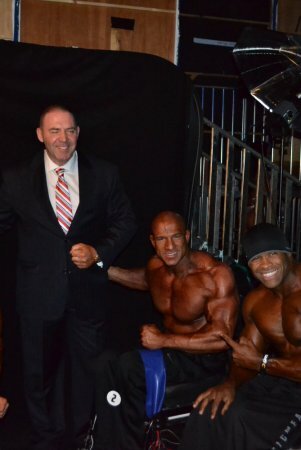 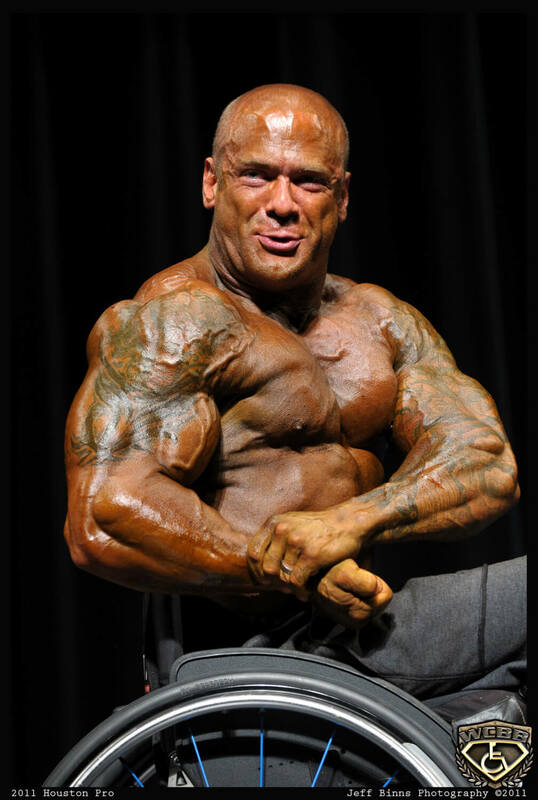 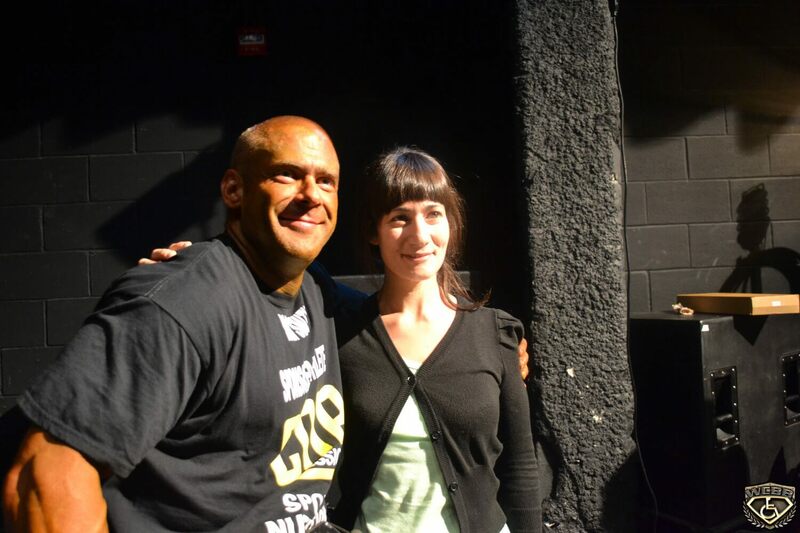 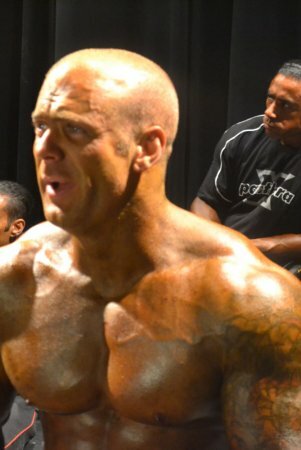 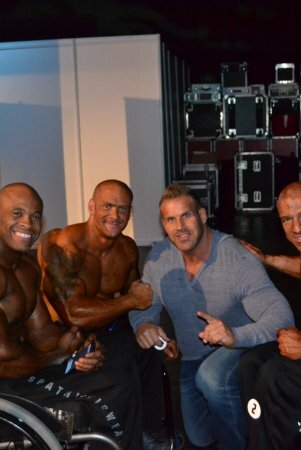 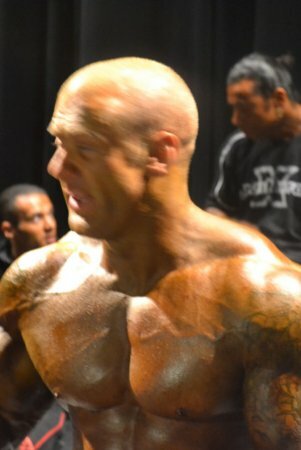 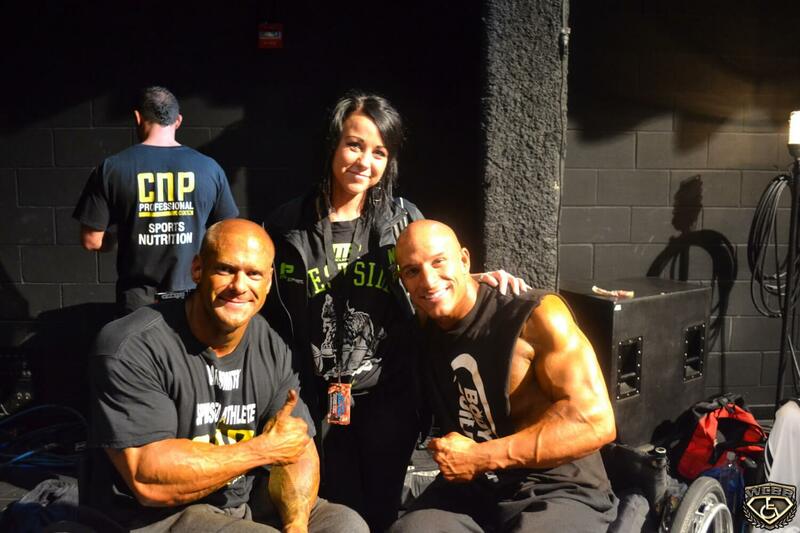 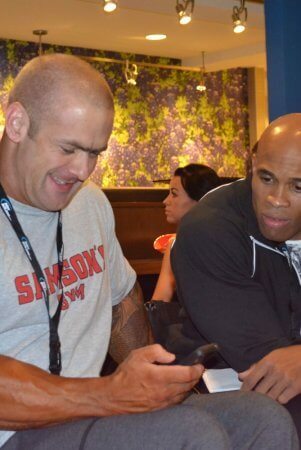 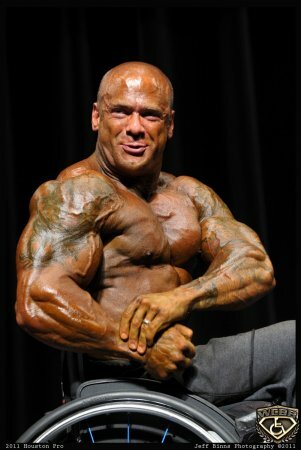 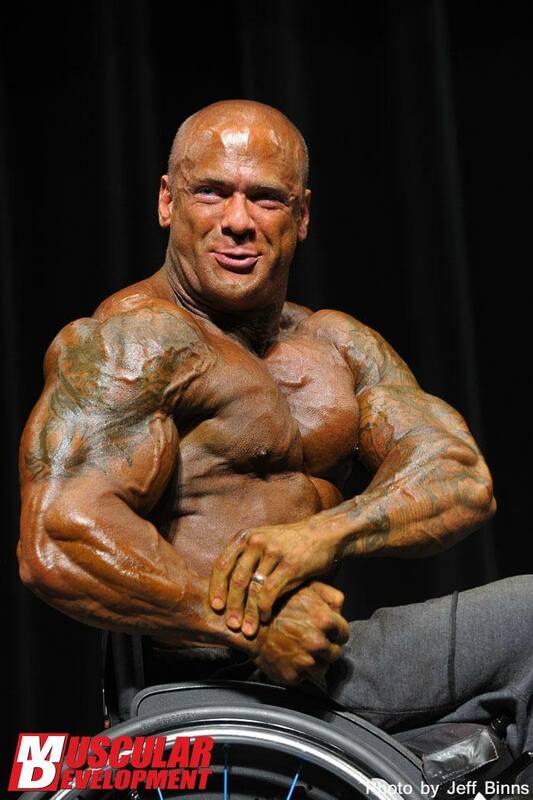 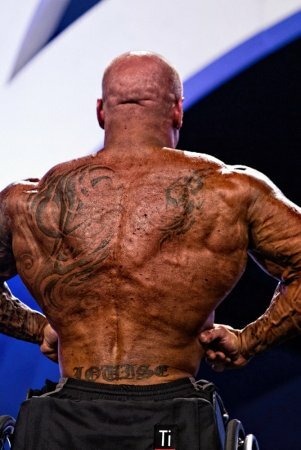 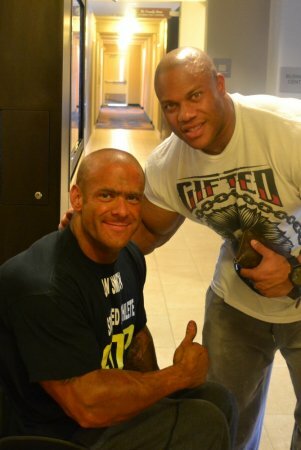 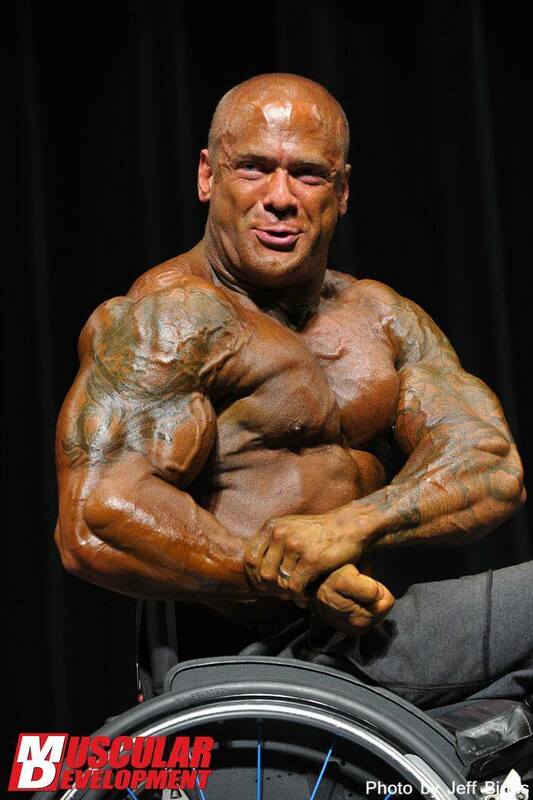 I'm also hugely motivated by the response I get from other bodybuilders and supporters. 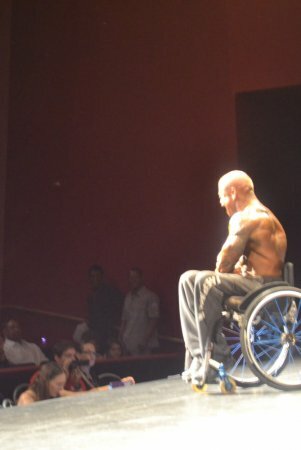 To inspire any other person is both a responsibility and an honor. 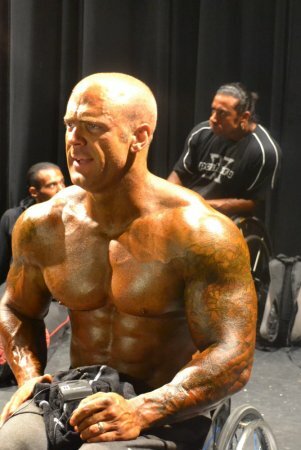 Nutrition and rest are 70 percent of bodybuilding. 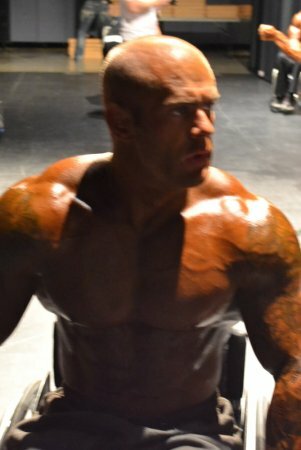 I also ask judges at shows/guest spots what they think my weaknesses are so I can try and improve for my next performance. 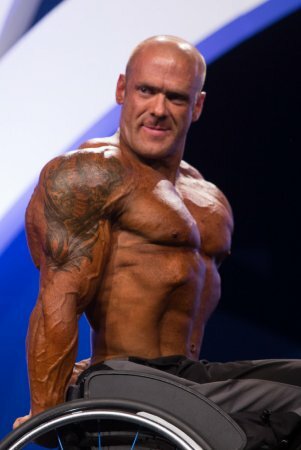 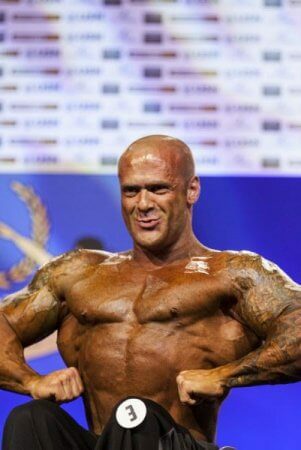 I can be contacted via email info@dansmith-uk.com for individual advice and diet plans etc.